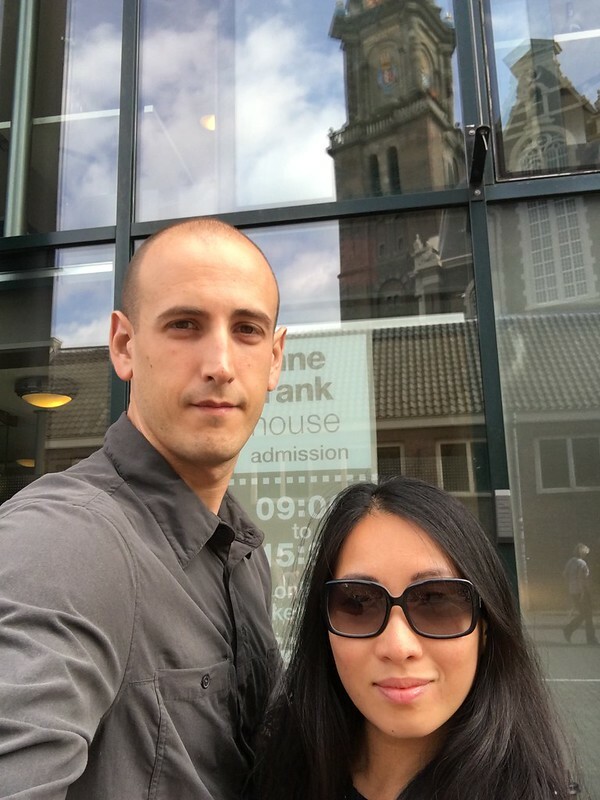 The Anne Frank House is located about 20 minutes walk from our apartment. 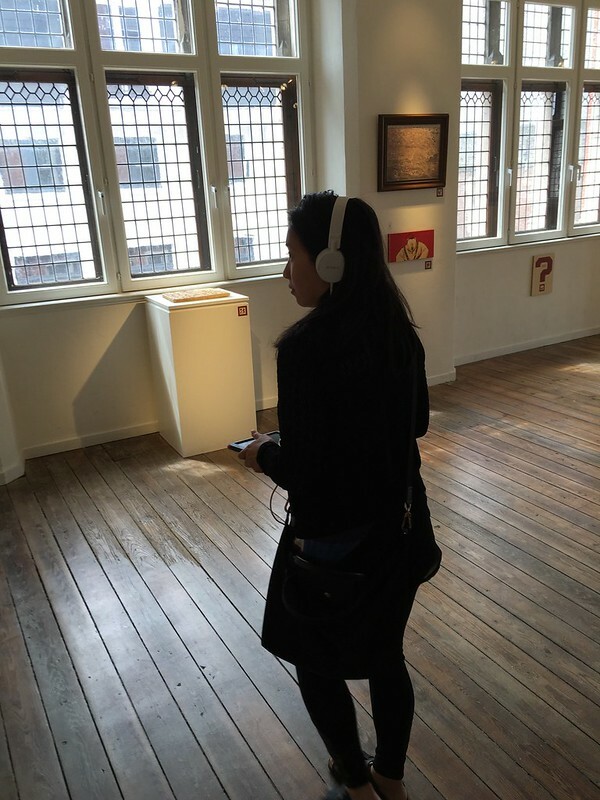 It was the house that she and her family hid during the Nazi occupation in Amsterdam. 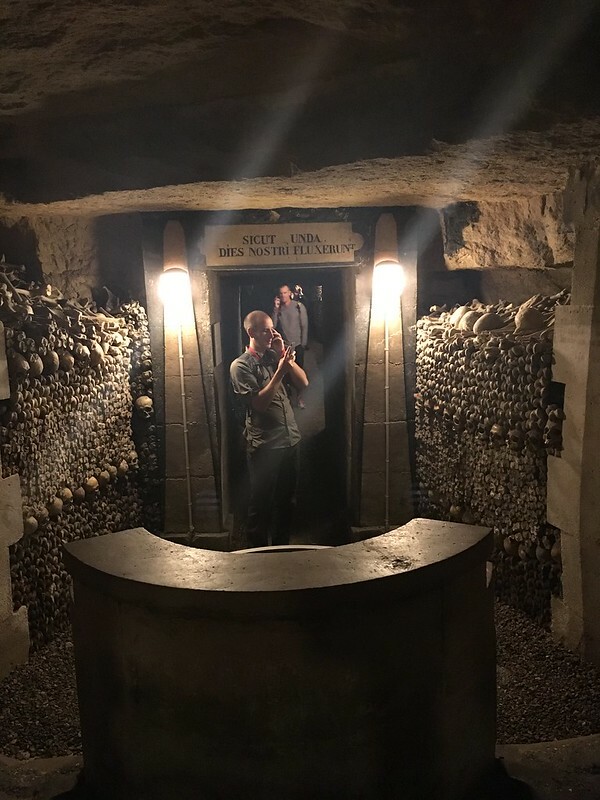 If you have read the book, you will definitely enjoy the museum. We saw the Secret Annex and all the rooms that were described in her book. It was a very sobering experience because it didn’t only talked about Anne Frank but also the history of Holocaust in Europe. During my education in Malaysia, we never studied the history of the Holocaust and WW2 in detail. My only exposure to that was reading the Anne Frank Diary. 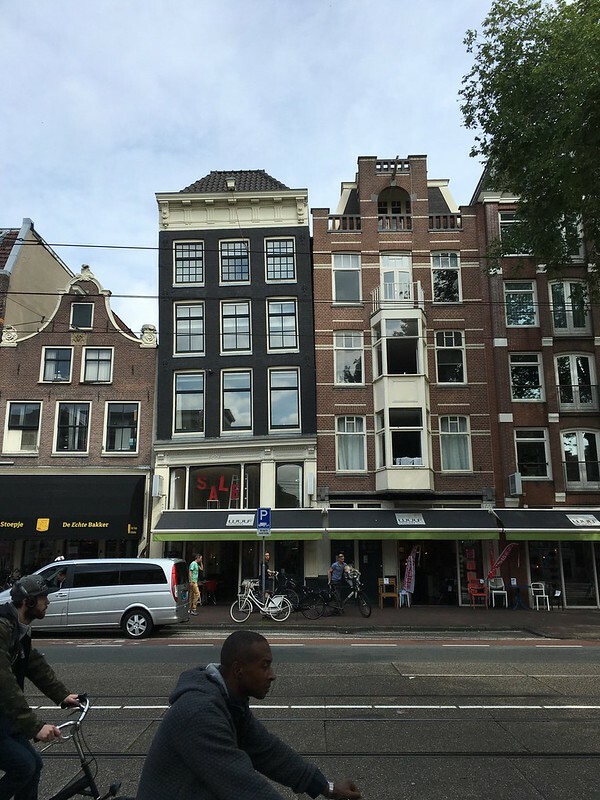 To be honest, I never really understood why the Jews did not foresee their persecution when Hitler came into power until I’ve visited the Anne Frank House. In my subjective opinion, besides the tyranny of that monster (Hitler), I believe it’s also a combination of denial, resignation and inexplicable trust placed on people of power that resulted in this massacre. Nonetheless, it was a horrible tragedy that everybody should learn about especially in this day and age. The leaders we vote to govern our country are supposed to serve us, not the other way around. In Malaysia, there is no denial that being in power is a privilege to take advantage of the country and drain all her resources for their personal benefit. 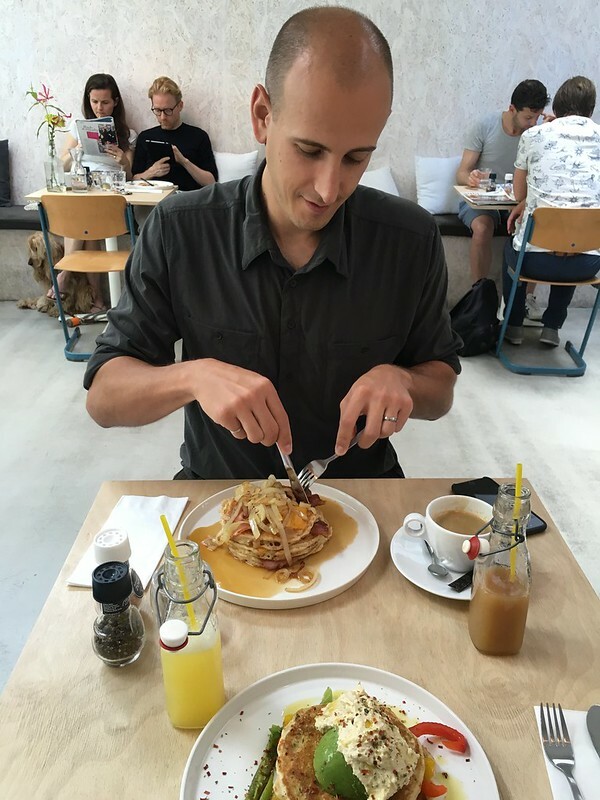 After a very serious morning, we decided to go for brunch at this little cute pancake place called Mook Pancakes. 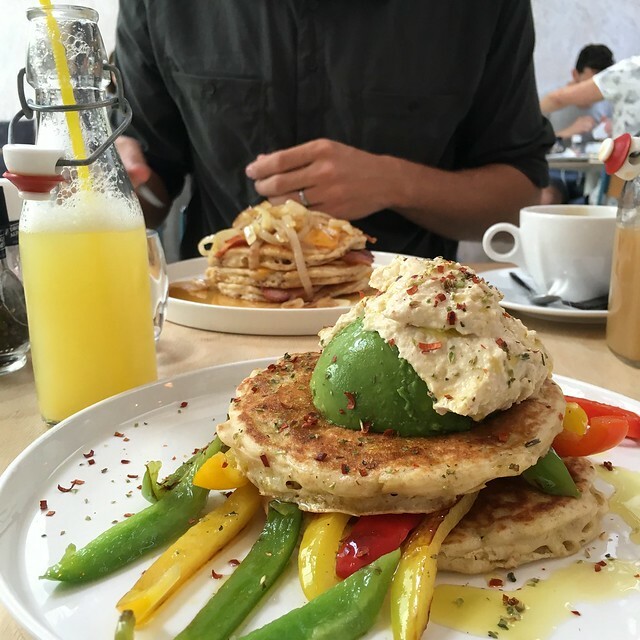 I had the Vegalicious, the complete opposite of Adam’s … Haha … It was with Avocado, Hummus and grilled vegetables. 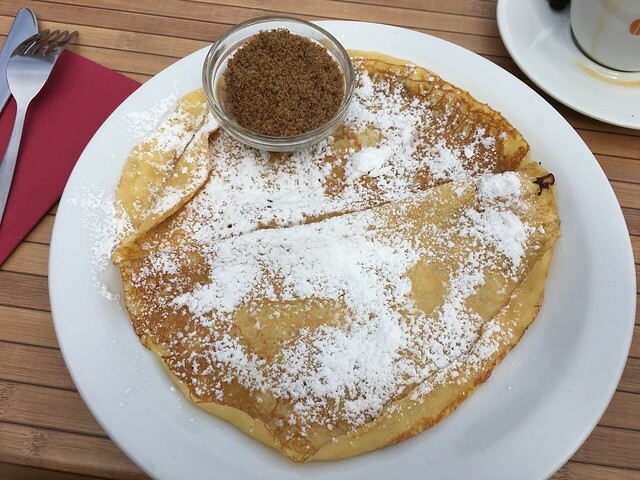 Both pancakes were very delish and filling. Definitely recommended if ever in Amsterdam. There were a lot of crooked buildings around the city. I wonder how much are they paying for their home insurance …. Smallest car I’ve ever seen.. 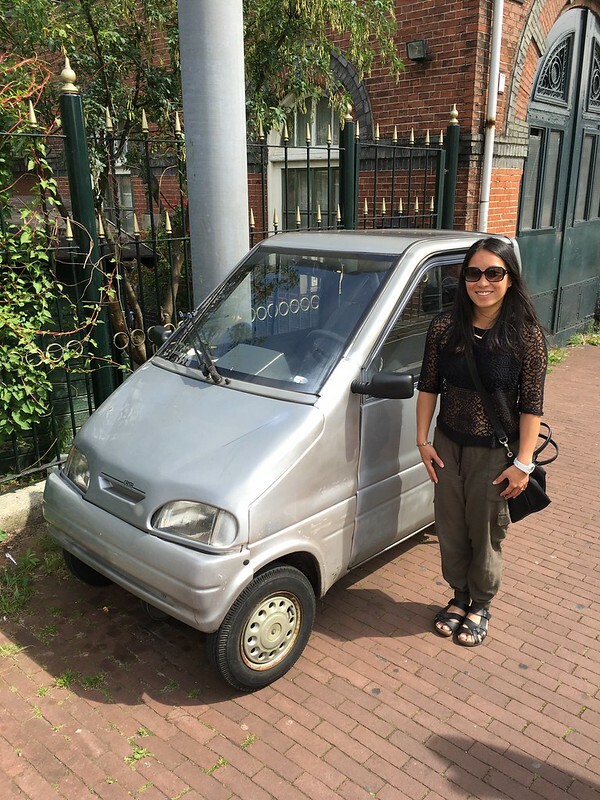 I think it’s smaller than the Smart car! 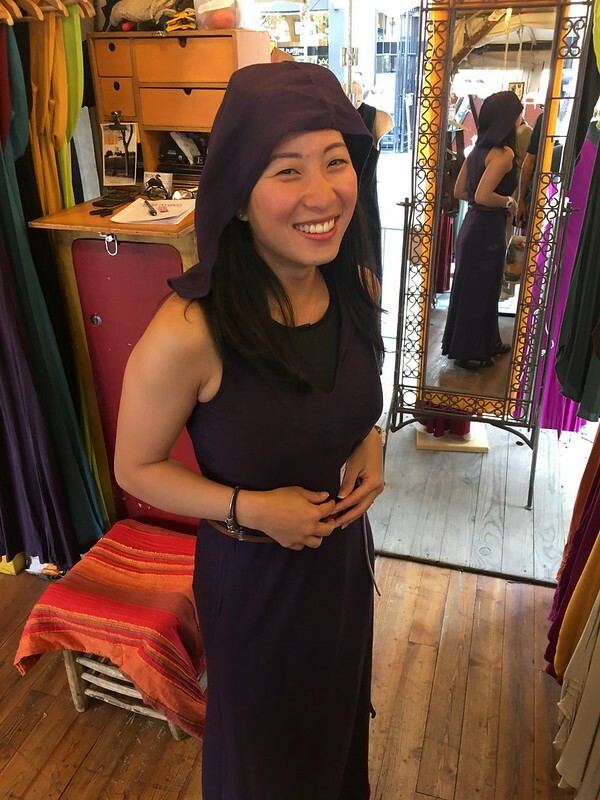 We ventured towards The Nine Streets to check out some stores. There were a lot of nice boutiquey stores but quite expensive. Wished we weren’t on a budget …. 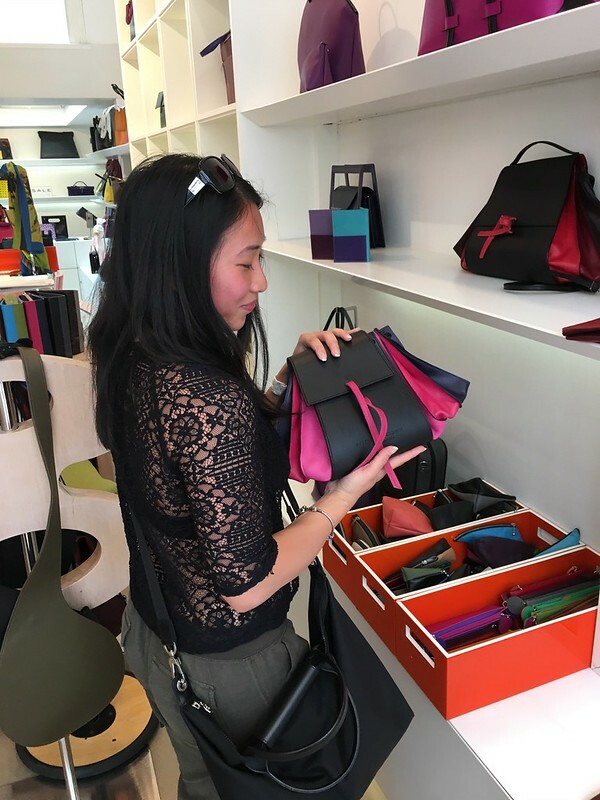 We did a lot of window shopping instead, mentally filing away stores to come back to next time when we’re NOT on a budget…. 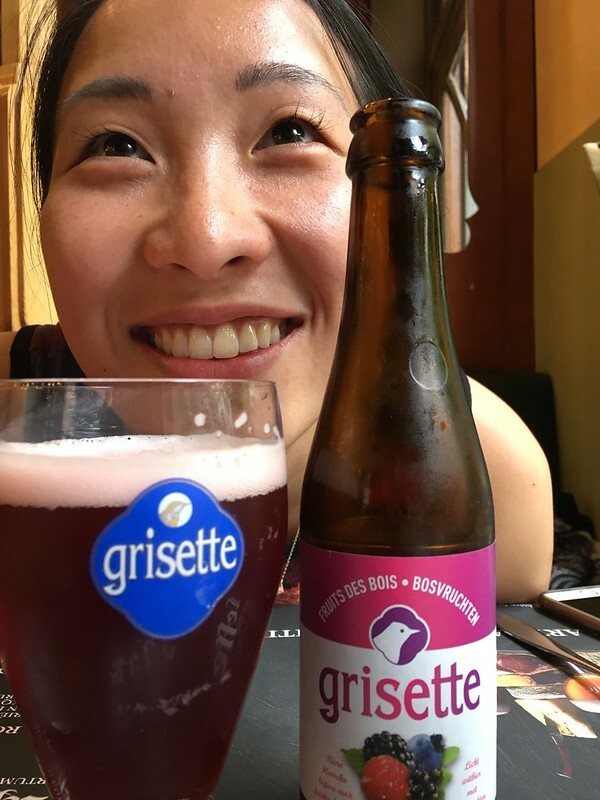 Never too early for a beer break … Okay, I do like the fruity beers… Drank more beer than I ever had in my life! 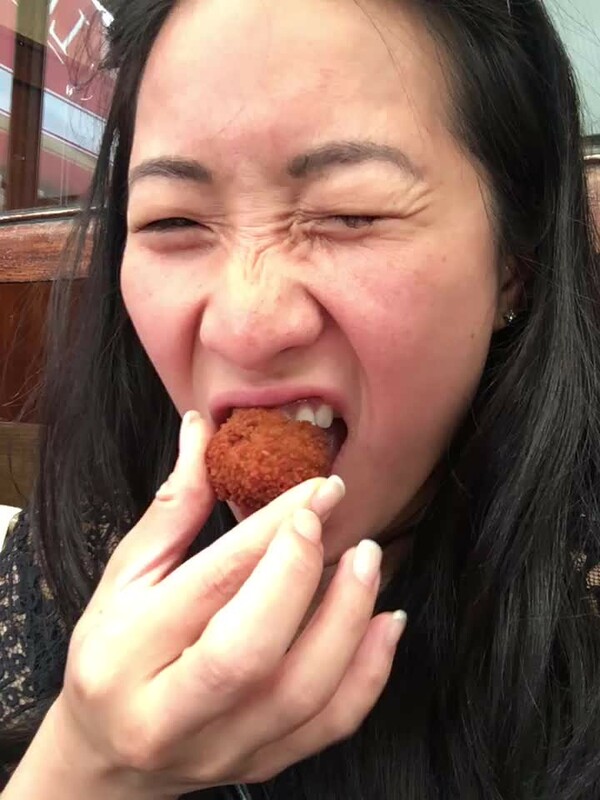 Tried a Bitterballen which is a typical Dutch delicacy. 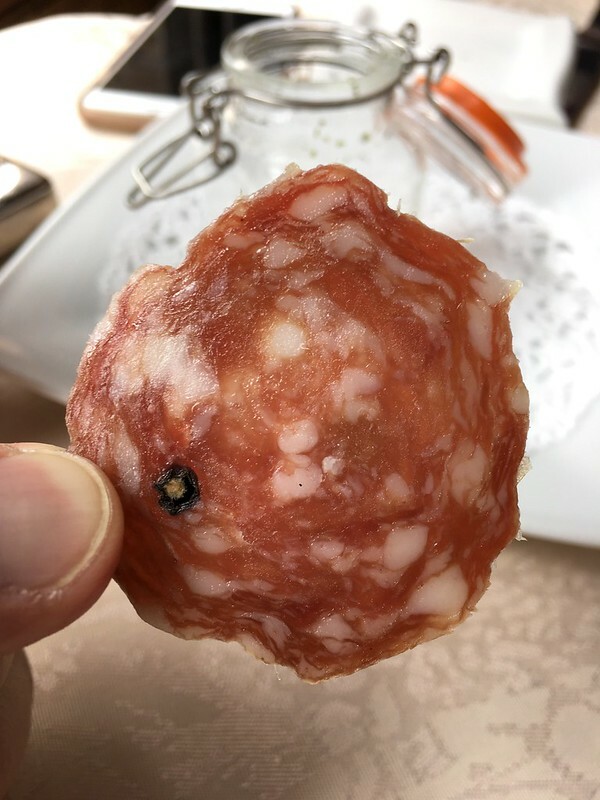 It’s a kind of like an arancini minus the rice. It’s a tad rich for my taste. We bought a couple old map prints as souvenirs. I can’t imagine if you actually want to procure their services can do so discreetly without having hundreds of people staring at you entering the room. But hey, people still do so! Saw one dude coming out of a room and several fingers pointing at him. Haha. I’ve been itching to get my nose pierced for some time. I had my nose pierced about 4 years ago when Myron convinced me to do it. It lasted about 2 weeks cause it got badly infected…. But I’ve always loved how it looked and so I decided to get my nose pierced again in Amsterdam. Selected the location of interest …. Unfortunately, this nose piercing lasted even shorter than my previous one …. It popped out when I rubbed my nose and I couldn’t put it back in again. Argh. I was too chicken to re-do it again cause of the needle …. However, I wouldn’t rule that out ….. Maybe in the future …. 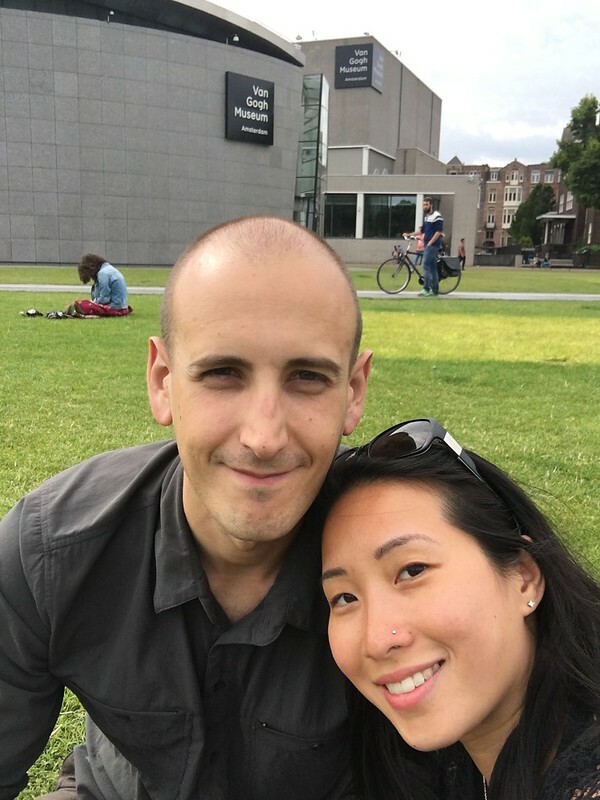 With my new nose, we headed towards the Van Gogh Museum but unfortunately it was already closed when we got there. We settled down at the park anyway and watched a bunch of guys play football. 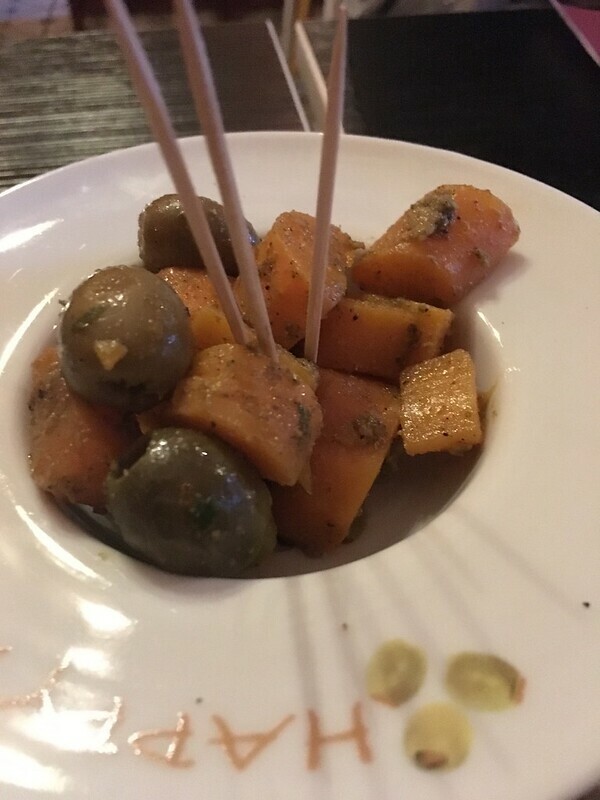 We picked a random Spanish restaurant for dinner and had some tapas. I wish I could remember the name of the restaurant cause the food was actually very good. I should start making notes about the places we visited cause writing about it post 2 months of intensive travel can do a number on your memory. The scallops were huge and fresh. So decadent in butter sauce. 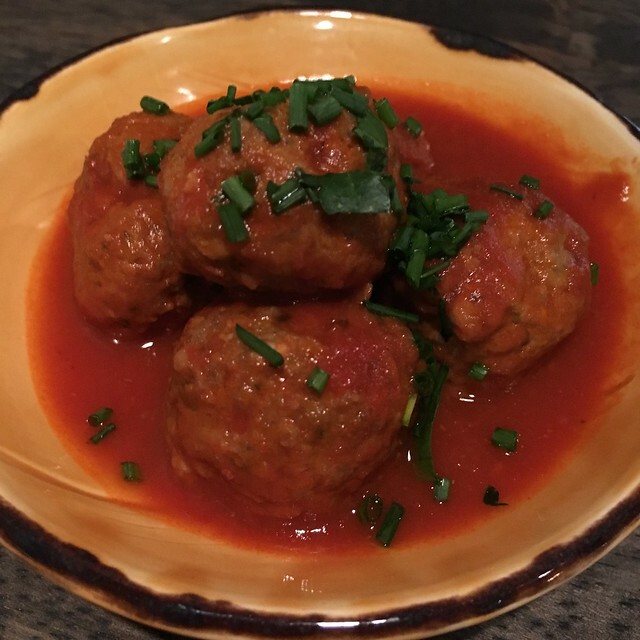 Lamb meatballs that were as flavourful as it’s colour. We did more exploring around the city and went home around 10 pm. 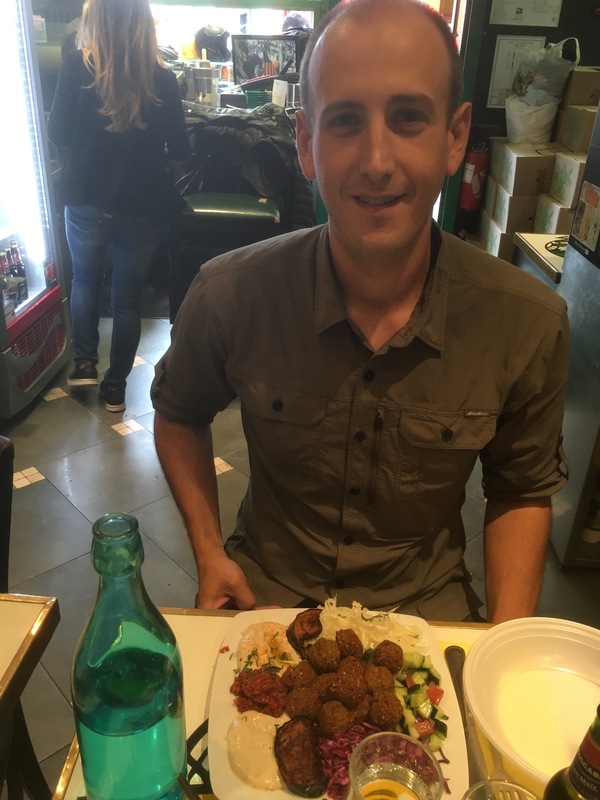 There was a Lebanese restaurant right by our apartment and Adam couldn’t resist getting another dinner. 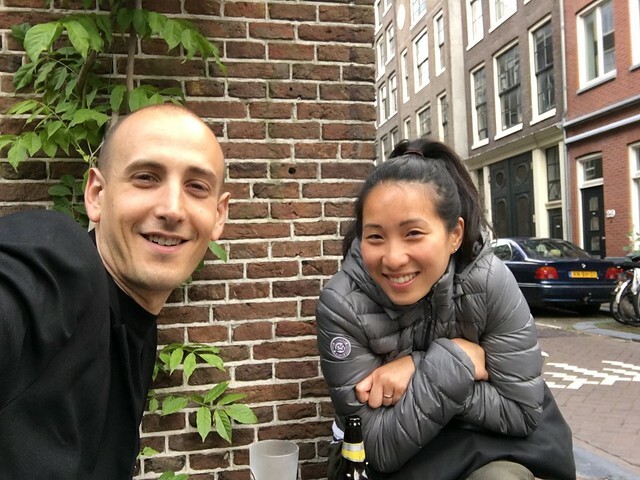 There’s a funny story with our AirBnB place in Amsterdam. When we booked it, we assumed we were sharing the place with the owner. When we showed up, we had to pick up the keys from the cafe next door cause the owner wasn’t home. We let ourselves in and there was a list of instructions and suggestions on the table. It had every information we needed for the stay. First night comes around, we still haven’t met the owner. By the second day, we thought maybe the owner doesn’t stay in the apartment if he had guests over and so we thought we had the whole place to ourselves. On the following night, we were hanging out in the kitchen and chatting with a friend on Skype. I told Adam, maybe we should talk in the room instead. 2 mins after we moved to the room, we heard the outside door opened and someone walking in. We didn’t leave our room cause we weren’t erm, decently dressed…. We figured, we’ll meet him the next morning before we leave for Frankfurt. Next day came along and no one was home! Oh well, there was nothing to complain about it but it was our first time renting an AirBnB place without meeting the owner. The way this guy had it set up works well for him especially if he does not want to interact with his guest. We definitely had no complaints about his place and him. Works for all of us! Getting back to work …. 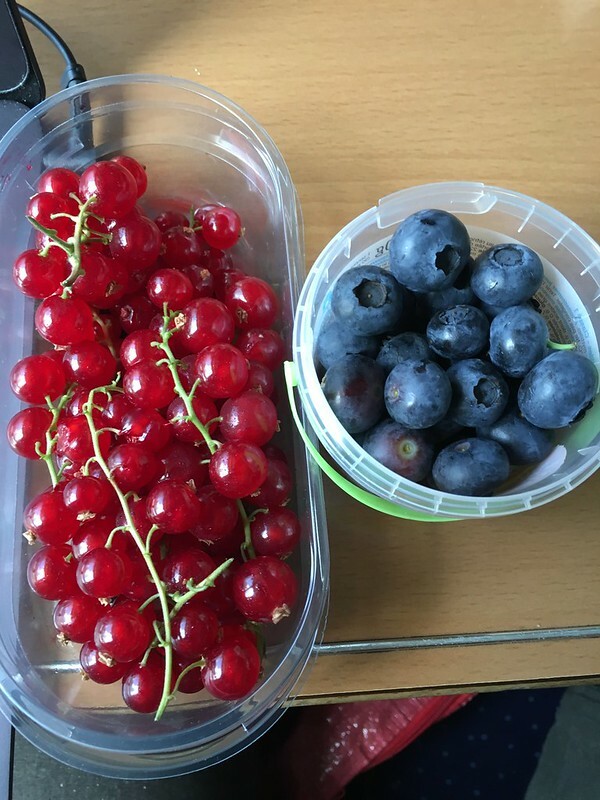 Picked up some currents and blueberries for breakfast. Dutch berries are the best I tell ya! 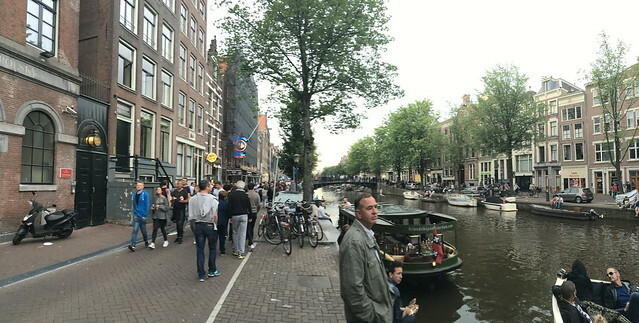 So far, I’d say Amsterdam is one of my favourite cities. 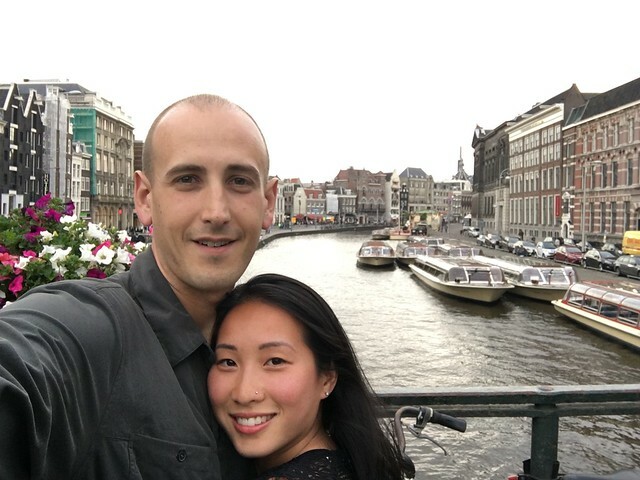 The people are nice and we haven’t seen so many good looking people in a city like Amsterdam. 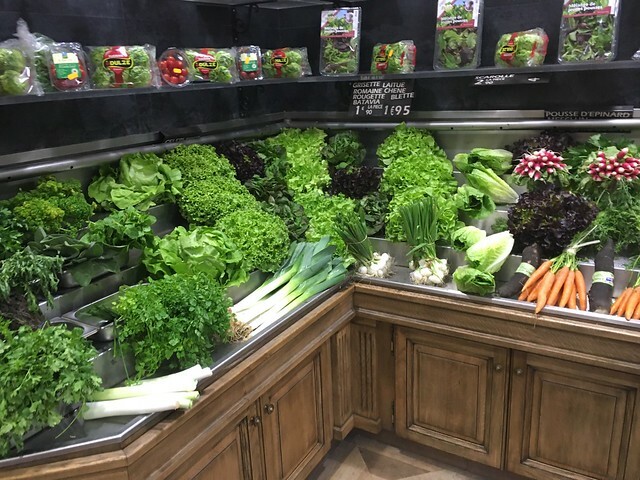 The food is great and have a lot of varieties. 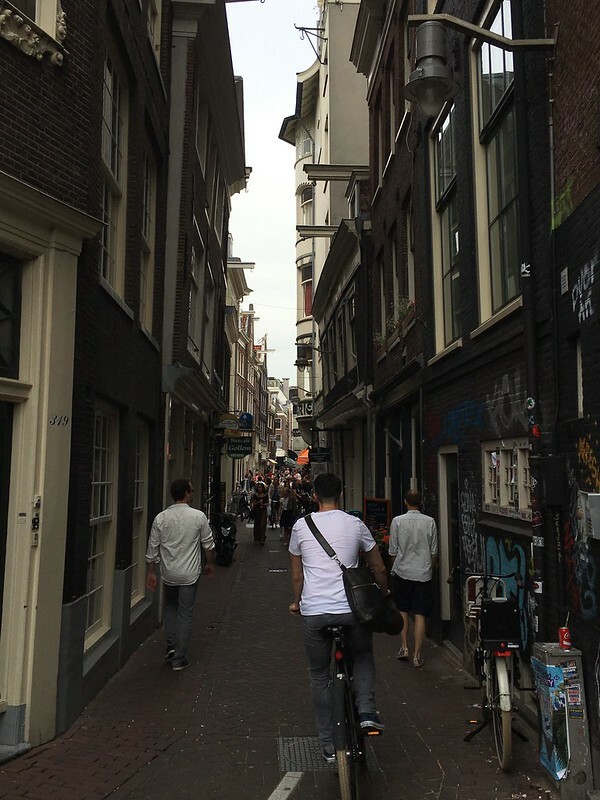 The city is beautiful, clean and doesn’t feel as cramped like other European cities. I even told Adam that I would consider moving there as long as he can get a job there =P Initially we didn’t realized how much Amsterdam had to offer until we got there. We only spent 2.5 days there and it wasn’t even close to scratching the surface. 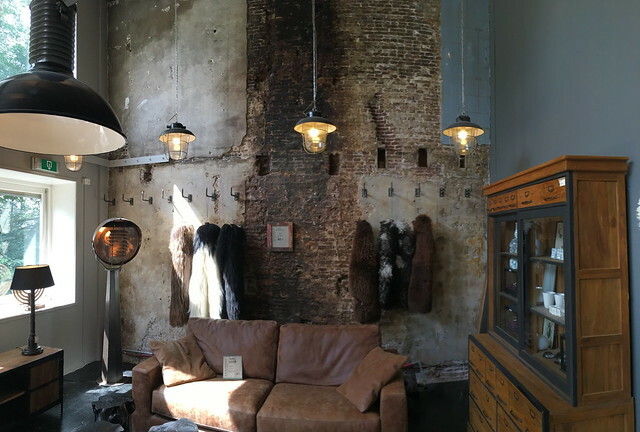 Our impression of Amsterdam is definitely more than just Red Light District and space cakes. Next time, we’ll be back for more! Next up, Frankfurt – Germany! 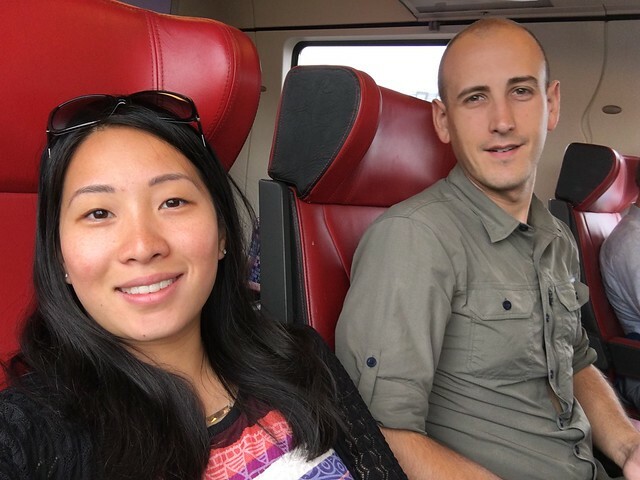 After a dramatic attempt to send the parcel (which arrived in Edmonton damaged due to very sketchy wrapping – our porcelain bowl from the English potter broke ), we finally boarded the 1045 am train to Amsterdam. Train rides are for updating the budget spreadsheet and drinking instant coffee. We spared no time scouring the Internet, looking up reviews and choosing the best place. It was certainly difficult picking a place cause there were so many to choose from. Each place had both good and bad reviews, some better than others of course. It also depends if they’re located in touristy areas or not. We wanted to avoid the touristy ones and so we ended up picking one that was not really in the tourist zone. 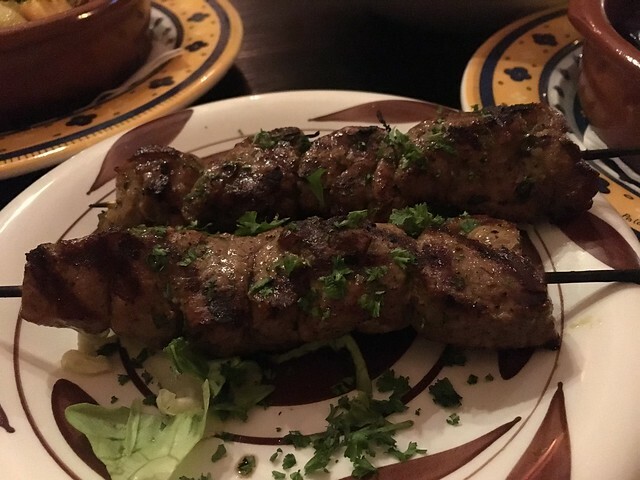 There were mixed reviews about this place but we were eager to try it as we had never had it before. We used Google maps to map our route and it was about a 40 minutes walk from our Airbnb. 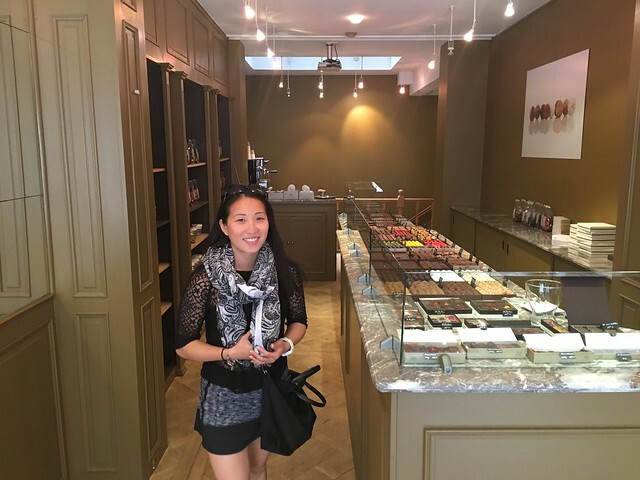 We were really excited cause we’ve heard from friends that it’s a must try in Amsterdam. 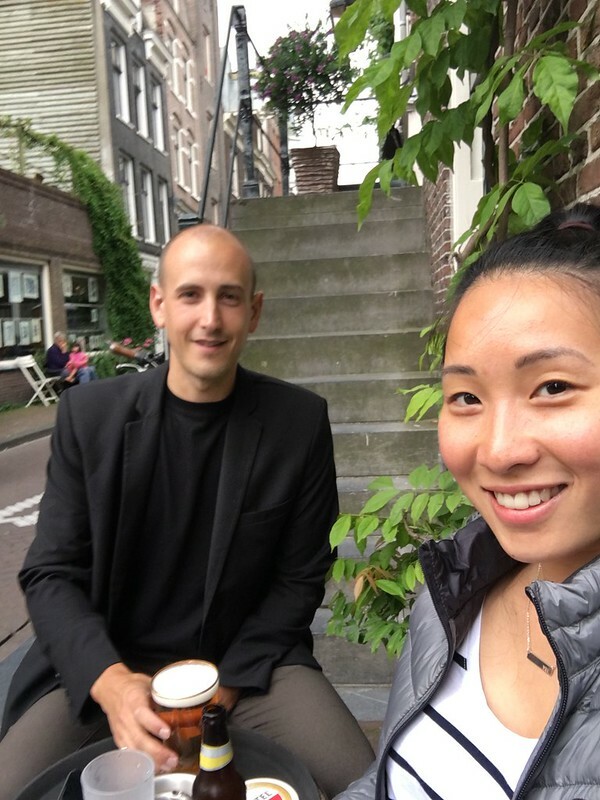 A friend of mine spoke very highly of his experience and us, being very curious people decided that we must do it on our first day in Amsterdam. After all, it’s best to experience it when you’re hungry 😉 We found the place and it was quite busy. In fact, we had to share a table with another couple. They gave us a menu and it was so difficult to choose cause there were many choices. Adam wanted the one that had more varieties but I wasn’t sure if we could handle it. In the end, we picked the set that had a good amount and boy, it was incredible ! Alright, I’ll stop here. 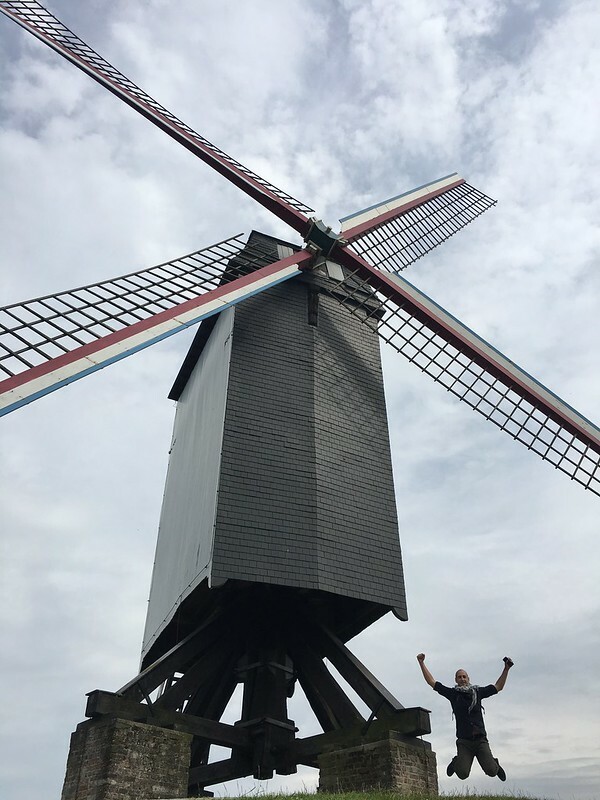 You’re probably thinking of the first thing to do when in Netherlands …. Heh, I’d love to say yes but, it was actually Indonesian food that we were looking forward to try. 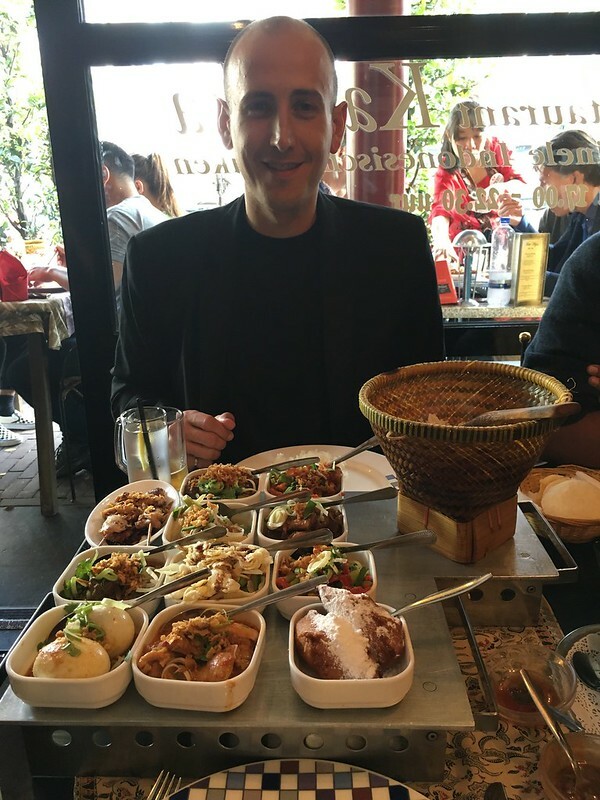 Indonesian food is very popular in Netherlands due to the history of Dutch colonialism of the Indochina region. We went to Indonesisch Specialiteiten Restaurant Kartika for an early dinner. They have set menus that included a sampling of Indonesian dishes. 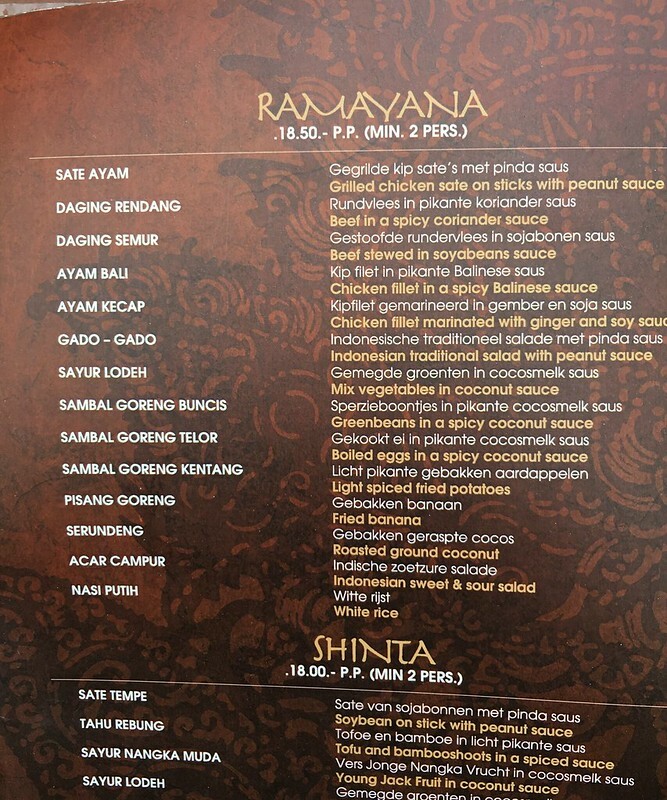 We ordered the Ramayana set for 18.50 Euros per person. We started with some Emping (on the left). Emping is a type of Indonesian chips, a bite-size snack cracker, made of melinjo or belinjo (Gnetum gnemon) nuts (which are actually seeds). We get that in Malaysia too, especially during Chinese New Year. Once you start, you can’t stop. On the right are fish crackers. 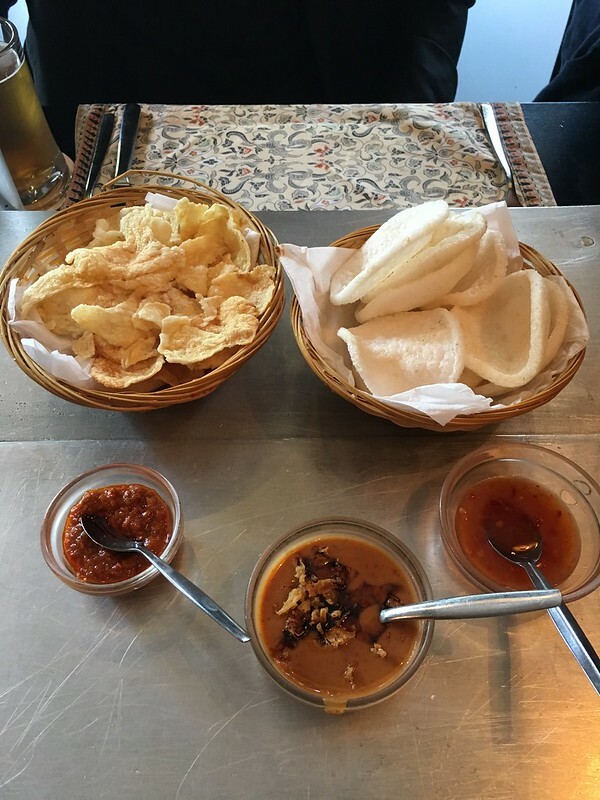 Sauces from L-R : Sambal, Peanut sauce (Adam’s kryptonite), Sweet Chili Sauce. Adam wanted the set that had more food but I’m glad his argument wasn’t persuasive enough cause this set was a lot of food! I love Indonesian food! The flavours are very refined and so tasty, especially with rice! We devoured each bite with OOmmmph and MMMmmmph pretty much the whole hour. We highly recommended this restaurant and advisable to book reservations. We were lucky to get seated without one and had to share the table with another couple. We didn’t mind it because we got onto some interesting conversations with them and exchanging stories about travels. I swear they must put drugs in the food cause we left the restaurant all food comatose. I was walking like a zombie, eyes barely opened and brain dead. Effects of overeating I supposed 😆 We stumbled upon a travel store and Adam got some travel shirts. You know, the ones with tons of pockets to confuse the odd pickpockets. Then, we kind of wandered around the city to get a feel for it. 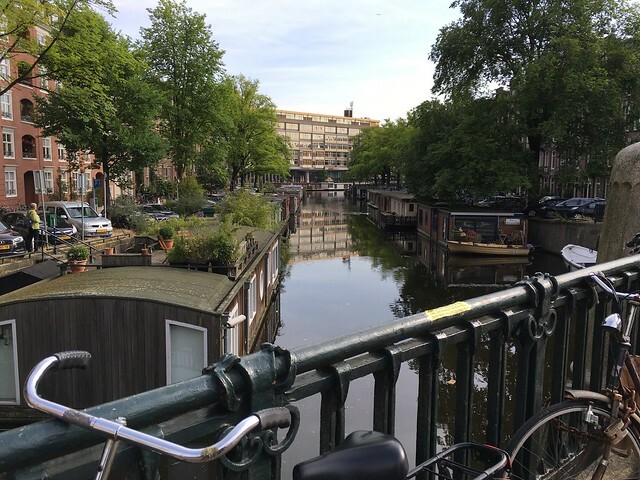 It was quite challenging navigating through the streets and sidewalks because there are separate lanes for bicycles, vehicles and pedestrians. We had several close calls from getting rammed by cyclists. They are everywhere ! Funny enough, I like that about Amsterdam. It’s such a bicycle friendly city, feels clean and safe. Before calling it a night, we decided to stop by a pub around a pretty street corner. 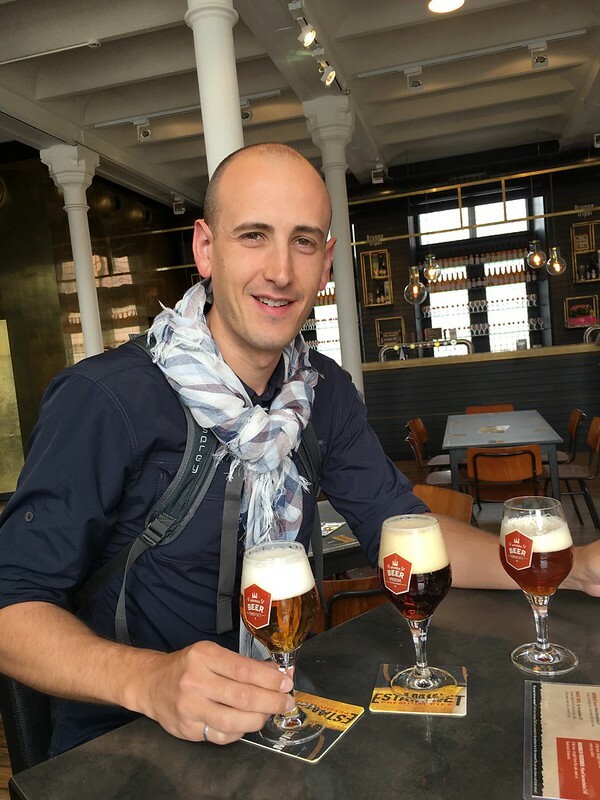 Tried some Dutch beers. Normally, I don’t really drink beer but I actually liked the Amstel Light. It was refreshing and doesn’t have a strong malty flavour. 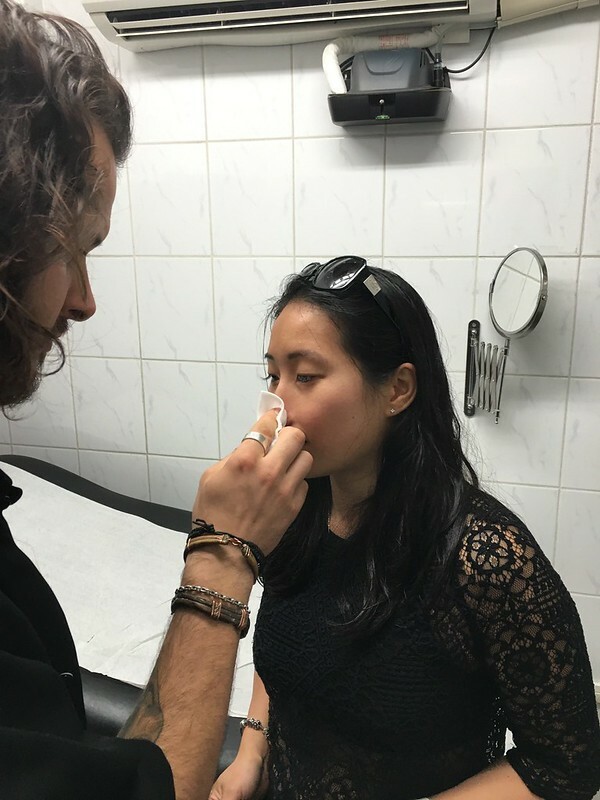 Next up – Why I decided to pierce my nose (again) …. We awoke from a restful sleep with enough time for a leisurely walk to the train station. July 7th marked the start of our 1 month (plus 5 free day) Eurail Pass. 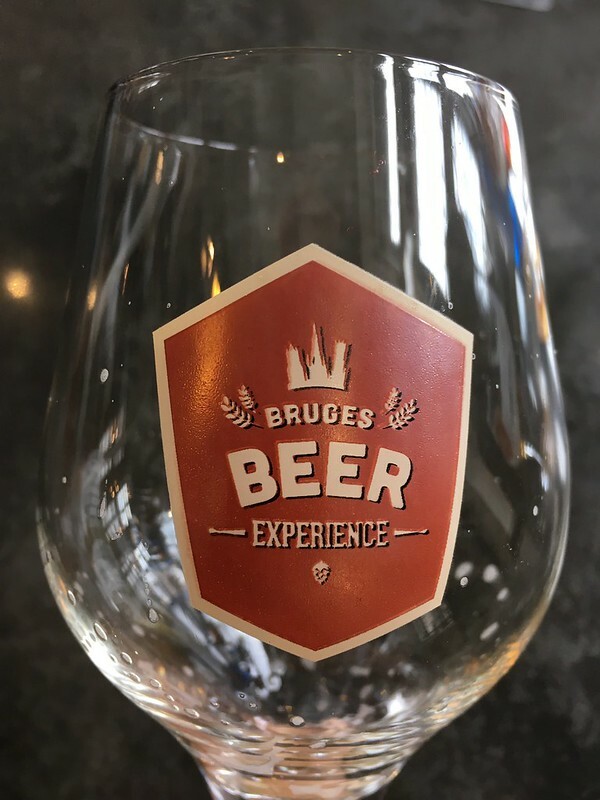 Our inaugural journey would take us to the highly anticipated city of Bruges. 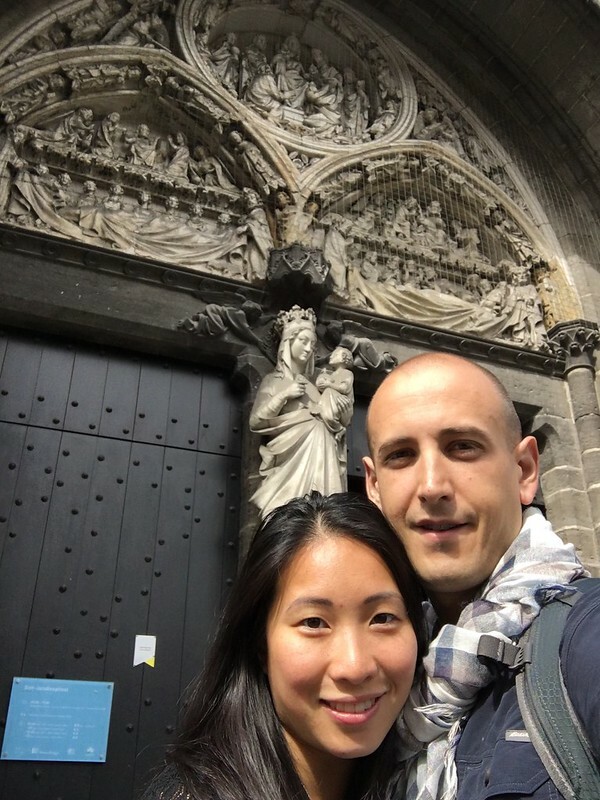 We purchased the Eurail pass a few months earlier after some careful research, mostly credited to Rachel. 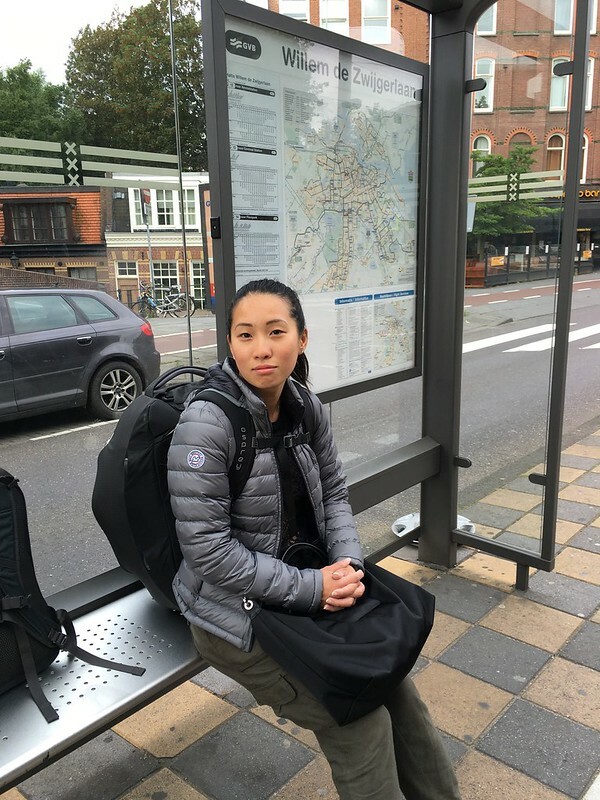 We wanted the cheapest, most flexible, and fastest mode of travel through Europe. 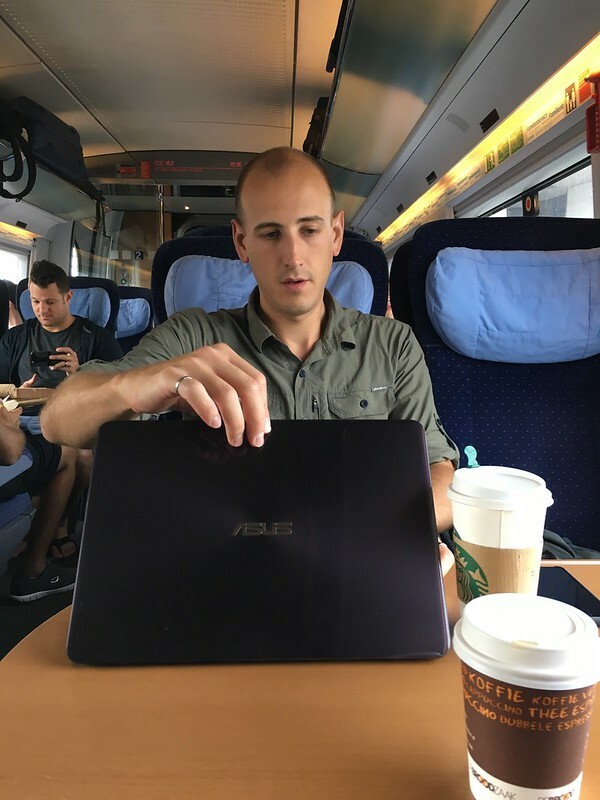 I had always associated European travel with train passes, so I initially assumed this was the obvious way to go. However, thanks to Rachel, I quickly learned this was not necessarily the case. The Eurail pass is expensive. A one month first class pass would cost us each 788€ ($1230 CAD). 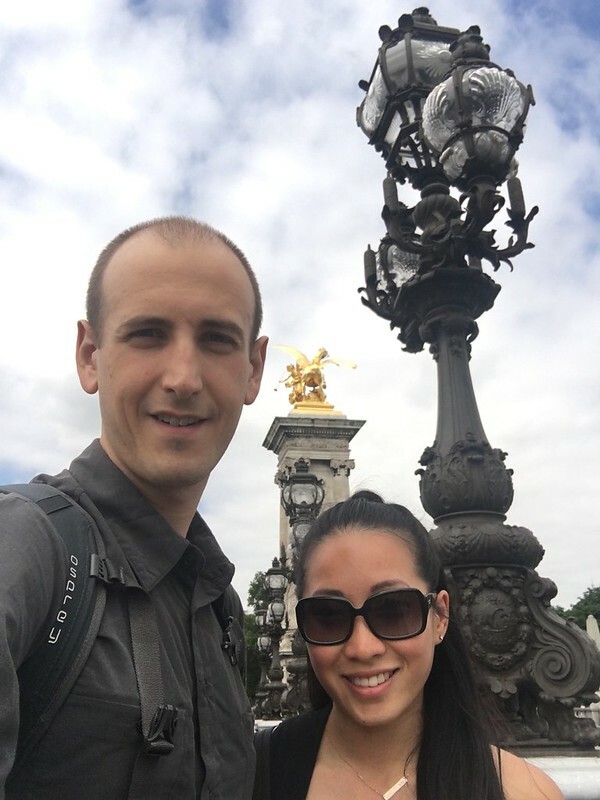 This was much more than we expected and with countless blogs insisting European travel by rail is no longer a foregone conclusion, we realized we had a lot to consider. How much is a single train ticket? How many countries do we actually intend to visit? More importantly, how many cities do we actually think we’ll visit? How much is a car rental? How much is a typical airfare within Europe? Etc. Etc. Indeed, a lot to consider. Airfare can be surprisingly cheap within Europe, especially through low cost airlines like Ryanair. We could buy a lot of flights for 788€. However, while the flight itself is reasonably cheap and fast, we’d still have to get to and from the airport, which is often a good distance from the city centre. We would also need sufficient time to get through security, etc.. In other words, there is a lot of added time and cost associated with flying that we don’t always consider. Driving would likely be most flexible, but renting a car is expensive, especially for such a long duration and starting and ending in different places. Also, since we intended to stay in cities mostly, parking and traffic would be a nightmare. Finally, the rail option. With quick access to train stations and no time required for security and check in, traveling by rail is fairly fast. It would come down to cost and flexibility. When we looked at the cost of individual train tickets for July and August, they were quite cheap…definitely cheaper than buying a pass. However, we were looking in March. The cost skyrocketed for tickets only a couple days ahead, and this would surely be worse in the peak season of summer. We knew we didn’t want to plan out our trip day by day so far in advance. So, for maximum flexibility, the rail pass would be cheapest, even when you add the cost of reservations, which are generally required to secure seats on busy routes. After much deliberation, we finally decided the Eurail pass was right for us. 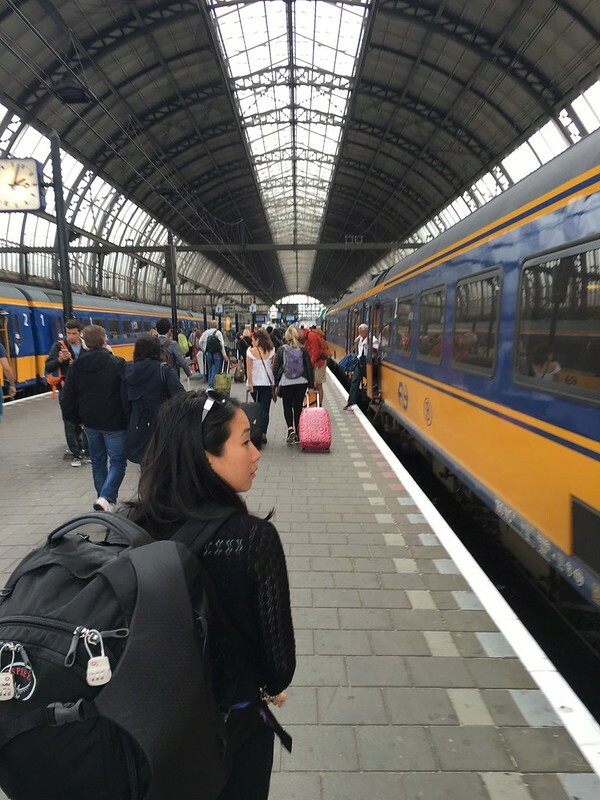 For sure, travel by rail is not cheap and no longer a foregone conclusion in Europe. 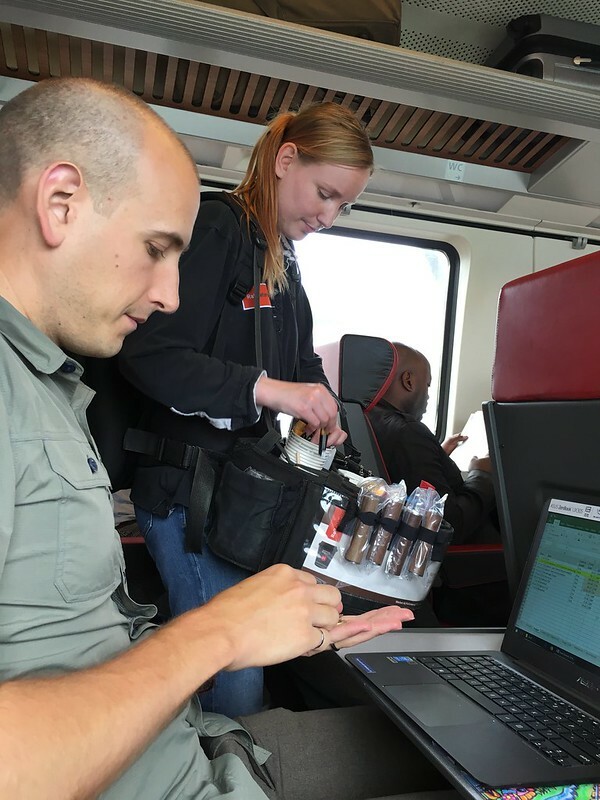 Cost is now extremely competitive among trains, planes, and automobiles, and all other considerations are really dependent upon one’s individual travel plans. Anyway, back to the train station in Brussels. 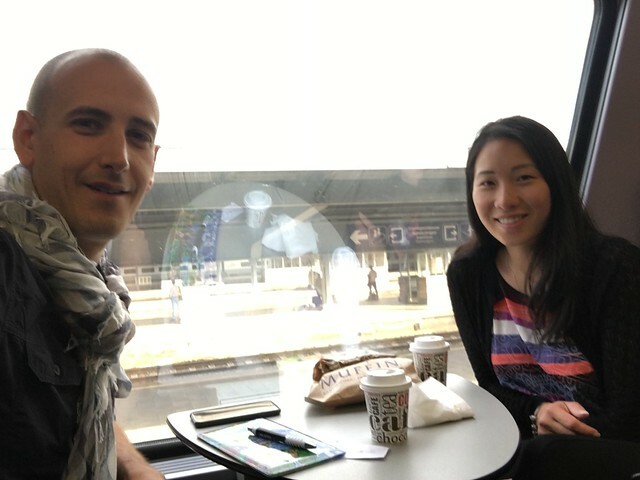 After initiating our pass at the ticket office, we bought breakfast and headed for the train. We found our seats and sat comfortably with our coffee and croissants. The train began to pull away at 8:51am, right on time. 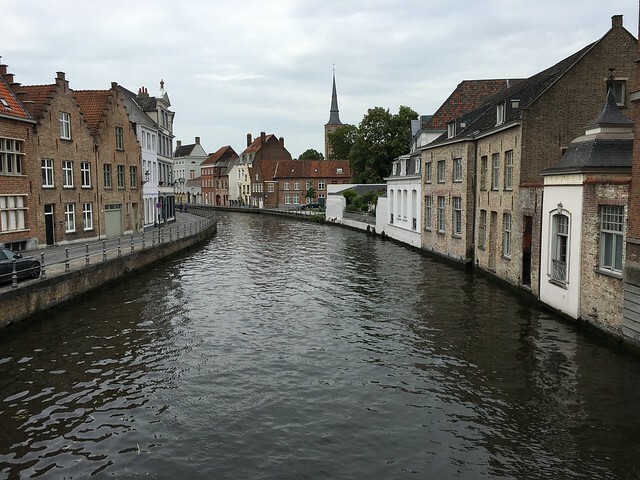 We arrived at Bruges Station a little over an hour later. 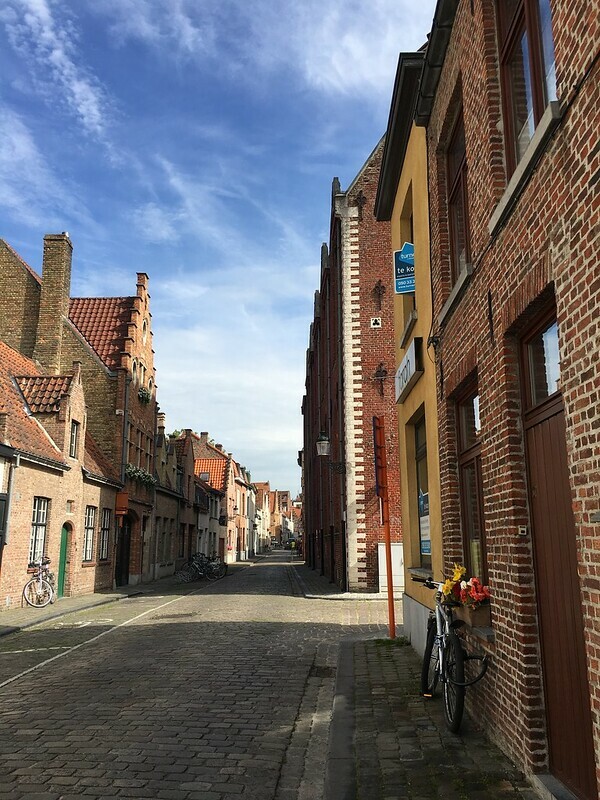 Across a busy ring road and over a tree lined canal that encircles the old city, we quickly entered a maze of narrow cobblestone streets and medieval brick buildings. 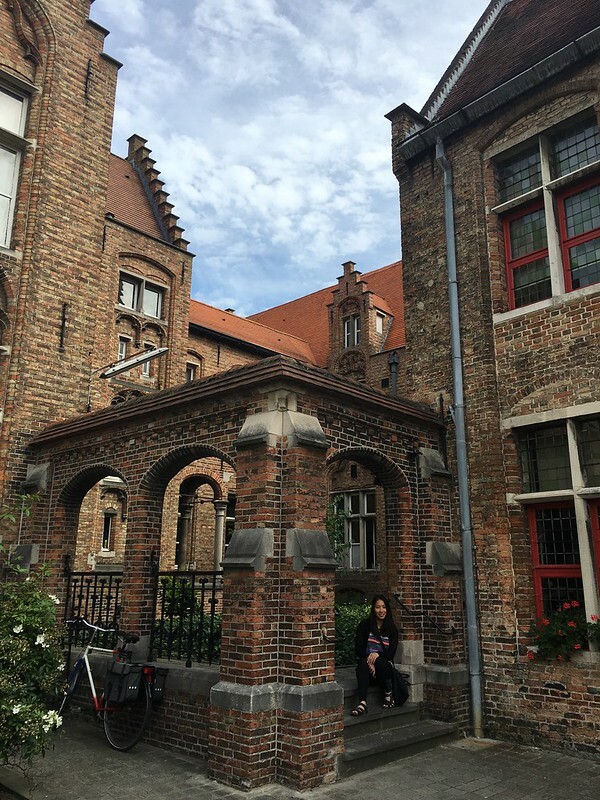 Flowered windowsills, courtyards, archways, and tranquil canals staged postcard views at every turn. 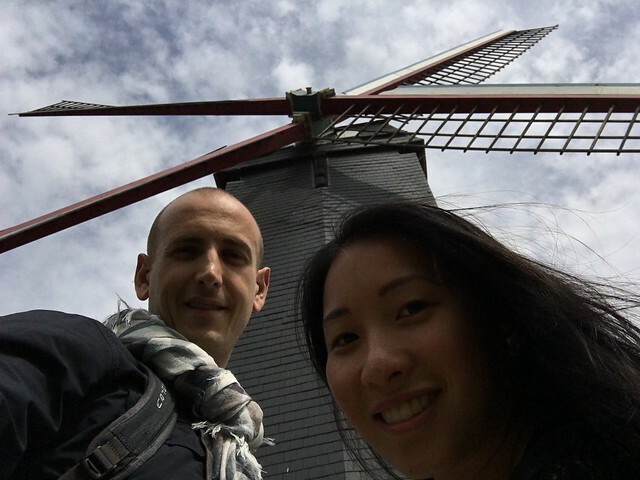 We were in search of Oud Sint Jan Museum, the birthplace of our friend from home, Dirk. 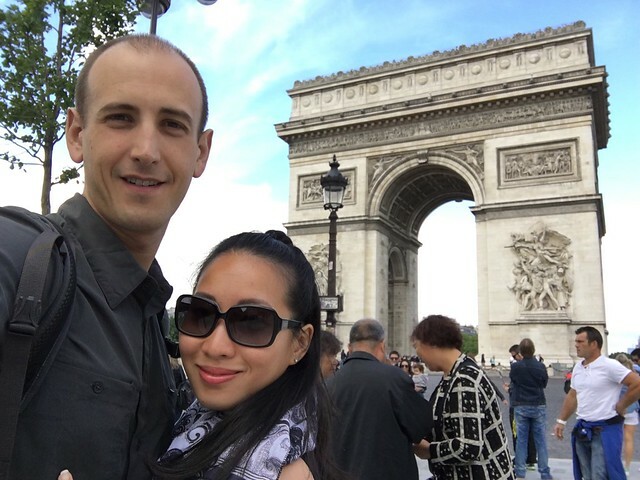 An avid traveller, Dirk gave us many great recommendations leading up to our trip. 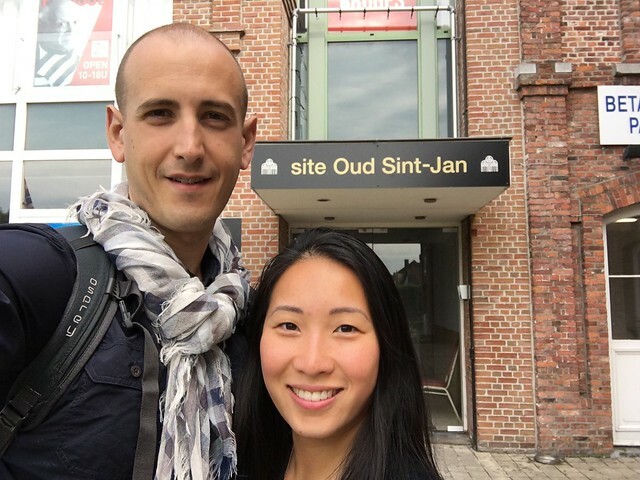 We came to Oud Sint Jan, which was the city’s hospital until about 25 years ago. 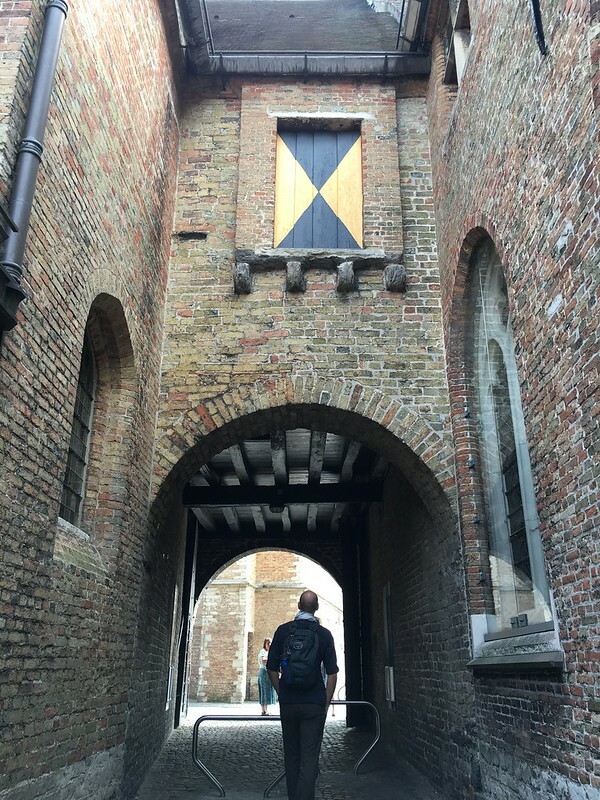 Through more archways, we walked passed The Church of Our Lady, or Onze Lieve Vruow in Dutch. 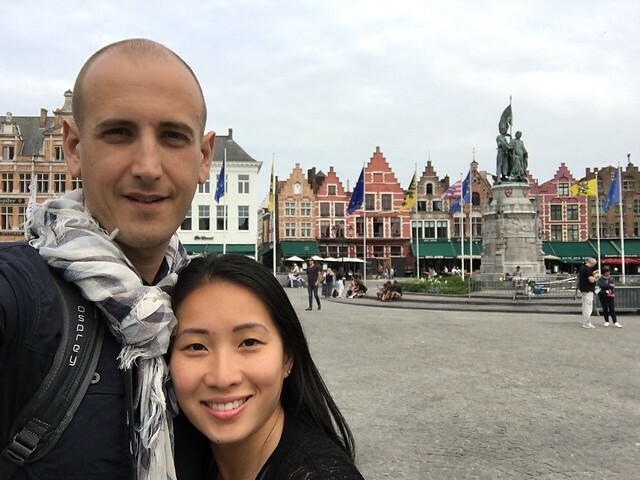 We came to Grote Markt in the centre of the city. It is a large square full of tourists and surrounded by historic buildings, most of which are now museums, galleries, shops, and restaurants. 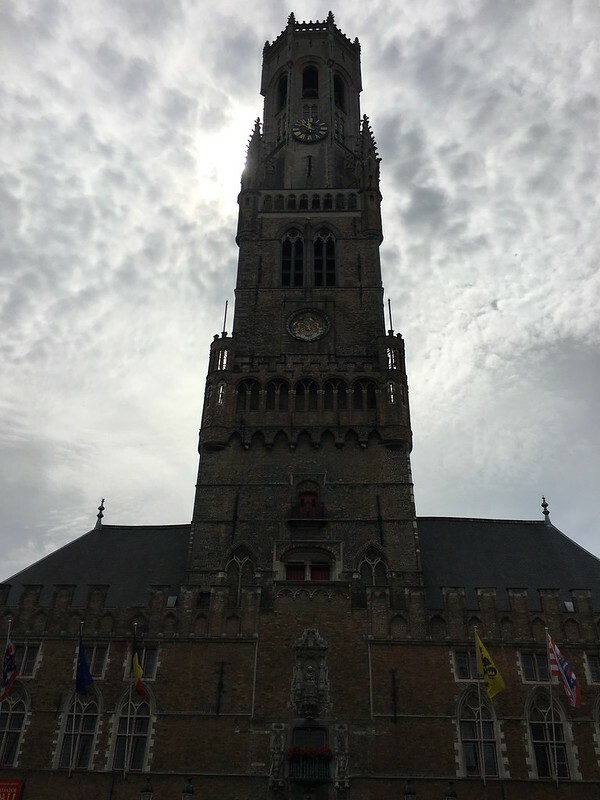 The Belfry of Bruges towers over the city from the south side of the square. It is a must see. It was time for breakfast round 2. 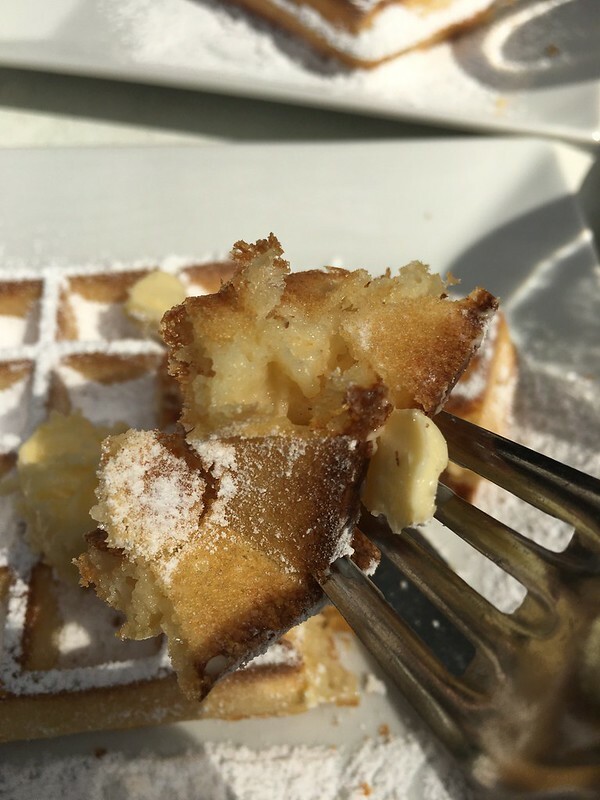 We sat outside in the market square at one of the many restaurants and ordered pannekoeken (pancakes) and a waffle. When we asked the waiter if the restaurant has wifi, he responded, “No. Sorry, you will have to talk to each other today.” I still haven’t decided if this was merely rude or perhaps a reasonable criticism of our generations’ ADHD. Anyway, the waffle and pancakes were decidedly better than the service. 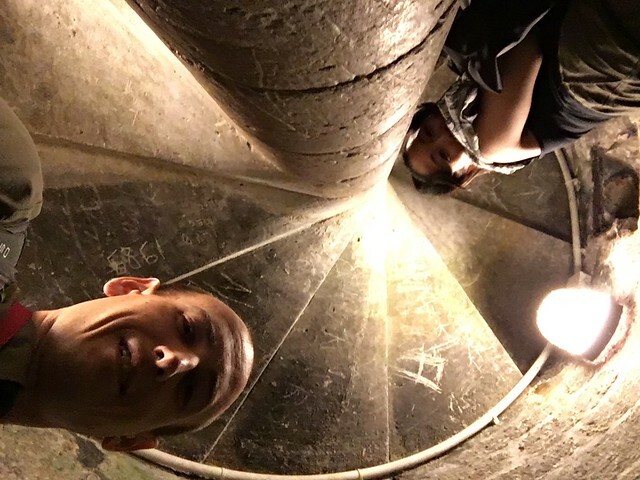 We wandered into the Belfry, a medieval bell tower. 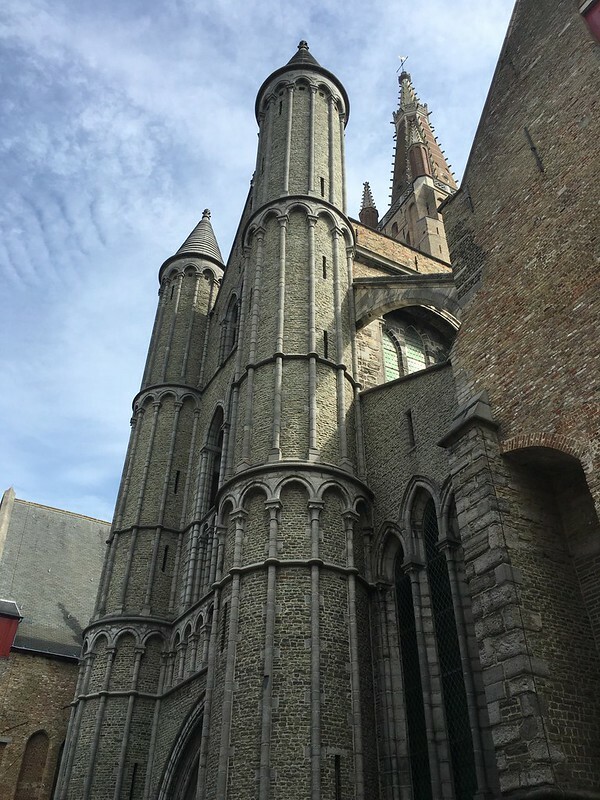 This is probably the most iconic symbol of Bruges and definitely worth a visit. It was built in 1240 on the north end of the old market square and served as a lookout. The connected building enclosing the market square once housed the city’s treasury and was the centre of municipal affairs. We opted not to pay 10€ each to climb the 366 steps to the top mainly due to the heavy stream of tourists all vying for the best views of the city. 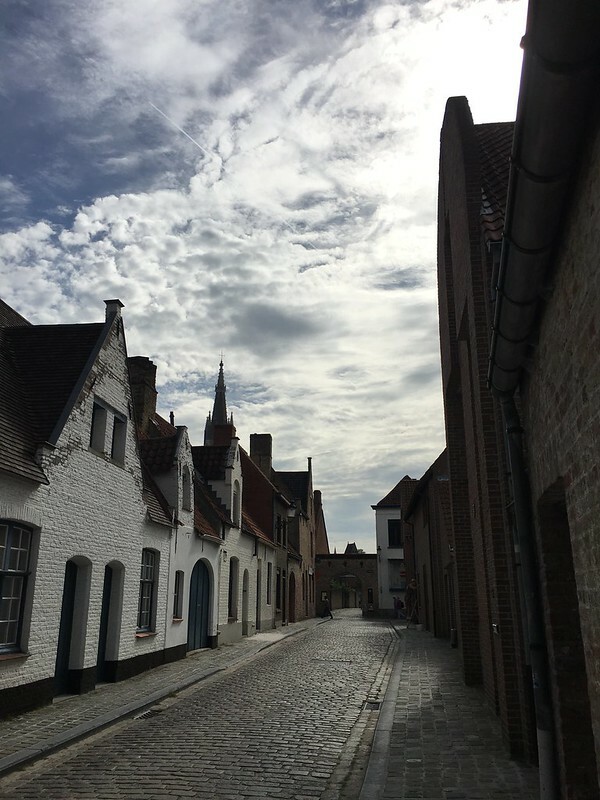 Bruges is pretty enough from street level. 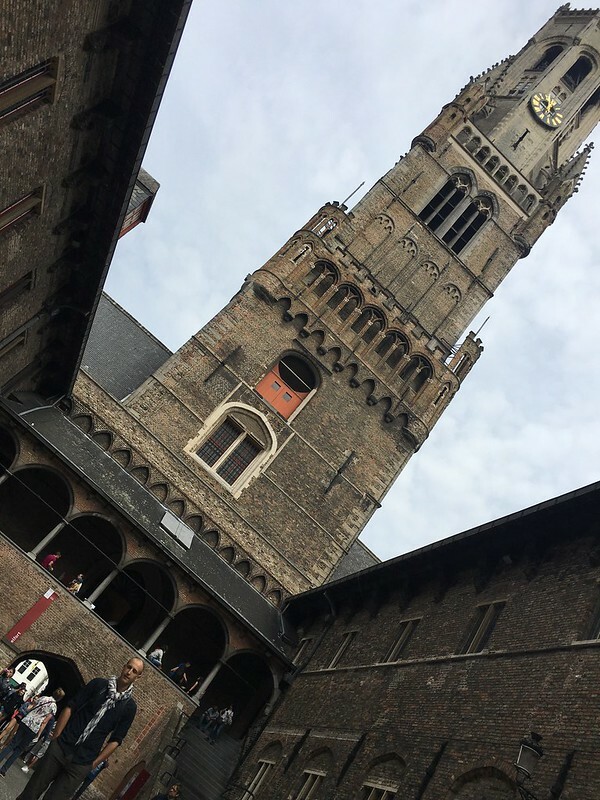 Instead we walked around the square, in and out of a number of art galleries before heading to the Bruges Beer Museum just down the street. 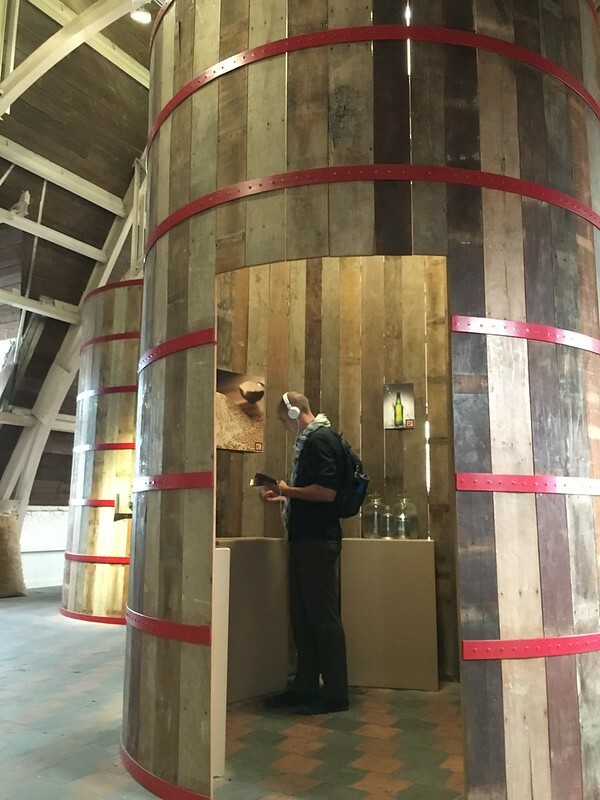 It was very informative with displays about the history of beer and the processes used to brew it. Of course there was no shortage of trivia. For instance, cenosilicaphobia is the fear of an empty glass. An interesting story is that of Saint Arnold, the patron saint of hop pickers and Belgian brewers. He is credited with saving his parish from the plague. In reality, he just encouraged them to drink beer instead of water. Contaminated water had been spreading the infection, but since it is boiled in the brewing process, beer was miraculously free of the deadly pathogen. Parish numbers grew and Arnold was immortalized. His statues, which depict him with a mashing rake, still commonly adorn breweries all over Belgium. Above all, I learned that my interest in beer is mainly in drinking it. Fortunately the tickets came with a tasting. 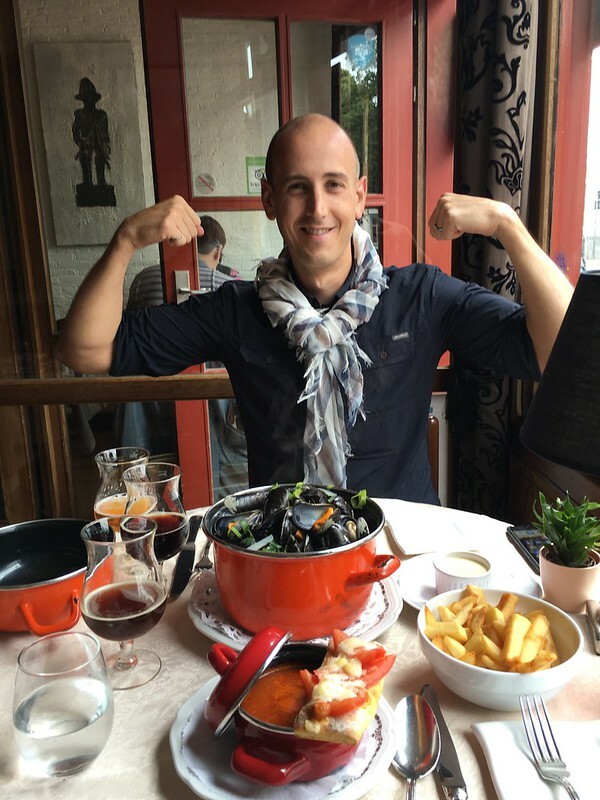 The full feeling from our second breakfast was threatening to flee, so we quickly found a restaurant that served mussels and chips, another Bruges specialty. We settled on Bistro den Huzaar. 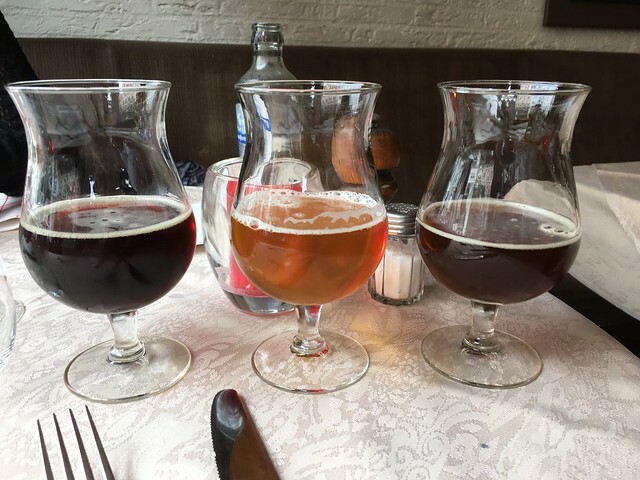 We (I) also couldn’t pass up the beer tasting and fish soup that seemed to leap off the pages of the menu. These were without a doubt the best mussels either of us had ever tasted. They were very simply steamed in water and white wine and garnished with some spring onion. The magic was in the freshness of the mussels. 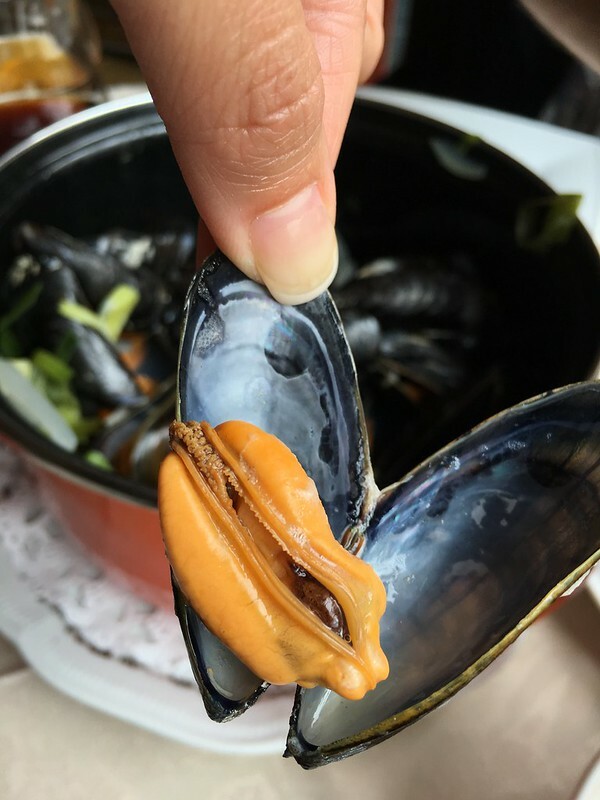 Talking to the waiter, who was also the owner, we learned that although Belgium is famous for the dish, nearly all of the mussels served in the country are actually harvested from the coast of the Netherlands. Apparently mussels just aren’t as popular in Holland. The beers went surprisingly well with the mussels. 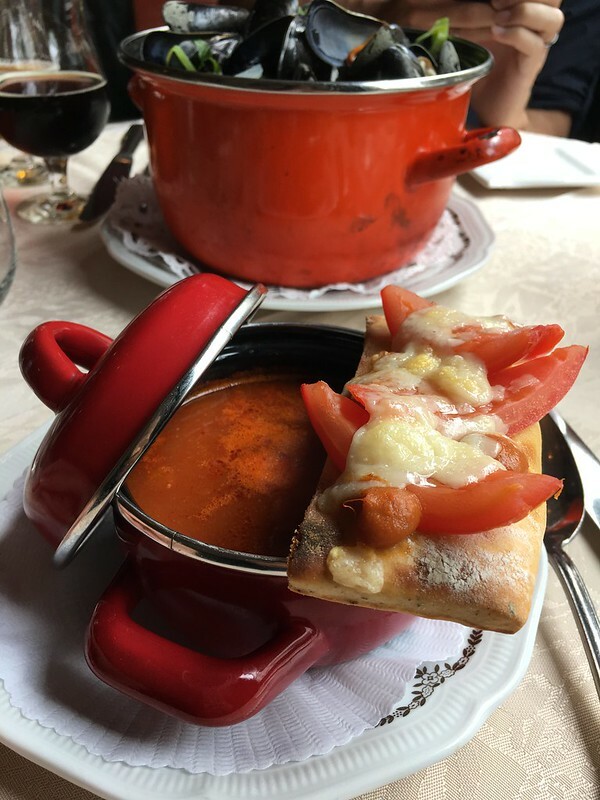 We were less impressed with the fish soup, which came with a little flat bread, but overall, this mussel experience was THE highlight of Bruges. 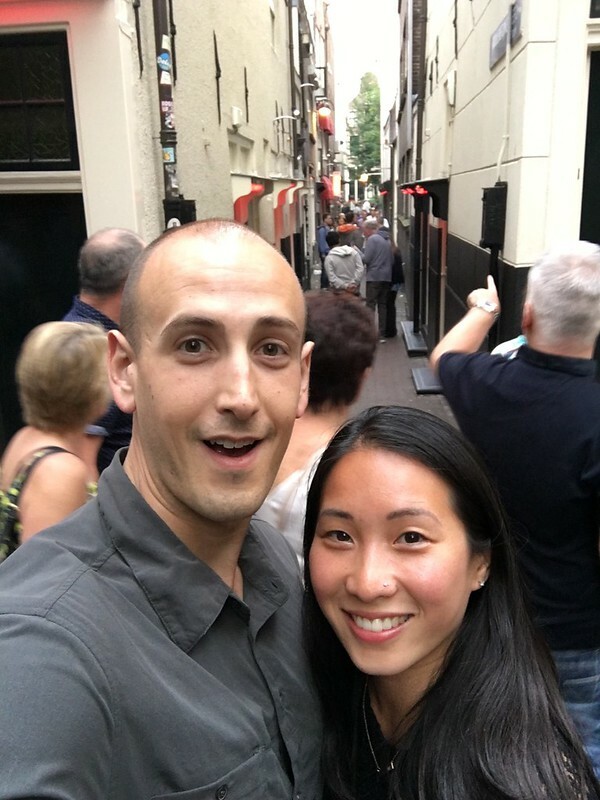 Having recovered the full feeling in our bellies, we continued to explore the old city, stopping to watch swans play in the canals and checking out various shops. There was a perfume store that offers to pair a scent to your personality. Unfortunately, one needs an appointment for this. In another store, Rachel found a light down jacket that squishes into a tiny featherweight ball. Her heavy travel jacket’s days of weighing down her backpack were over. 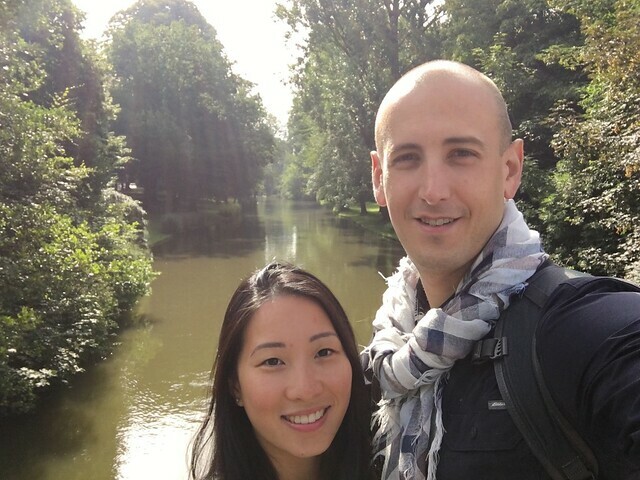 We reached the outer perimeter of the old city, a narrow band of green space that follows the canal moat. To the north was a windmill that begged for a photo op. Despite having seen only a fraction of the quaint old city, a walk along the tranquil ‘moat’ was too inviting. We walked slowly around the city back toward the train station. 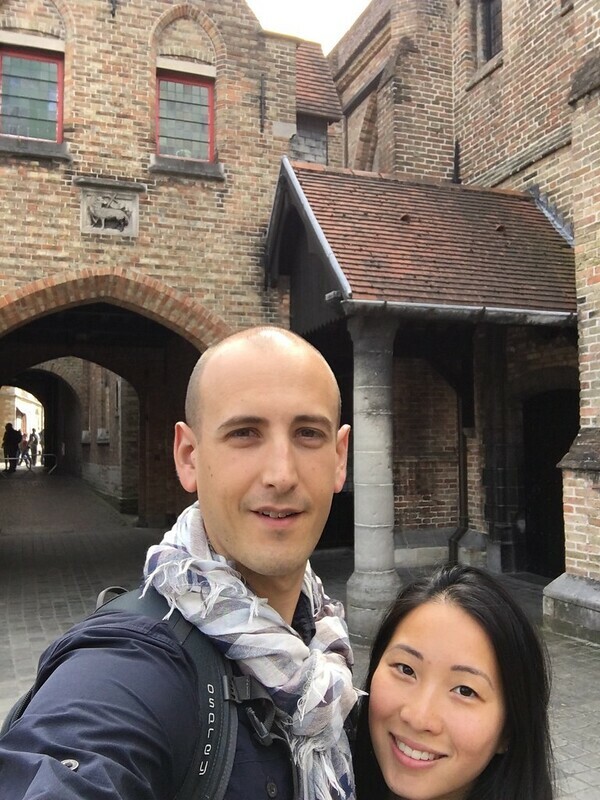 Although one could easily spend several days in Bruges, we were satisfied with our first day trip in Europe. We caught the next train back to Brussels determined to find waterzooi before leaving Belgium. 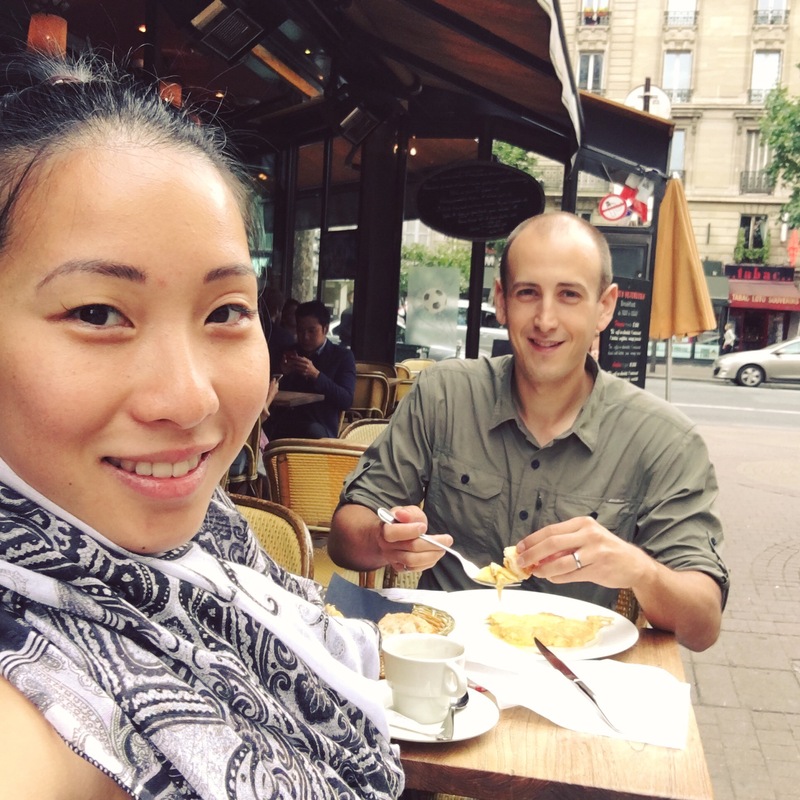 We settled on a restaurant right across the street from our apartment in St. Giles, La Porteuse d’Eau. It offered a variety of local dishes including waterzooi, the famed soup Dirk had recommended. It was quintessential comfort food. 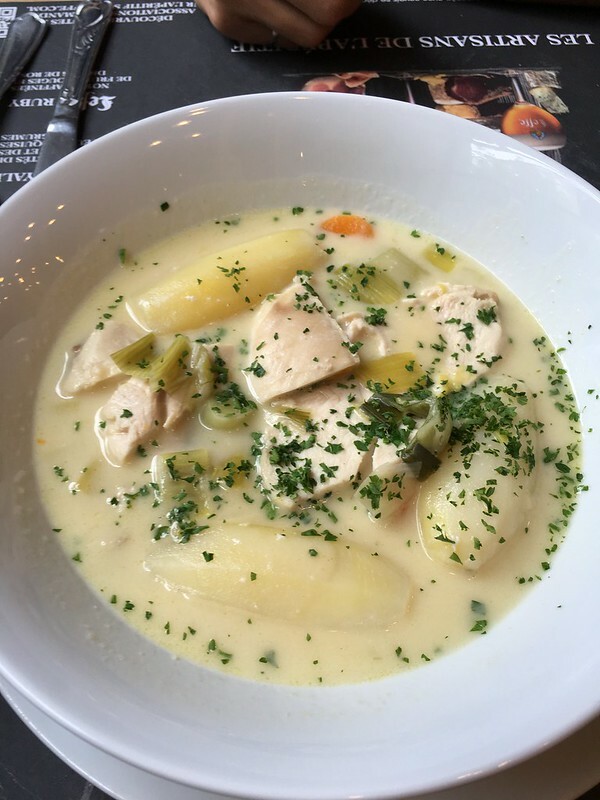 A creamy chicken and vegetable soup. 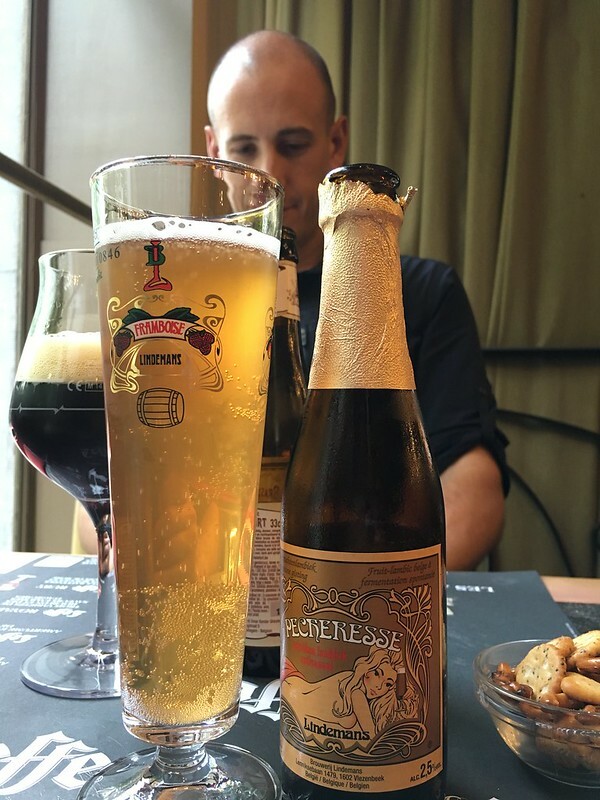 Very simple, but quite tasty, especially with several different Belgian beers. It was another early night for us as we had to pack for Amsterdam. 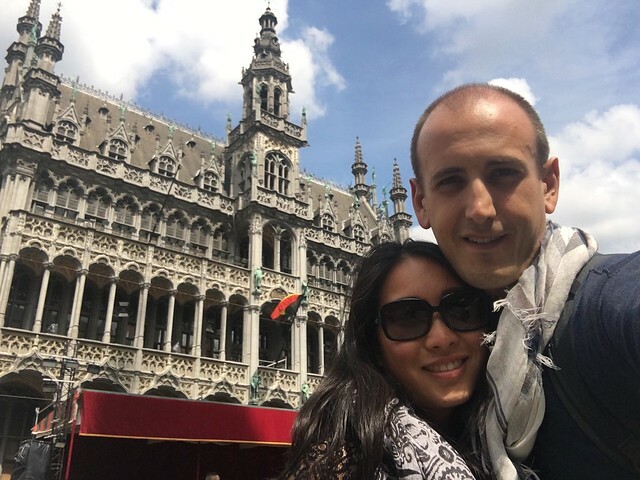 Our short time in Belgium was coming to an end. For breakfast the next morning we had croissants from one of several patisseries right downstairs…so convenient. We ate quickly because we had to stop at the post office on the way to the station. We badly underestimated how long this would take and how uncomfortable it would be to pack a parcel wearing our heavy backpacks. We finished with 9 minutes to spare so we ran to the station. We made it there in 7 minutes but lost 3 trying to determine the track. That’s right, we missed our train. Oh well, there was another train 90 minutes later…plenty of time for another breakfast before heading to the Venice of the North. 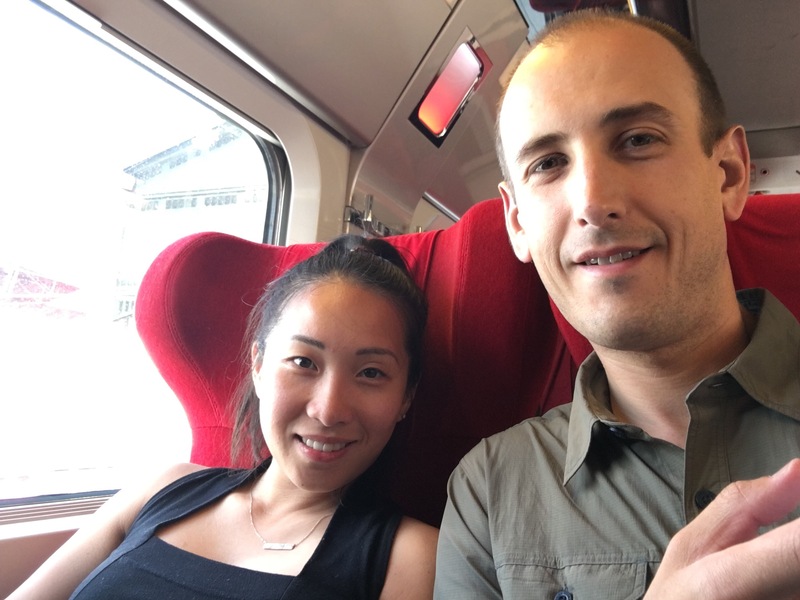 At about a quarter passed six on the evening of July 5th, Thalys high speed train number 9365 slowed to a stop at the Brussels MIDI station. The platform was lined with a welcome party of about a dozen military servicemen wearing full fatigues and body armour, each carrying a heavy assault rifle. It was an appropriate show of force in the wake of the horrific airport bombing less than 4 months prior. 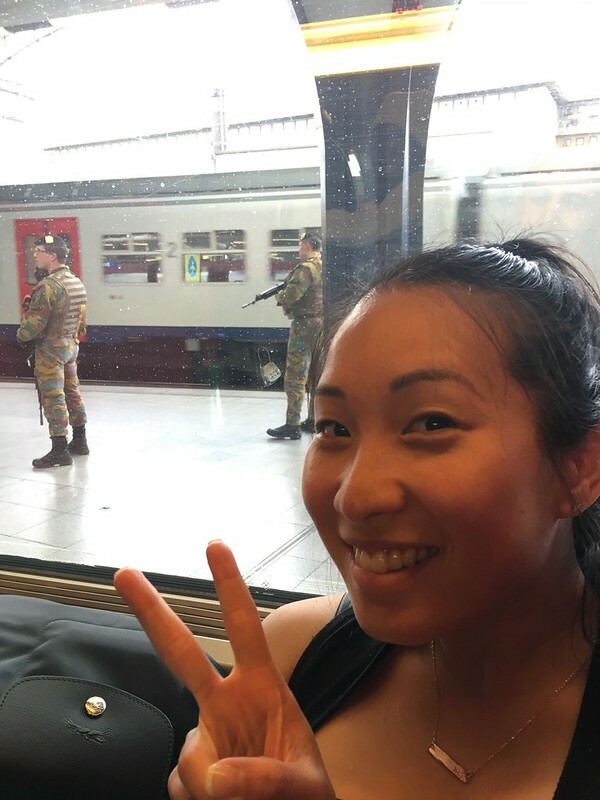 While in Paris, my good friend, Bhupinder, made the ominous comment, “I’ll feel better when you’re out of Brussels.” I couldn’t help but think of his looming concern as our train pulled in beside all those armed guards. On the other hand, police and military presence gives the reassuring impression of security and control, at least in civilized countries. Surely, that is the intent. 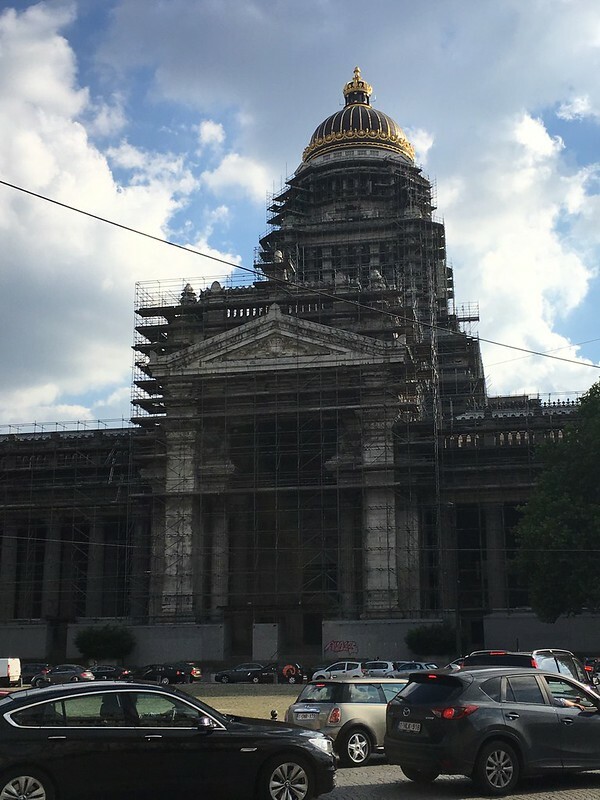 This was the case when I was with Bhupinder in Israel years ago, and it quickly became the case as we arrived in Brussels central train station. Our impressions of Belgium were slowly taking shape. The heavy foot traffic within and outside the train station confirmed the expectation of diversity. It was noticeably heterogeneous. Not in a negative or imposing way, but an apparent contrast to the diversity of Canadian cities, Paris, and London (maybe with the exception of Heathrow Airport). It was a first impression that was difficult to articulate. 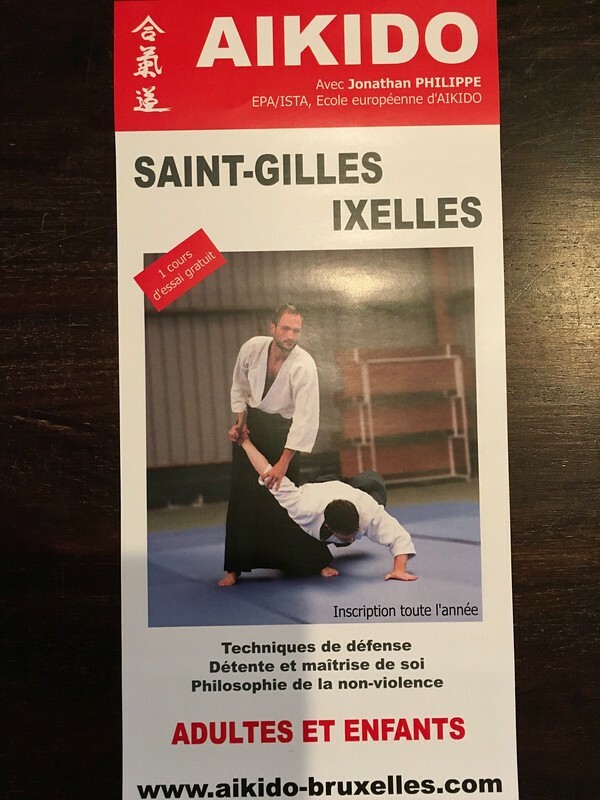 We walked about 10-15 minutes to our apartment in St. Gilles, a pleasant neighbourhood just south of the old city centre. Everywhere, the streets were lined with elegant six to eight story buildings, as it was in Paris. It was quiet yet lively at the same time with people walking and cycling home from work or out to the restaurants and bars. Old men sat on benches watching the pedestrians. The sun was bright and hot, but it was refreshingly cool in the shade as we walked with our heavy back packs. Our host, Jonathan, buzzed us in and advised us to take the elevator straight ahead. We squeezed into the old brass and iron contraption, which we would later learn was installed in 1907. It still worked smoothly, likely as well as it did over a hundred years earlier. Jonathan welcomed us to his deceptively big apartment with high ceilings, crown mouldings and frosted glass paneled doors. Such a welcome upgrade from our Paris accommodation. After our tour, Jonathan gave us an overview of Brussels on a large coffee coloured map hanging in the hallway. It was very old, but we were mainly concerned with the old town, for which it was still perfectly accurate. He gave us some recommendations and had to run to meet his father for dinner. We freshened up and did laundry. Ahhh, a proper shower! No need to squat in a shoe box tub! Heaven! We wandered around the corner in search of the recommended restaurant, Brasserie de L’Union, for dinner. 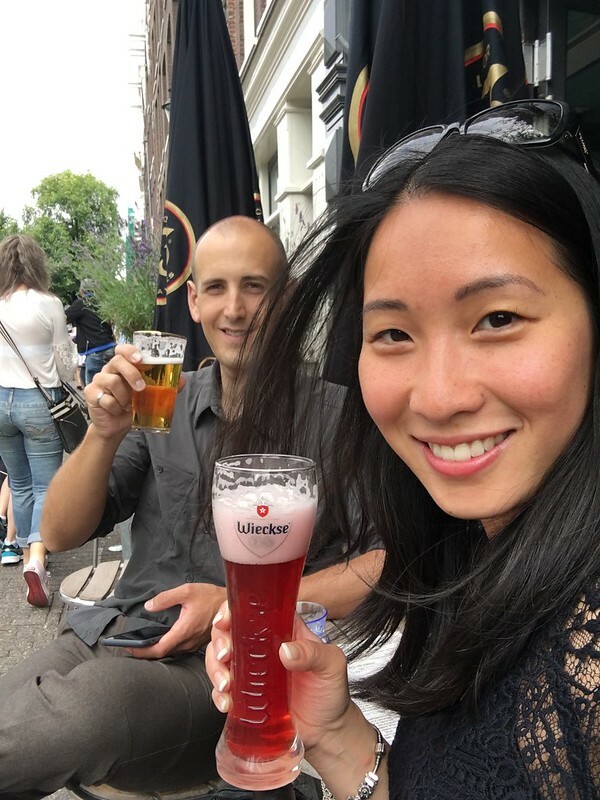 The quiet neighbourhood opened up to a wide street of restaurants, bars, and a sea of outdoor tables garrisoned by thirsty Belgians. It was dusk and a chilly breeze blew between the buildings so we opted for a table inside. 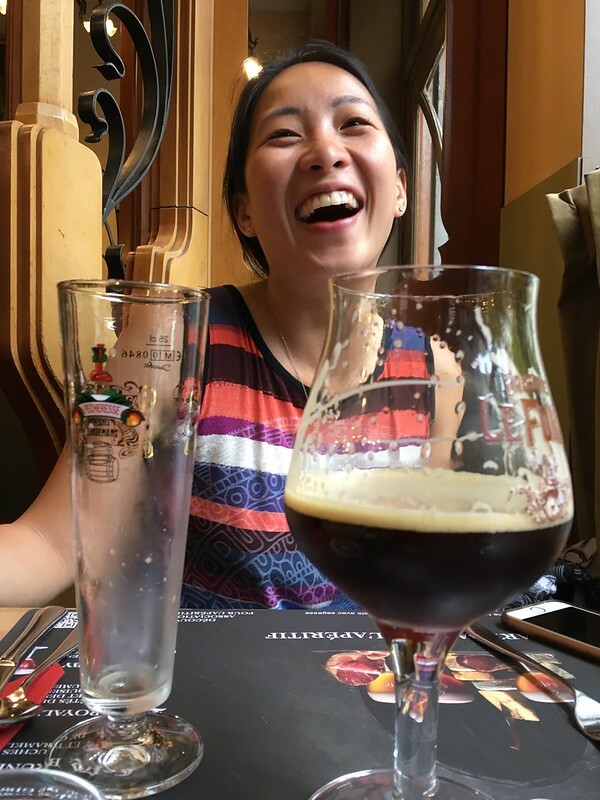 The beer list was enormous. 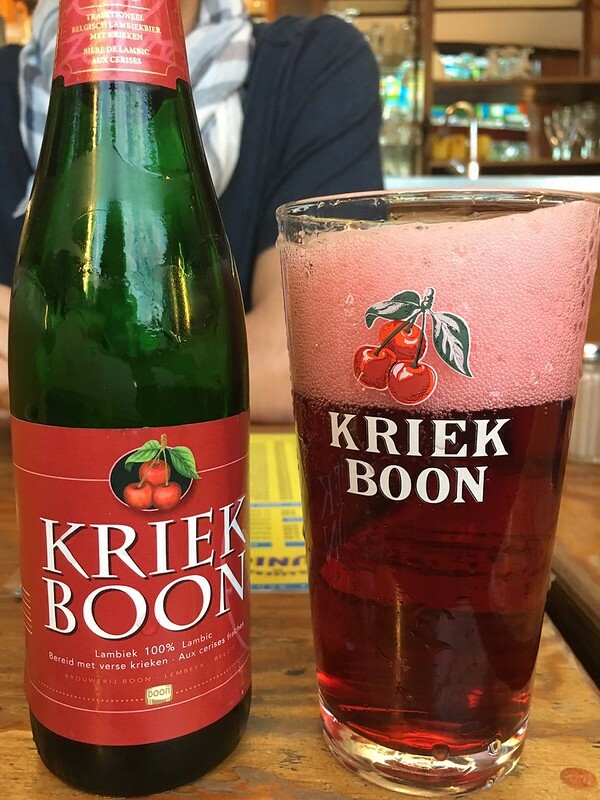 I had a Brugs Witbiere, and Rachel had a Kriek Boon, a cherry beer. 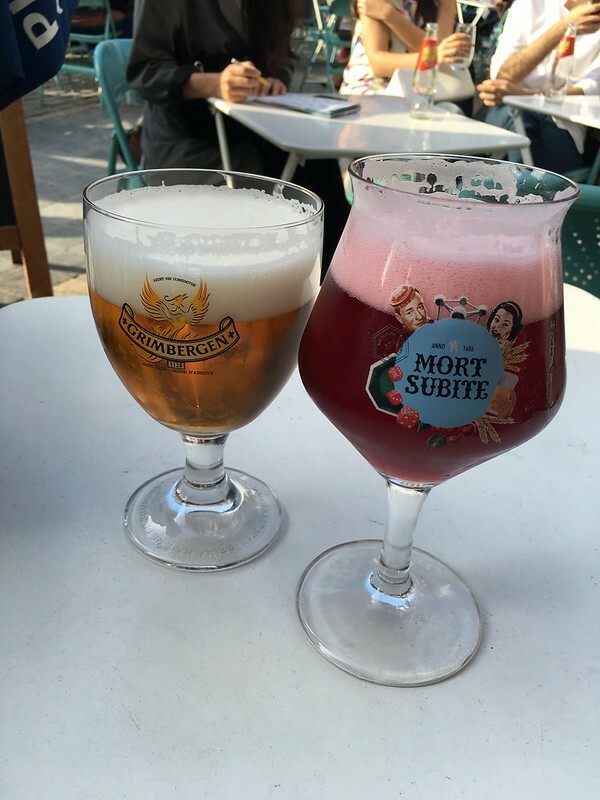 Both were great, although fruity beers are too sweet for me. 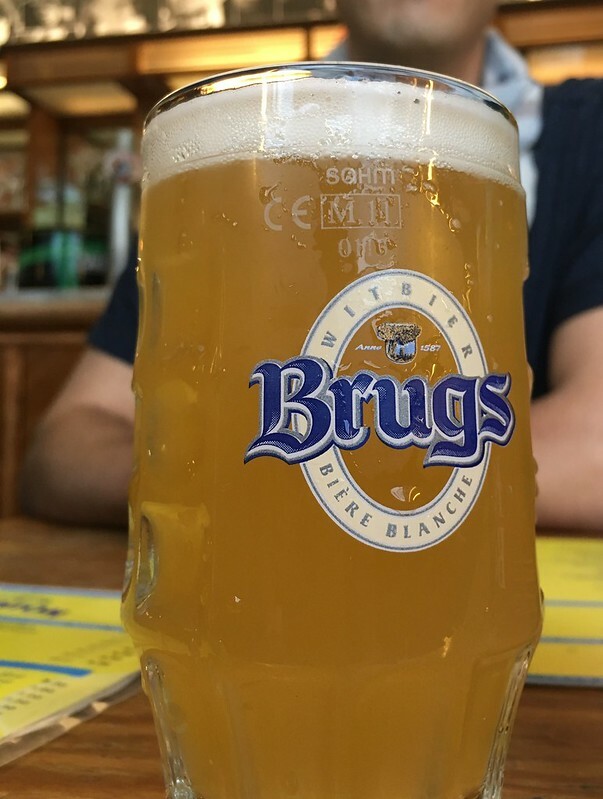 My white beer was nice and refreshing. The food menu was less extensive. 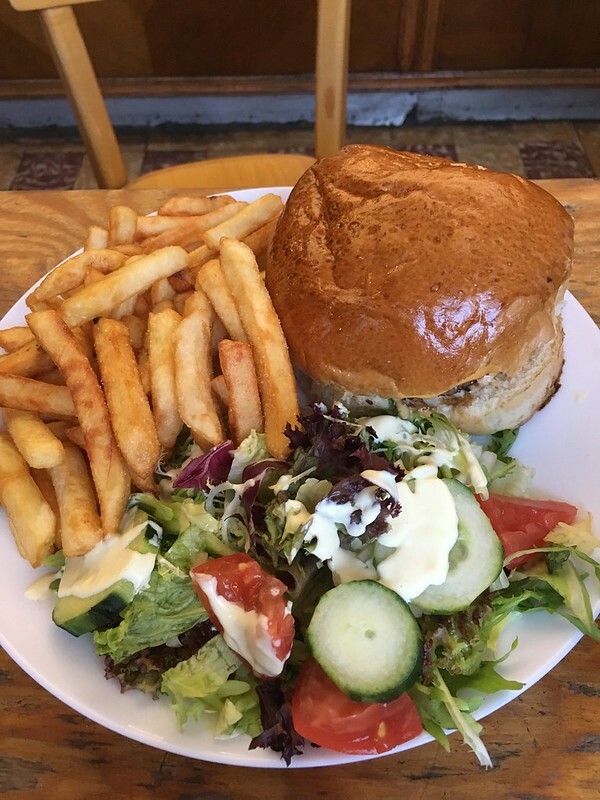 I had a hamburger, interested mainly in the french fries dressed in mayonnaise. 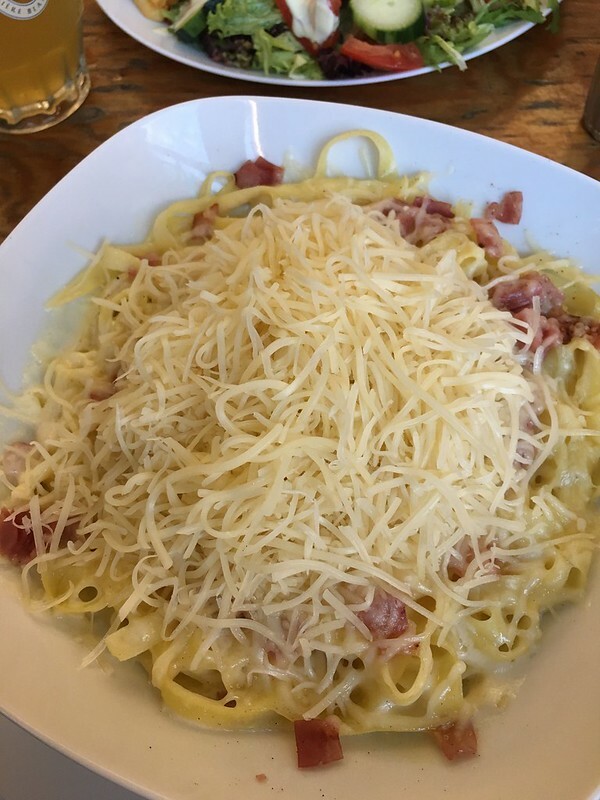 Rachel had pasta in a cream sauce with ham and cheese…a lot of cheese. 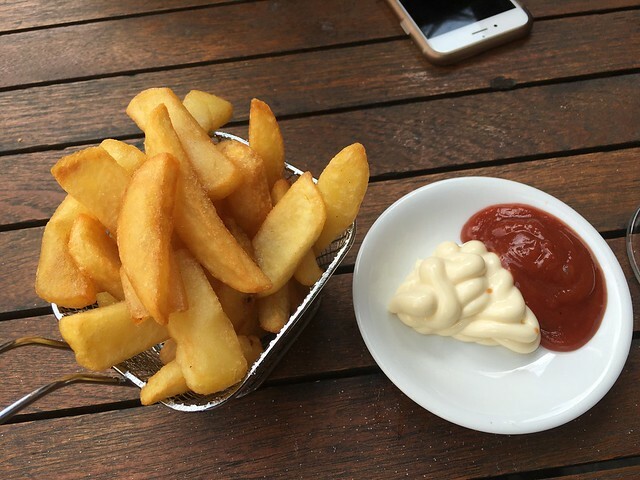 The fries were much better than the burger, especially with the mayo. The pasta was quite tasty too, surprisingly lighter than it looked. The table of 4 girls sitting next to us took interest in us, inferring that we were Canadian. One of them had recently moved to Vancouver and was just home for a visit. The rest were locals. We talked about many things as we ate and drank our beer. They confirmed the heavy security presence had followed the airport attack, noting that the state of emergency had been lifted only recently. One of the girls was particularly vocal on the subject. She was a social worker in Brussels, primarily dealing with migrants. Her perspective was intriguing so I’ll try to convey it here. She argued that the recent attacks throughout Europe were inevitable and primarily due to the lack of integration of an increasing number of migrants. So many people come to Brussels and other European cities with the promise of opportunity and simply do not find it. Basic services, such as healthcare, are provided, but the government does little to curb discrimination, which is widespread and often blatant. 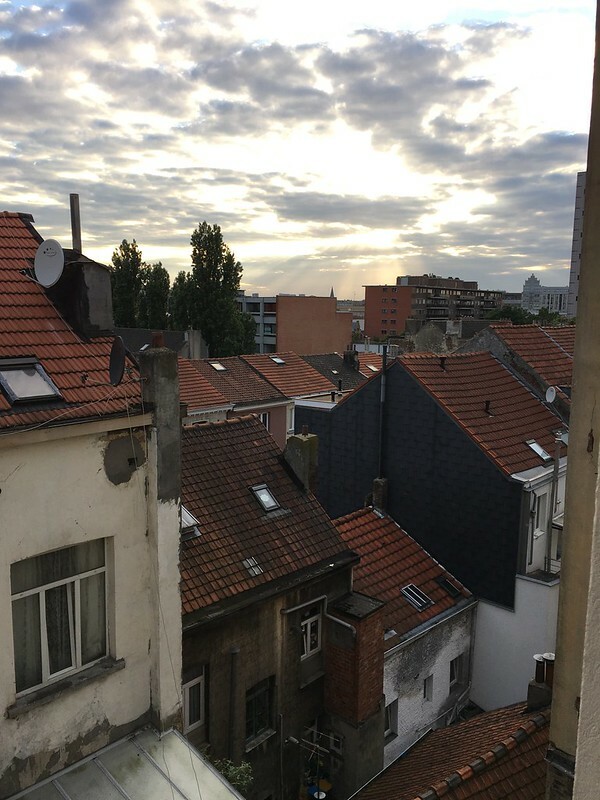 Migrants are regularly at a disadvantage competing for work and peoples’ attitudes discourage assimilation, especially in Brussels. As a result, ethnicities remain largely segregated. Right or wrong, this really aligned with our first impression of the diversity in Brussels…a very apparent lack of assimilation. She went on to describe how many migrants who are unable to succeed are too proud to reveal their struggles to their families and friends at home. Instead many often boast of newfound success and wealth, propelling the exaggerated perception of opportunity in Europe, and thus motivating more people to come. A vicious cycle. The frustration with this situation easily turns to anger and despair, leaving weak minded, disillusioned people vulnerable to extremism. She clearly wasn’t absolving the attackers of responsibility, but acknowledged there is a very real problem that is deeper than just a bunch of crazy Muslims. A vulnerability that must be addressed, regardless of who or what group is currently exploiting it. A compelling argument. We went on to talk about the influence of the European Union being seated in Brussels. Apparently this is mostly a nuisance for the locals as the city essentially shuts down each time the European Parliament is in session. However, they are amused by the common rhetoric from other countries denunciating “the power of Brussels.” This was especially so throughout the Brexit campaigns where politicians railed against the decisions made in Brussels on behalf of the U.K. They joked of the awful burden it is to wield such power over Europe. It wasn’t all doom and gloom about disenfranchised people, despite how this may sound. It was actually a fun conversation with a lot of laughs. The heavy stuff was just memorable and particularly worthy of sharing. Full of Belgian beer, pasta and french fries, we said goodbye to our new friends and walked home to find Jonathan had returned. 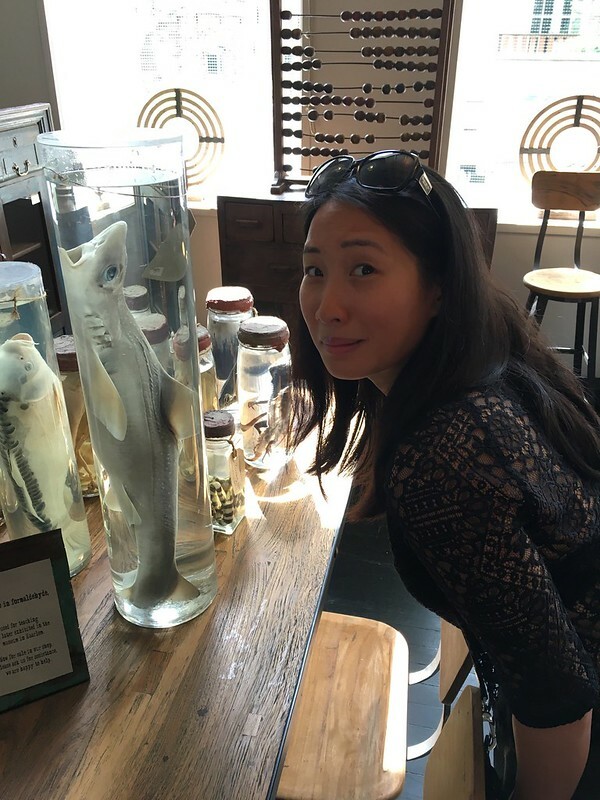 We learned that our host was quite interesting. He is a high school philosophy teacher, Aikido instructor, and magician. Quite a unique set of skills! Jonathan offered to show us an example of his magic. He withdrew two red casino dice from his pocket, apparently ever ready to perform. He began explaining the dice in elaborate detail and thoroughly demonstrated their authenticity. He highlighted that the sum of two opposing sides always equals seven and offered several examples to prove it. However, this rule can be easily broken and any requested number can be made to appear by simply blowing on the dice. He proceeded to do this, quite convincingly transforming the dice at our command. Amazing slight of hand. He performed several more tricks with the dice, which have since escaped my memory. We continued to chat and made plans for a late dinner the next night before heading to bed. 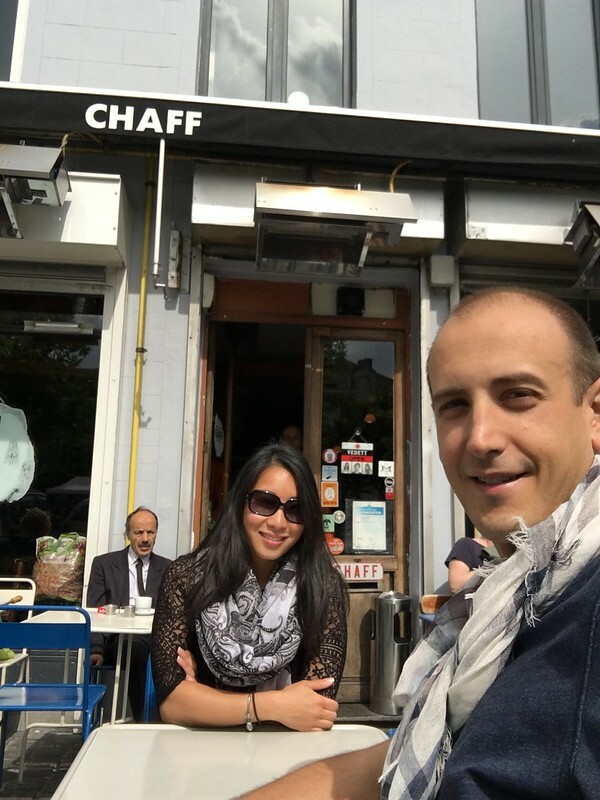 The next morning we walked into the Old Town and stopped for breakfast at Cafe Chaff, next to the Marolles Flea Market. 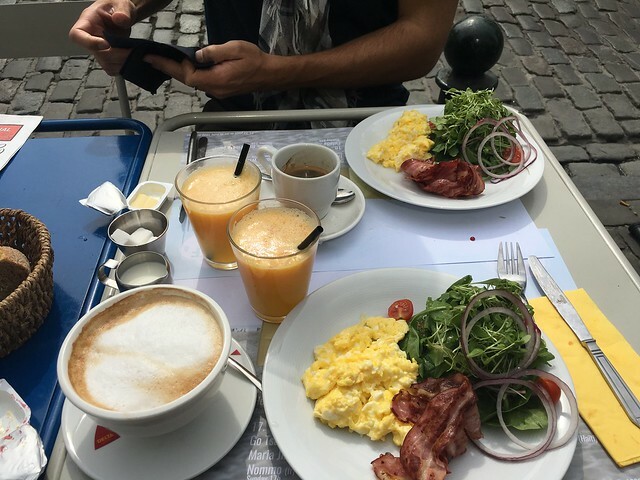 Bacon and eggs with a lightly dressed salad, warm bread, and freshly squeezed orange juice…a good start to the day. A guitarist strolled by serenading us and the other outdoor diners as we ate. He was in search of tips, which is common in European cities. Although we enjoyed his music, he left disappointed. It’s tempting, but you can’t please everyone so we reserve our tips for the exceptional performers, and those we stop to see. We wandered through the flea market hoping to find some buried treasures, but we had no such luck. One man’s garbage is another man’s trash…at least on that particular day. 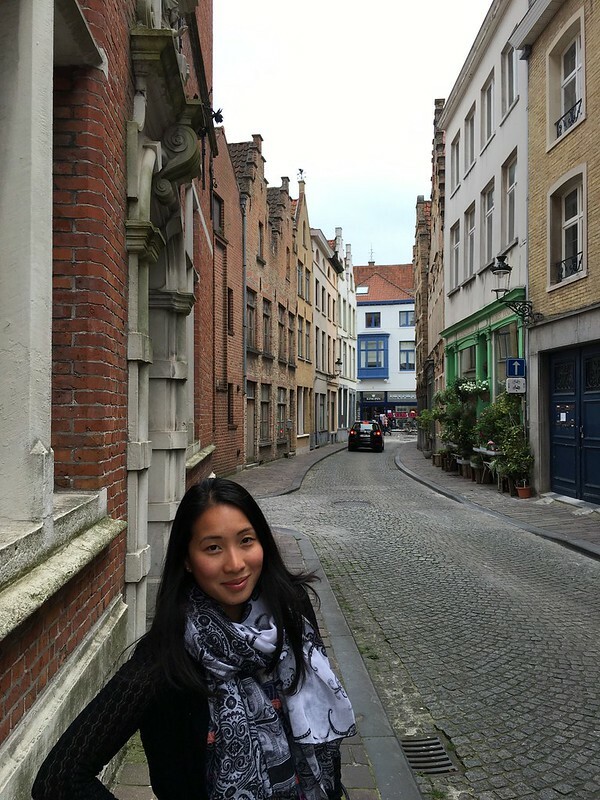 We explored further, enjoying the buildings, statues, and cobblestone streets. 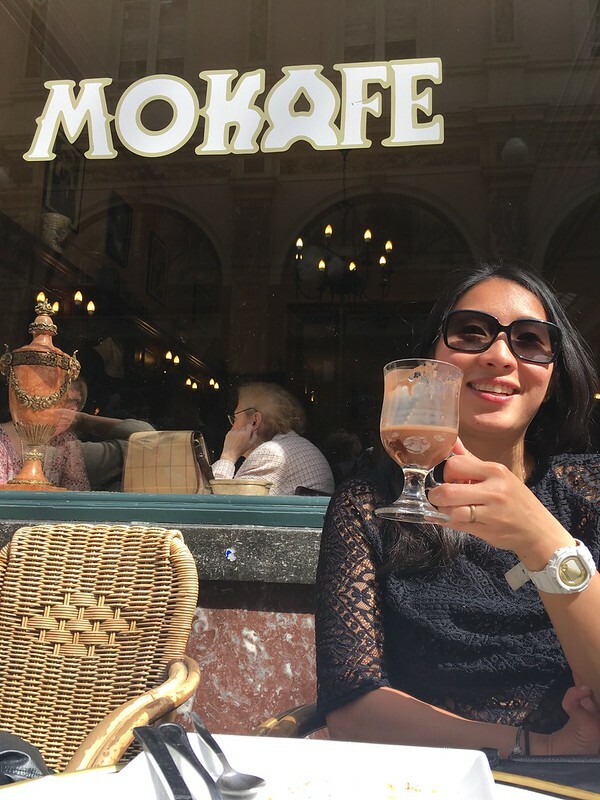 We came to a busy bar and couldn’t resist a stop for a drink at Cafe Leffe. As we sipped our beer, we began to notice the tantalizing baskets of crispy fries on all the tables around us. One of those tables was not like the others, so to fit in we ordered a basket of our own and were soon very glad we did. 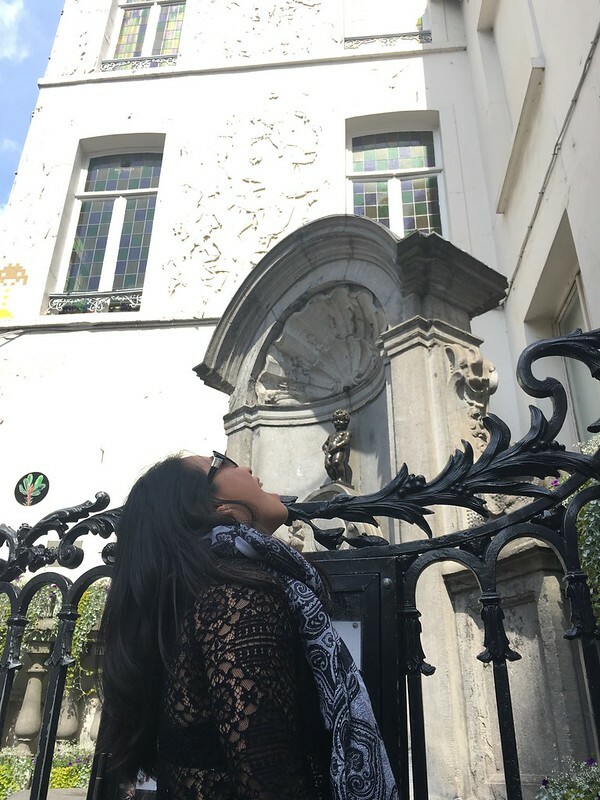 We came to the famous Manneken Pis, peeing boy fountain. 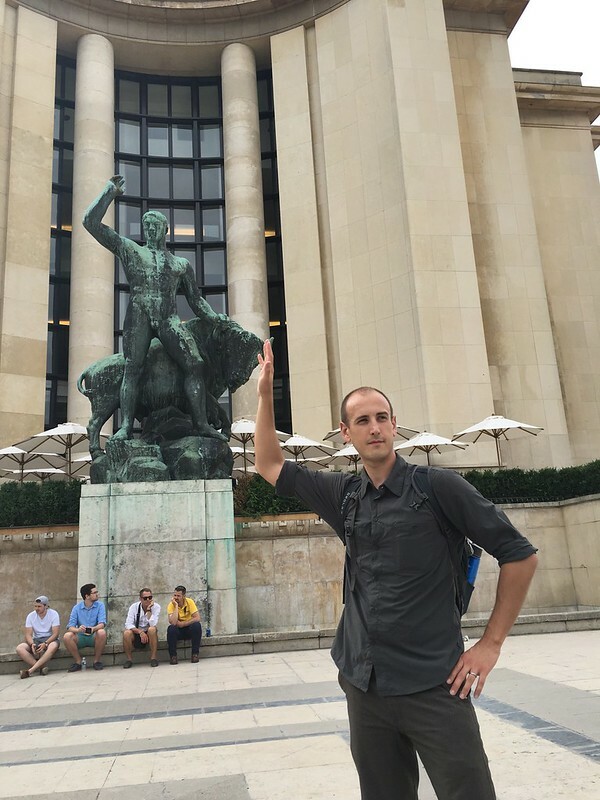 It was significantly smaller than expected….the fountain, that is. 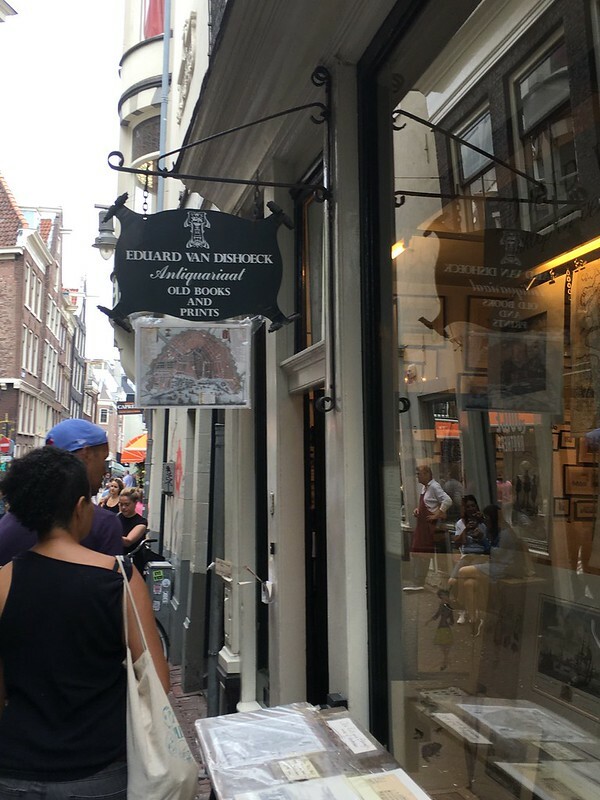 The area was crawling with tourists and pricey waffles drenched with chocolate sauce and ice cream, which was not particularly appetizing. Then we came to a large square, Grand Place, surrounded by beautiful hotels, museums and other ornate buildings. The square led to a labyrinth of narrow streets full of restaurants, cafes, souvenir shops, and art galleries. 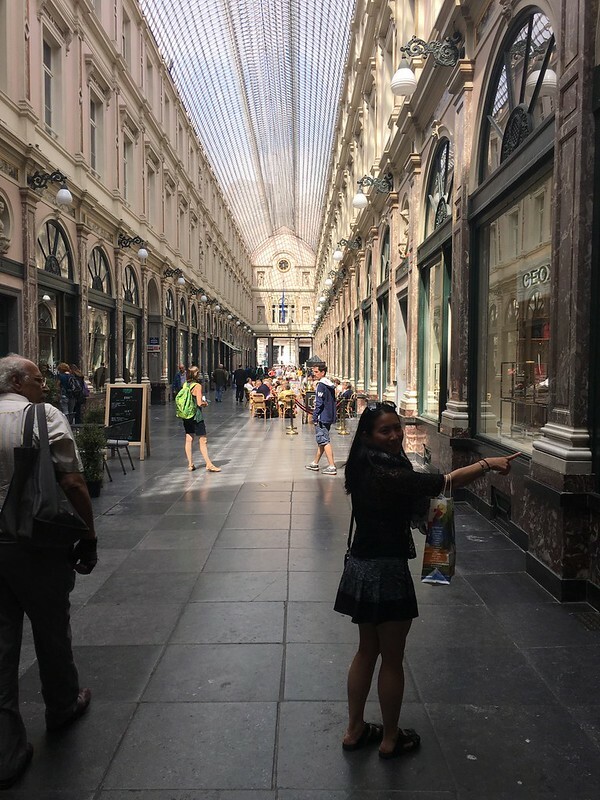 It was also teeming with tourists but it made for a nice stroll as we walked on toward the Théâtre Des Galeries, covered shops. 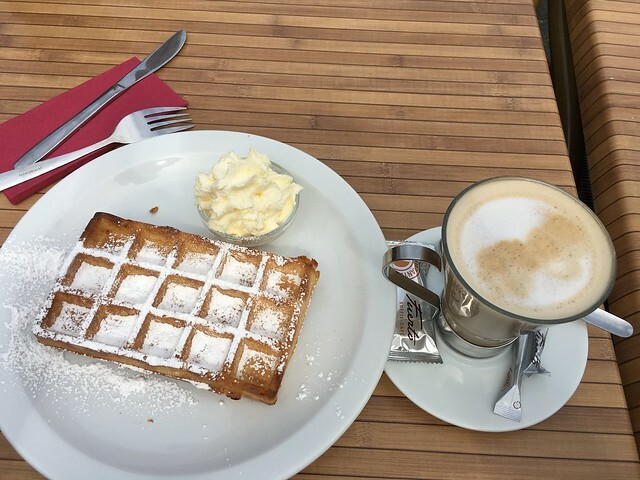 There we found Mokafé, where we would find the best Belgian waffle in Brussels, according to Jonathon. 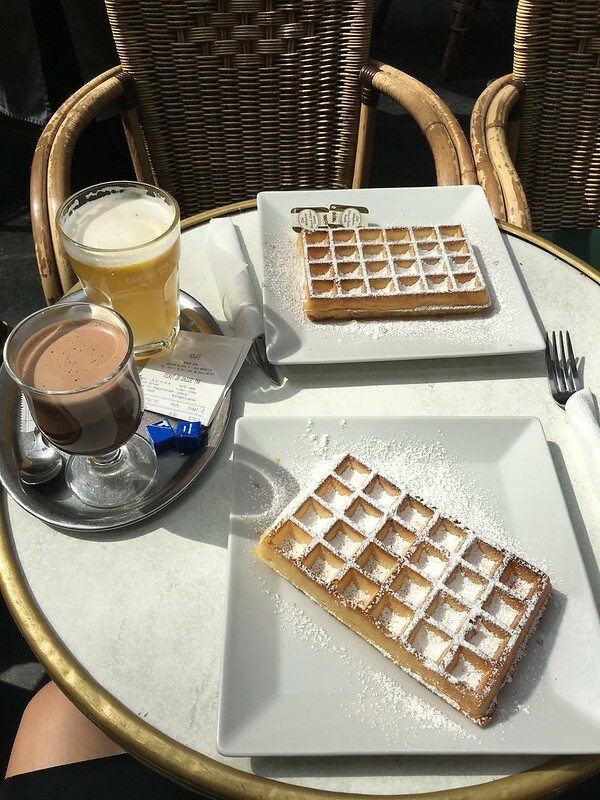 I don’t know if it’s the best in Brussels, but it was probably the best waffle I’ve ever had. 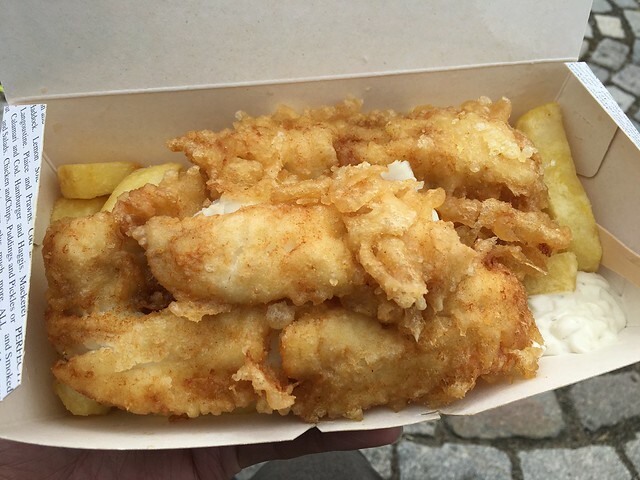 A very thin, crispy outer shell with a soft, fluffy batter inside. Dusted generously with powdered sugar and paired with copious amounts of creamy butter, it was beautiful. 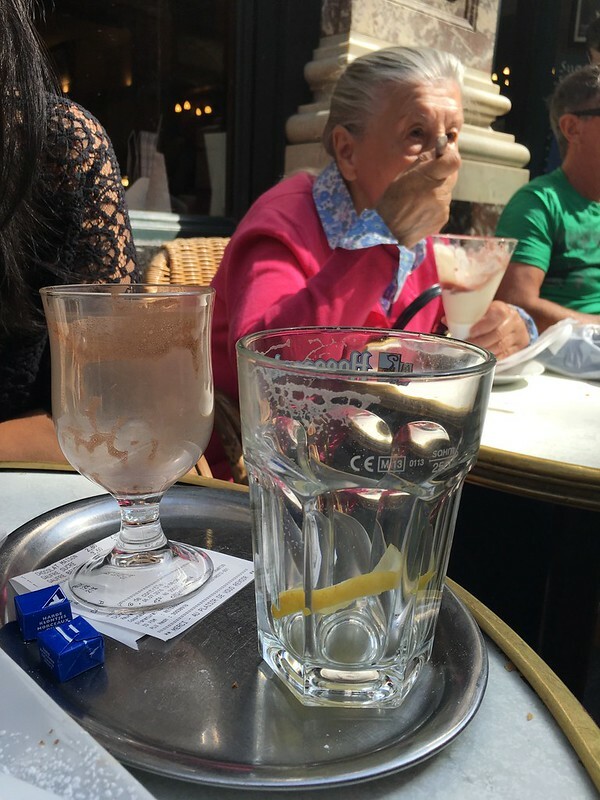 Even better was the little old lady sitting next to us. 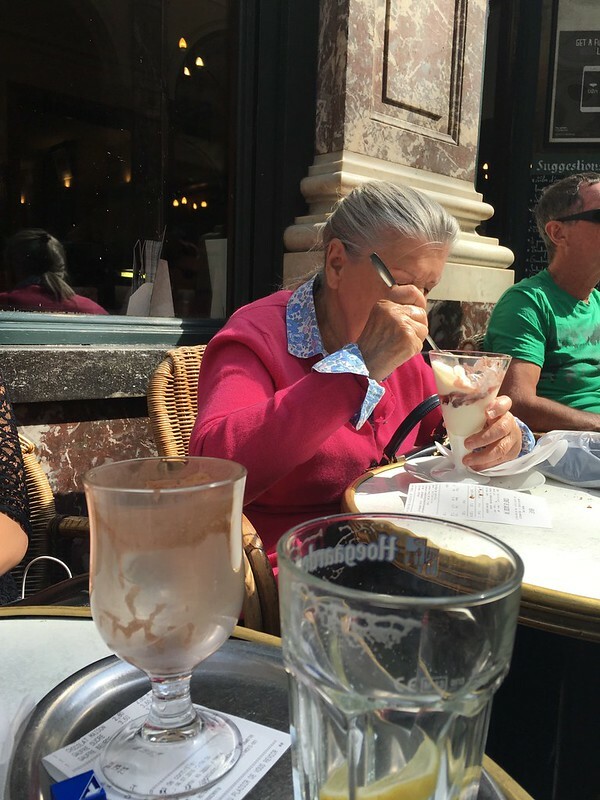 All alone, she ordered a giant ice cream sundae about the size of her head and slowly devoured it one tiny bite at a time. Although her expression scarcely changed, we could hear her heart singing with joy. We perused through a couple shops and galleries within the covered shops. One gallery showcased an artist who specializes in photo mosaics, and uses closeup photos of women’s skimpy bikini clad bottoms to compose a larger image of various conservative themes. I studied his work carefully. Along the way toward the Royal Palace, we came upon a small market, where Rachel bought a dress for her next semester at Hogwartz (actually, quite a nice dress). 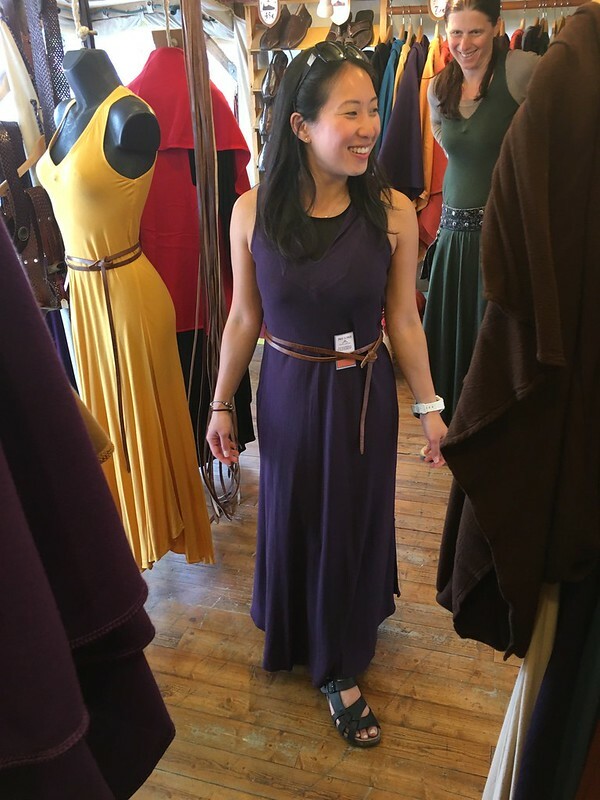 She also bought a thin brown Moroccan leather belt to complete the ensemble. Funnily though, when we got home later, we realized that the belt actually smelled quite bad. It turns out a common technique to soften leather in Morocco is to soak it in pigeon poop. Evidently, this had been done to her new belt. I don’t know how we missed this in the market, but in any case, the belt found itself in a sealed bag full of baking soda, where it will remain for the next 8 months to hopefully kill the disgusting odour. Leather has since fallen off our list of things to buy when we visit Morocco in October. 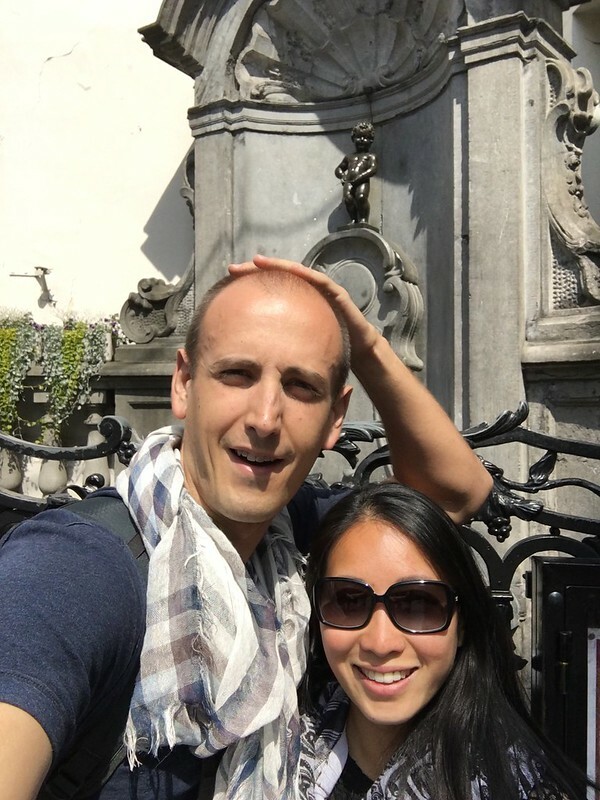 We walked on under the intense heat of the sun and finally came to the Royal Palace, followed closely by the Law Courts of Brussels, both very impressive buildings. 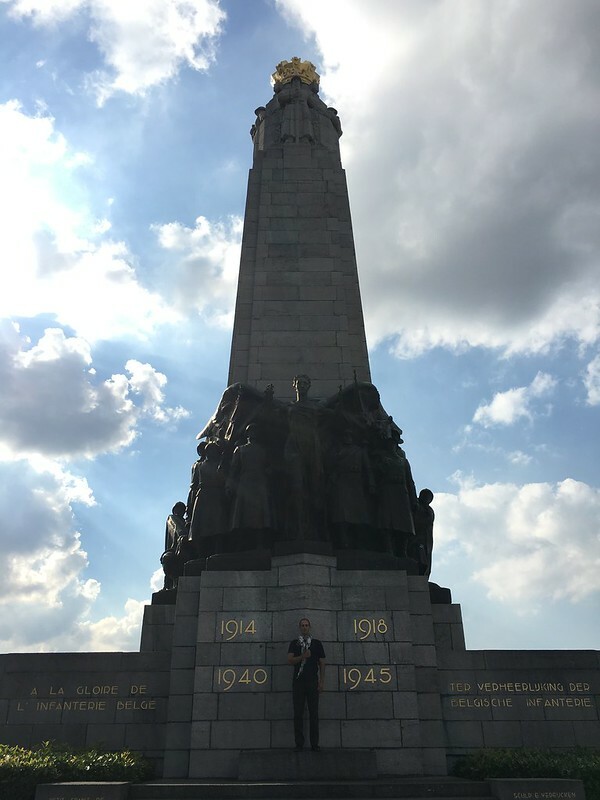 Next to the Law Courts is a ridge, from which there is a very good view of Brussels as well as a memorial to the unknown soldiers of the World Wars. An elevator called, Ascenseur des Marolles, offers a quick and easy descent down the ridge. We took the elevator down and wandered back in the direction of home. 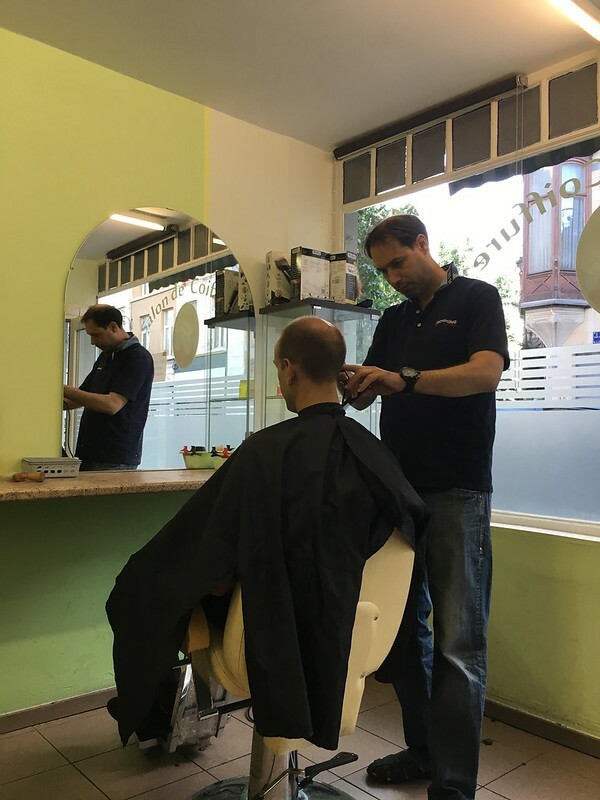 We stopped for my first European haircut, likely the most meticulous buzz cut I’ve ever enjoyed. It was still too early to go home so we got a drink at the square around the corner from home and tried the first of our chocolates. 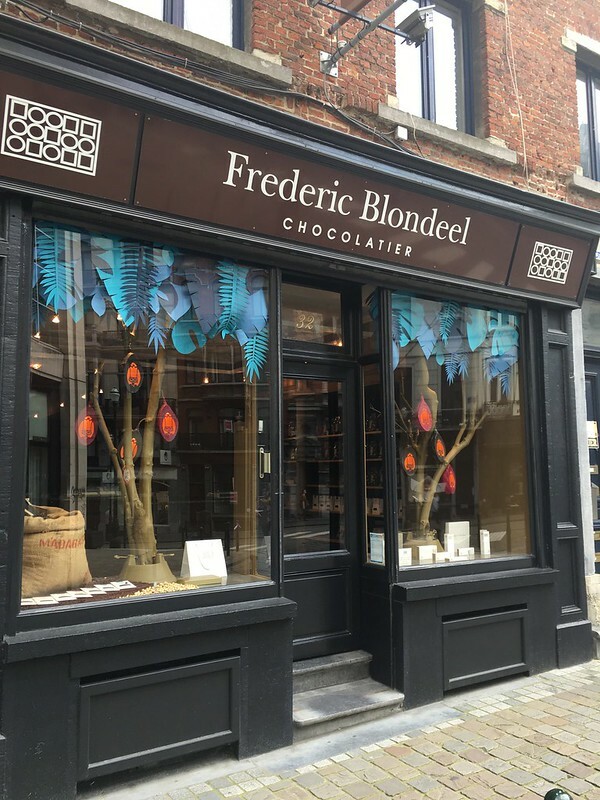 Simply put, Belgian chocolate deserves its reputation! It was incredible. We went home to freshen up and relax. Jonathan came home shortly after 9pm. He had just finished a magic show for a large group, which he obviously enjoyed immensely. We set out to find a restaurant. Everywhere was packed with people watching the Eurocup semifinals. 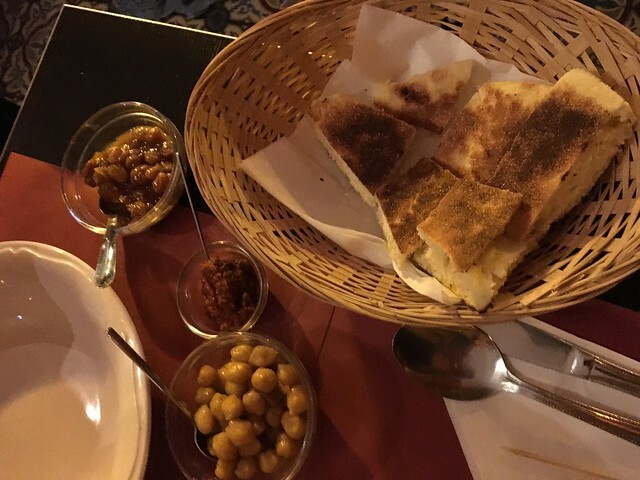 We settled on a small Moroccan restaurant with no TVs and consequently open tables. Soon plates and pots of aromatic food began filling the table. 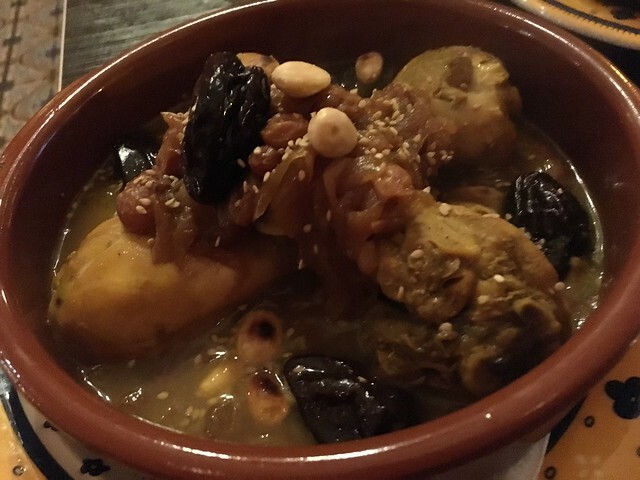 Cumin scented carrots with salty olives, one tagine of chicken, dates and cashews, and another of mergez meatballs with mixed vegetables. 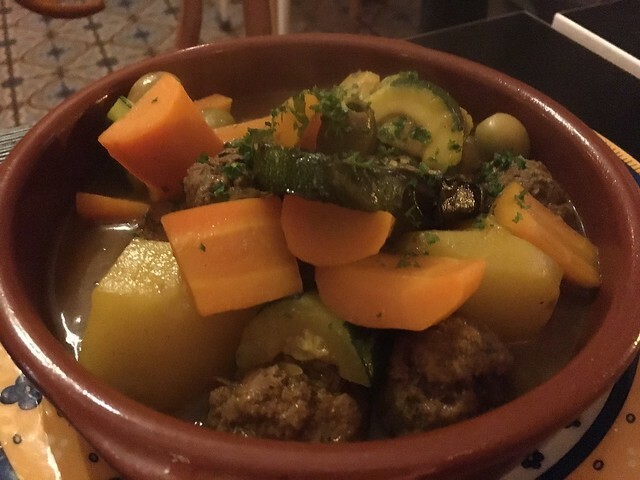 There was a plate of skewered lamb over fluffy cous cous, and another pot of stewed vegetables. Finally, a basket of crispy flatbread with marinated chick peas and an amazing chili paste. I didn’t want it to end but we filled up quickly, sipping rosé wine and enjoying good conversation. After the meal we continued drinking our wine and Jonathan shared more magic tricks, this time using a deck of playing cards. Determined to catch his slight of hand, we were startled when the streets suddenly erupted with cheering, banging and the sound of car horns. Portugal had won the semifinals and evidently the neighbourhood was more Portuguese than Welsh. We settled our bill and wandered home through the ongoing celebrations of the football fans (soccer fans, for those of you in North America). We bid farewell to our new friend since Jonathan was leaving for France early the next morning. We enjoyed our short time with him and wish we could have seen more of his magic skills. Off to bed, we set our alarms so we could catch the relatively early train to Bruges the next day! 730 am rolls around and we couldn’t wait to get ourselves out of the AirBnB place. I’m glad that I don’t have to step on the trail of ants by the bedside again. Speaking of which, we left a pretty honest review about the place and the host didn’t take it too well. I received a nasty gram that revolved around the theme of “brainless spoiled girl” repeatedly throughout her rant. Oh well, c’est la vie ! Life goes on. 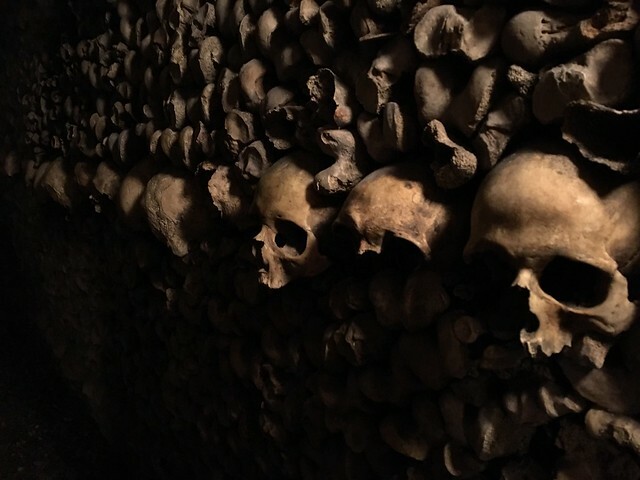 The plan was to visit the Catacombs in the morning and the Jewish Quarter for the best falafel in the world (according to Bhupinder and Sharn) before catching the train to Brussels. 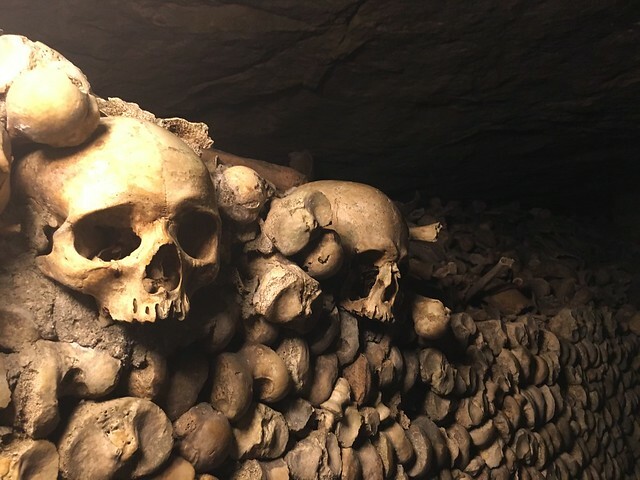 We dropped our bags at Montparnasse station, which by the way is more convenient than Paris Central Station if you need to store your bags before visiting the Catacombs. 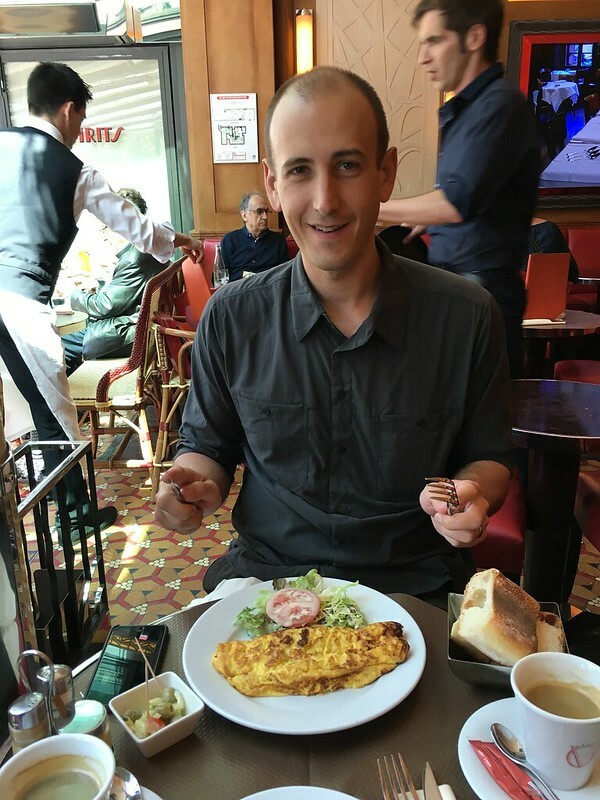 Adam was adamant about having a good omelet before leaving Paris and since we had some time to kill, we scouted around the neighbourhood and settled for a breakfast set at some random cafe. French omelet at last ! 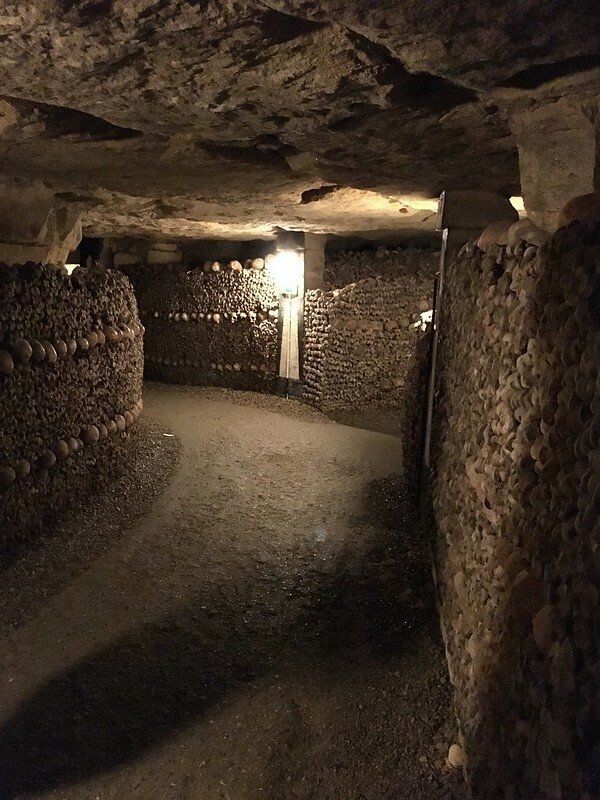 When we got to the Catacombs, the line-up was practically in a full circle ! We purchased our tickets ahead of time for a specific time slot. It was €29 and includes an audio guide. 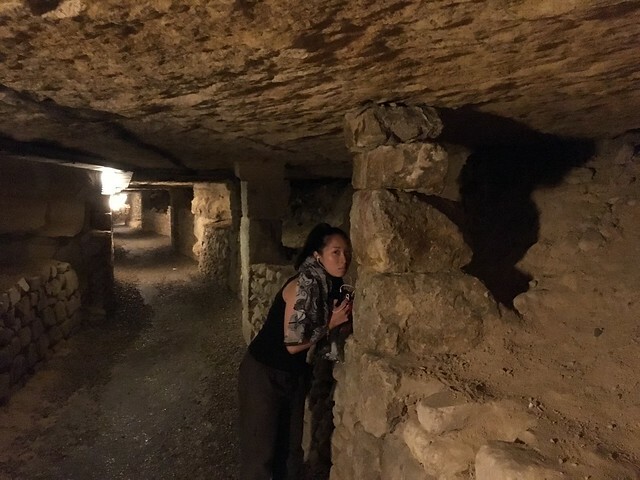 Here are some pictures in the Catacombs. 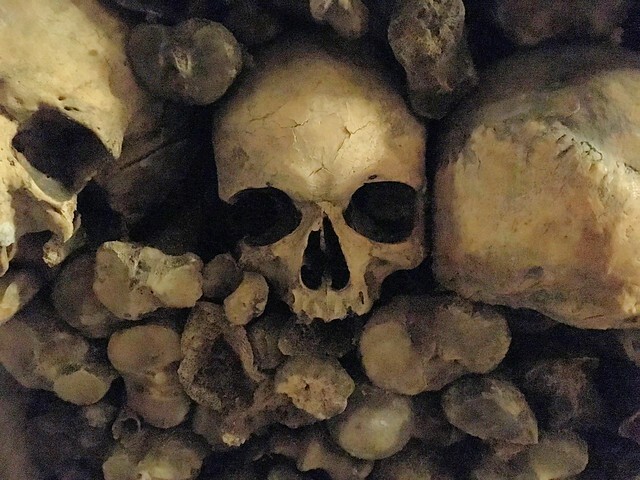 If the thought of centuries of dead skulls bothers you, you can close your eyes and scroll 10 times to skip the pictures …. 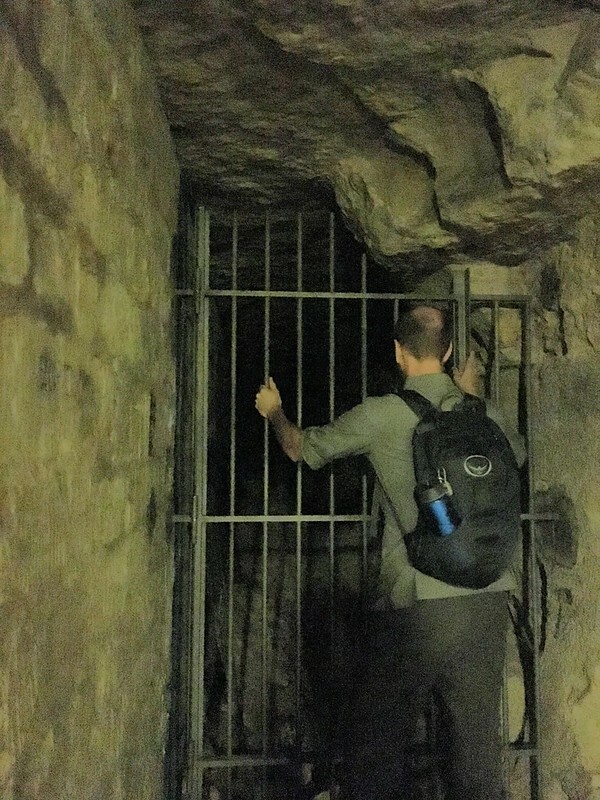 Having the audio guide definitely made a difference in experiencing the tombs. 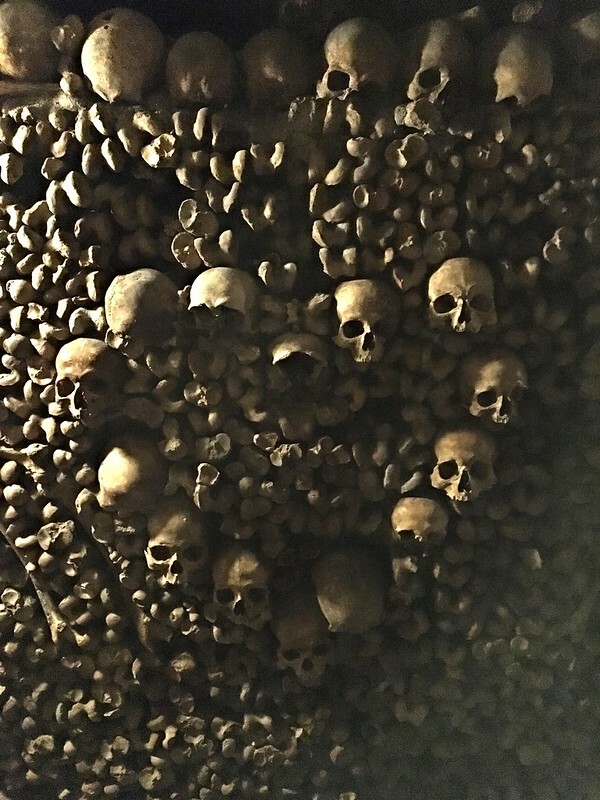 It gave us some context and history behind the catacombs. 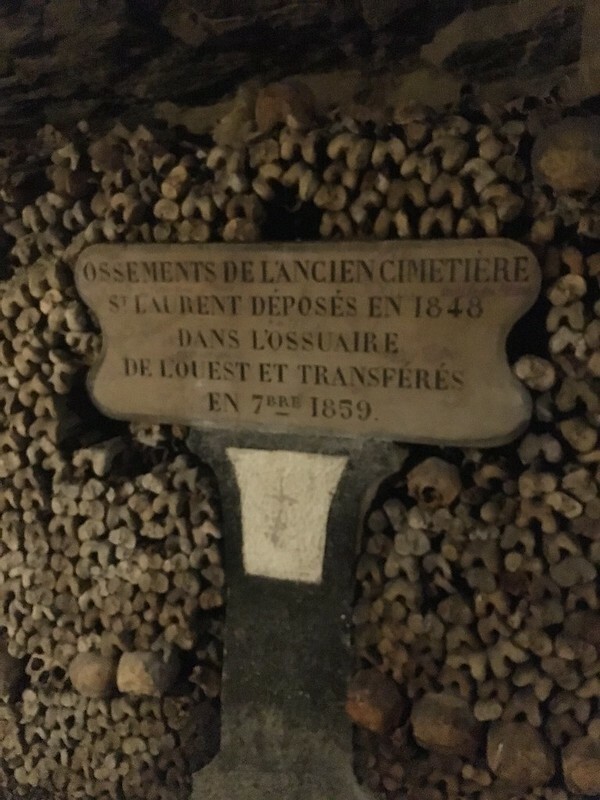 It was constructed because the Kingdom back then ran out of room to bury the dead. 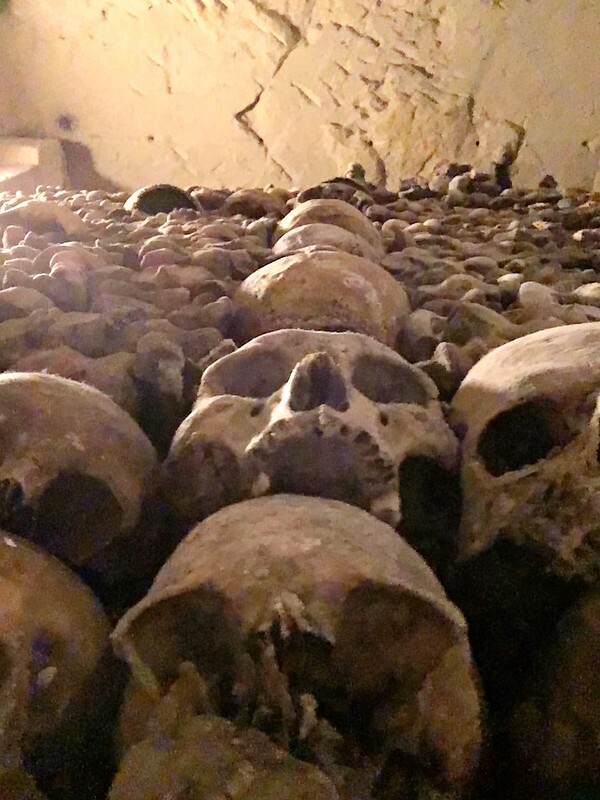 They figured, while not just stack the bodies underground….. Quite an ingenious idea. I mean, they probably knew that one day it was going to be a tourist attraction. Even Napoleon Bonaparte couldn’t resist paying a visit when he came. It might have been better to have a human guide cause it would be storytelling with added drama. 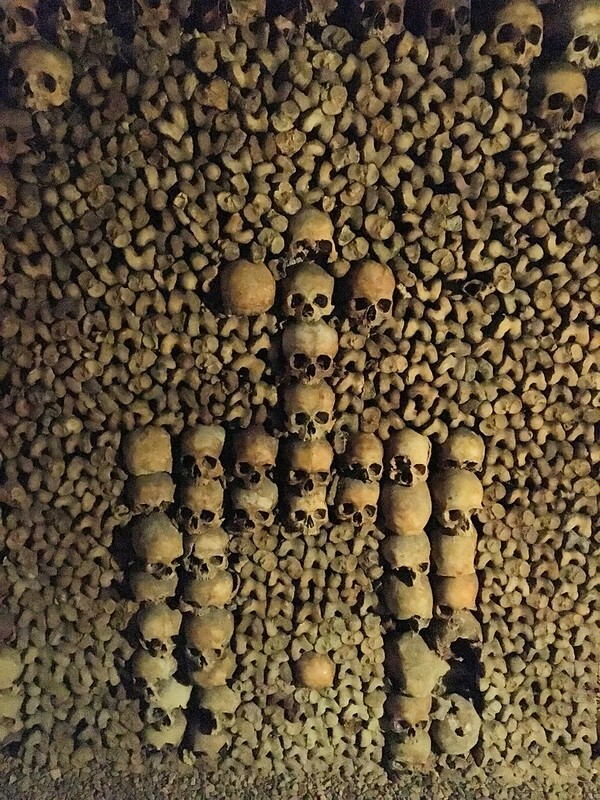 I believe you can get one for €39 as part of a tour group on the day itself. The bonus part is that you don’t have to stand hours in line for the general admission which I think was €12 per entry. 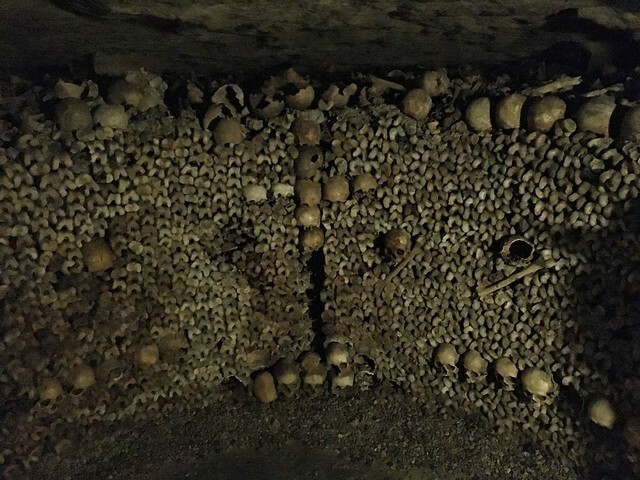 It took us about 2 hours to complete the catacombs and by then, we were hungry. 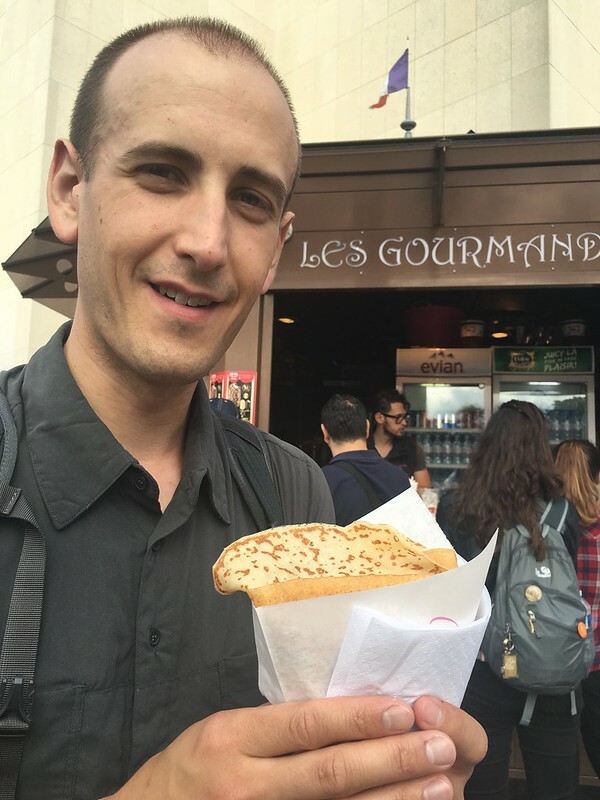 It was time to try the infamous Falafel in Paris as recommended by Bhupinder and Sharn. They really insisted that we eat there no matter rain or shine. 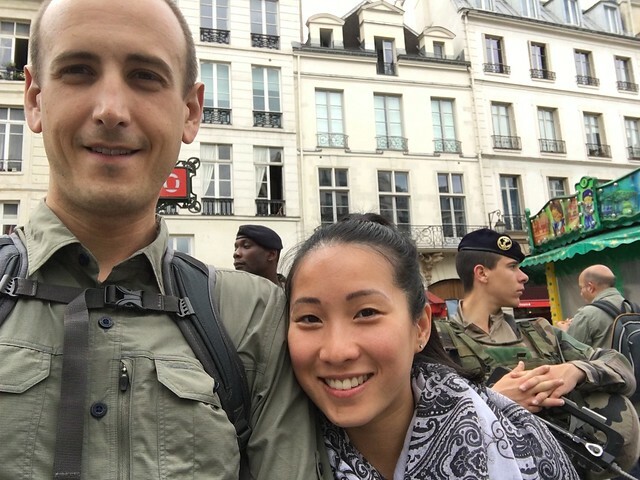 We made our way to the Jewish Quarter and promptly greeted by soldiers bearing heavy guns at the entrance of the train station. 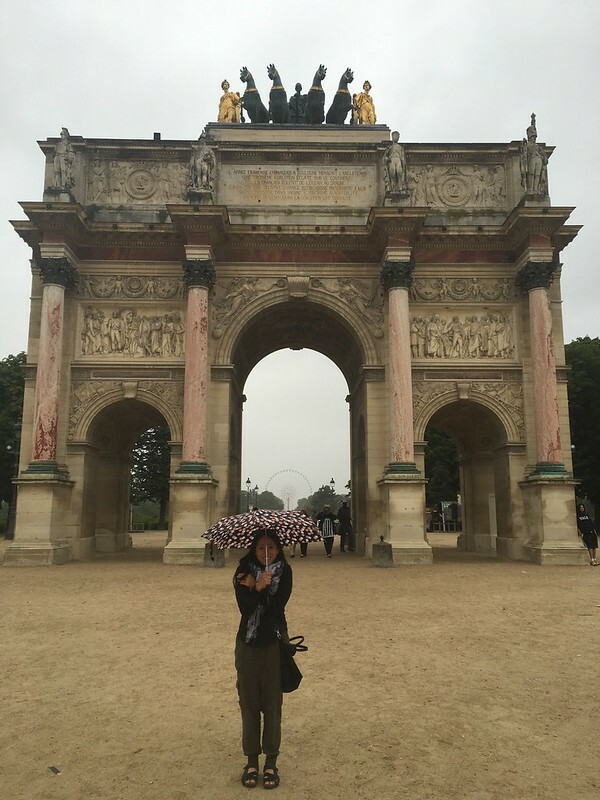 Side note, I was warned by many friends that Paris has a lot of pickpockets. Somehow, the presence of hunky army dudes with AK-47s was a relieving sight and gave me a small sense of security … The irony eh? 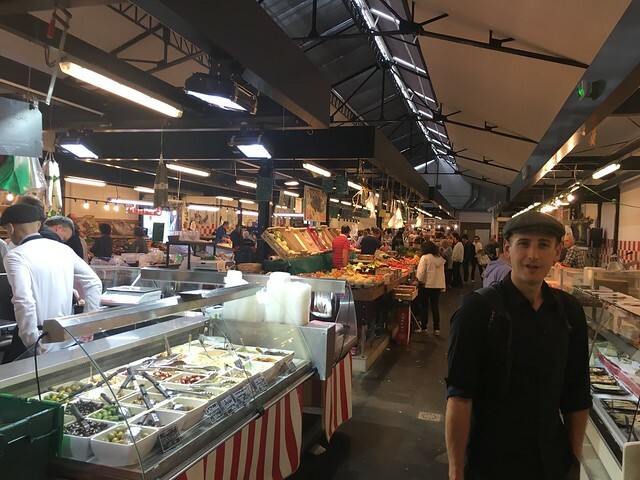 As we walked through the Jewish Quarter, it was so hard to resist the urge to go into all the stores there! It was those boutiquey shops that sells unique clothing and hipster stuff. Arrrgggghhhhh! 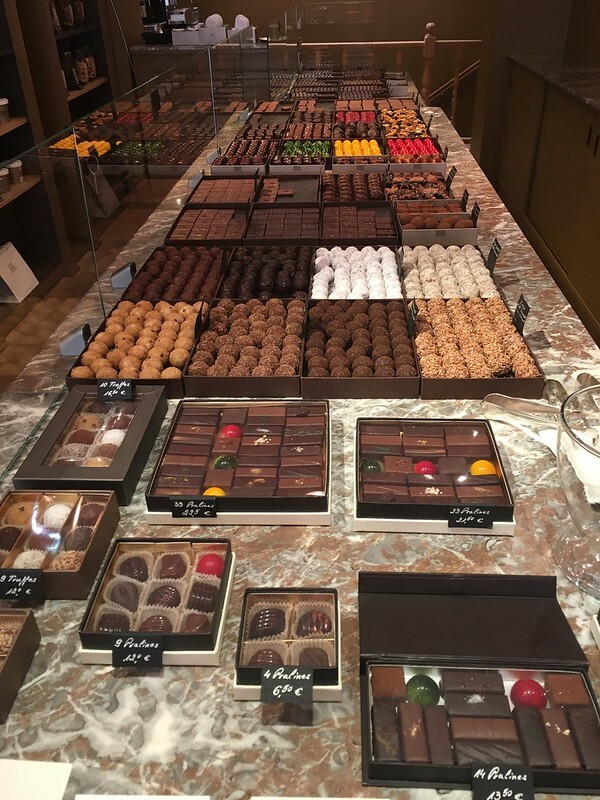 We were hoping for shops like that at Champ Élysées but of course… We kind of regretted not doing do a proper research before dedicating a whole day there …. And now, with barely two hours before we had to be at the central station, we couldn’t really explore the Jewish Quarter. It’s worth spending the day there. So many cute things to see and buy ! We could see the line for L’as Du Falafel from a distance away. There was at least 20 people in line. Must be that good if people are willing to wait! We were slightly nervous about being in that long line cause we didn’t had much time to spare. There was a steady stream of people going in and out. We stood in line for probably, 8 minutes and lo and behold, we were promptly seated with the menus in front of us. 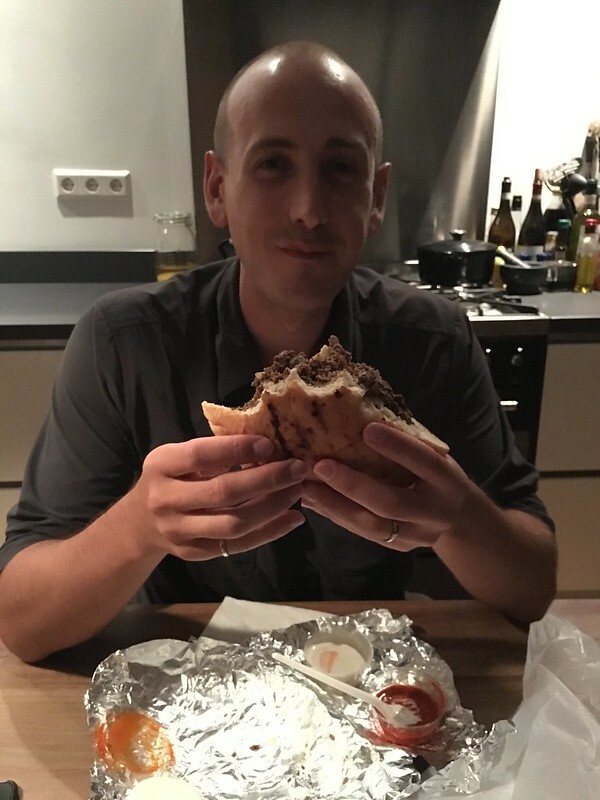 Adam ordered the Falafel special that came with everything and I had the chicken Shwarma. Bhupinder did not lie and I’m so glad he made us promise that we will go to L’as Du Fallafel because it so falafeling good ! We shoved back the food and we were out of the restaurant in 20 minutes. Couldn’t believe that we were in and out so quick and even had some time to spare before heading to the train station. We went into some shops and Adam got himself a scarf. 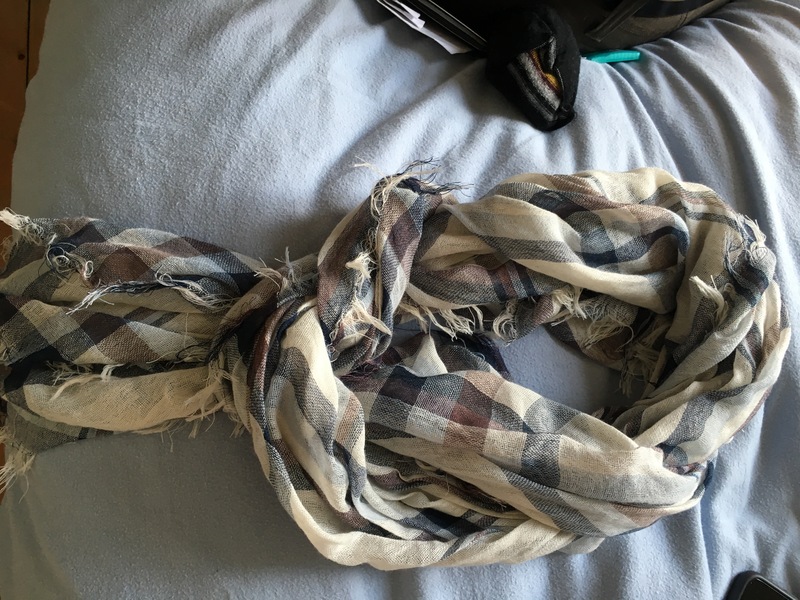 Apparently there’s a special way to the tie scarf… We had to learn how to wear it from the sales guy and now it will remain like this forever. 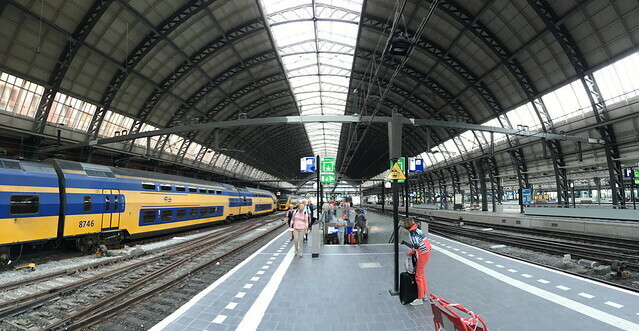 We made it to the central station on time to catch the train to Brussels. 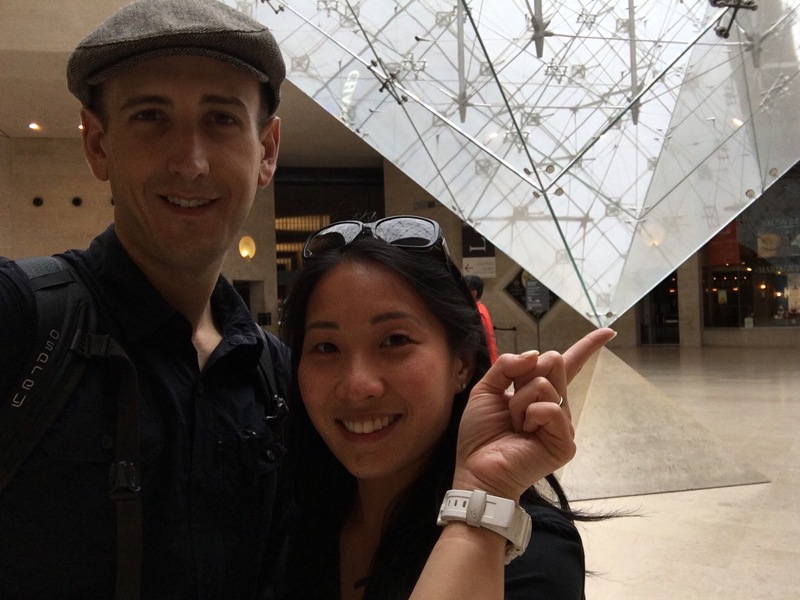 Our Paris trip was certainly short and we didn’t managed to do much in that timeframe. 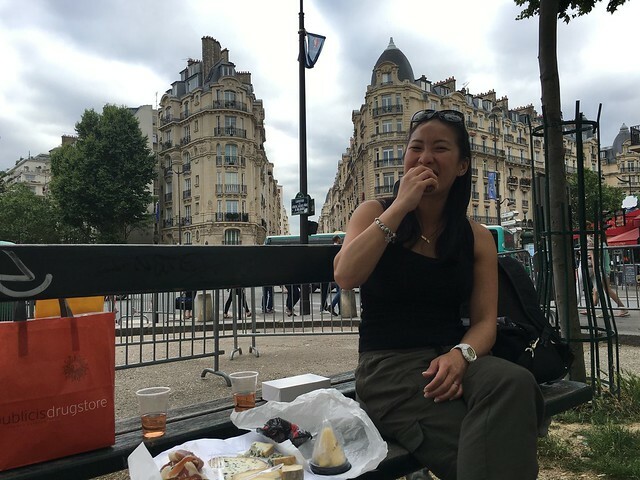 Had we known better, we wouldn’t have spent much time at Champ Élysées but, seeing the infamous flagship Louis Vitton store is a must I supposed… But even that, it was the clientele that amused me more than actually admiring the bags…. Trying hard not to snort at the skinny Chinese boy taking a duck-face selfie with his new LV bag proved to be a challenge. 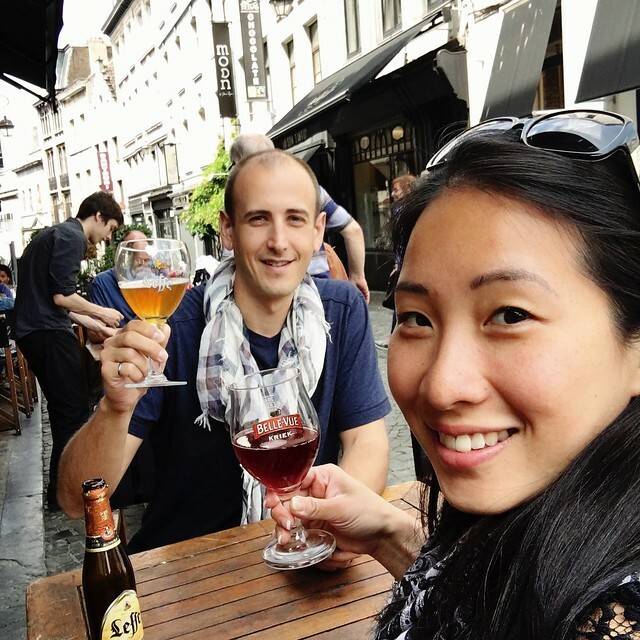 Next up, Brussels – land of Mussels and Fruity Beer! Bonjour, Bonsoir and Au Revoir! That was the extent of my French, unfortunately. It’s true when people say, there’s something romantic about the French. Perhaps it is the language or kissing in from of the Eiffel Tower. 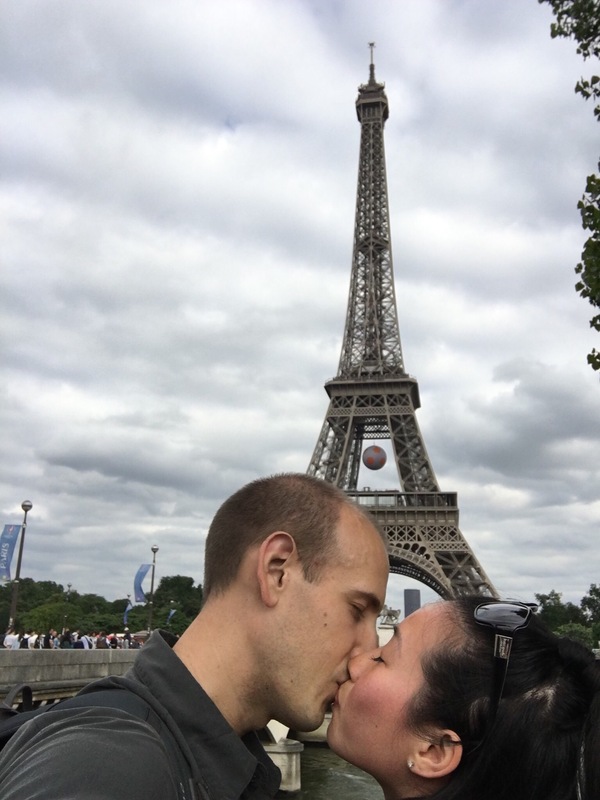 Either way, our short and sweet trip to Paris gave us a compelling reason to come back. That being said, one must go to Paris and not scrimp on accommodation. We’ve learned our lesson quite well. 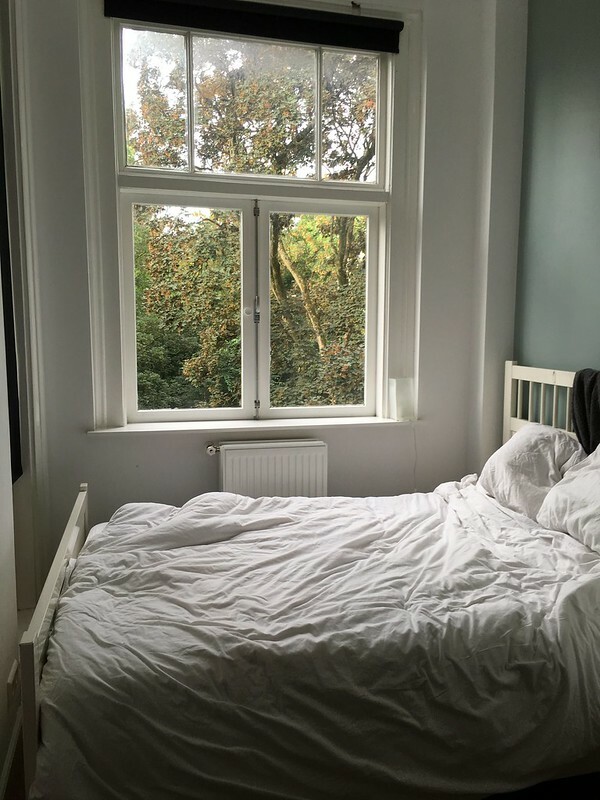 We booked an AirBnB place for 3 nights and it was about $45 per night. Total steal! 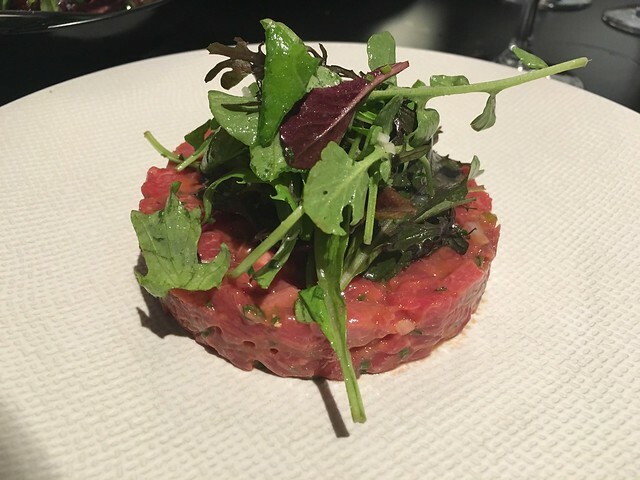 At least 30+ raving reviews on the place and the pictures showed a quirky Parisian space. Can’t go wrong with that eh? Boy …. we were so wrong! We Uber’ed from the airport to Charenton Le Pont which was about an hour ride. By the way, it took us an hour to get the Uber because the app told us to wait at the departure level instead of the arrival one. We watched our Uber driver whizz past us over and over again on the app like it was a video game. He probably made about 10 rounds around the entire airport until he finally found us. We felt so bad but luckily he was so nice about it. 5 stars for you Mohammad ! By midnight, we arrived at this little door that lead into this apartment alley. 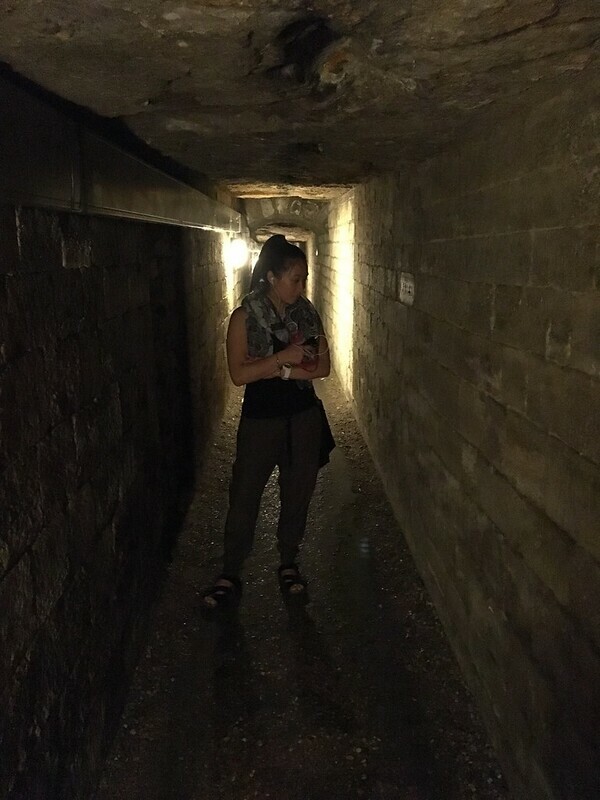 The host left explicit instructions on how to find the key and we managed to wrestle ourselves in through the door and incredibly narrow entrance with our ginormous backpacks in the dark. Up the tight staircase, and through the cluttered hallway, we found our room. The host was still awake when we arrived. She briefed us on the ABCs of the flat and gave us a tour. Apparently a cleaner comes in every so often…. I think she has magazines collected since the 80s…. I thank god each time I was able to get through the staircase without breaking my neck. That was the least of our problems. 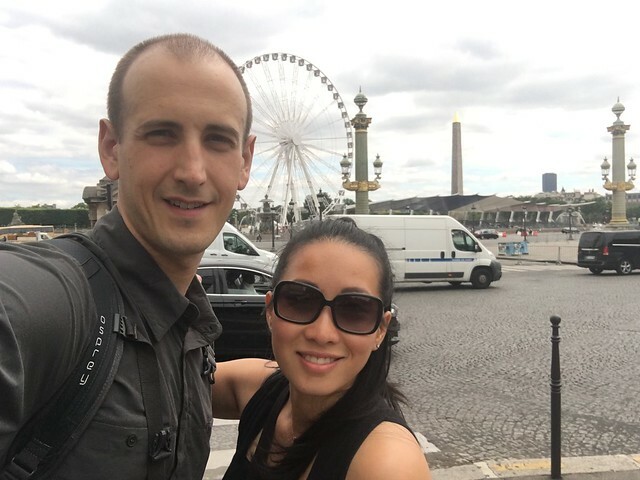 Without going into a rant about how uncomfortable our stay was in Paris, it was probably the worst AirBnB experience we’ve had so far. At least it was very cheap. 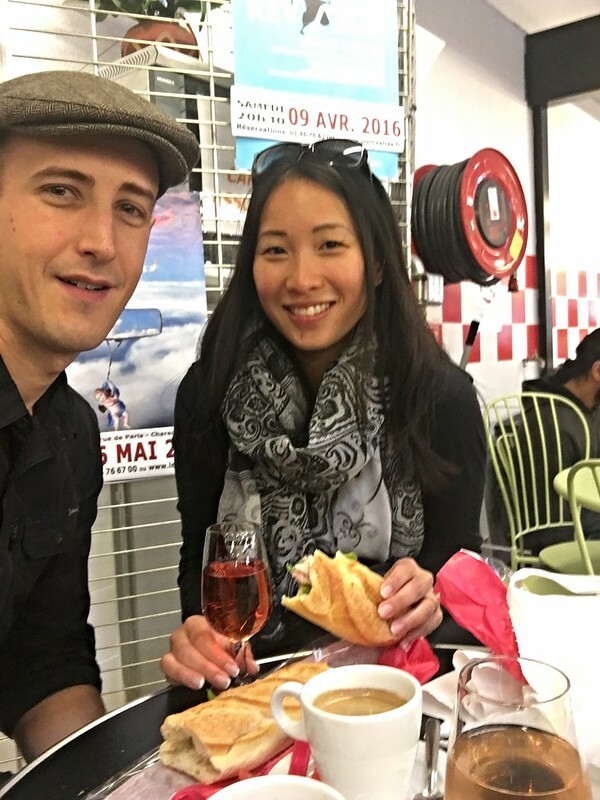 We had more money to spend on food instead so a lot of croissants, cheeses and wine made up for it! On our first day, we didn’t have any specific plans. We figured it would be nice to wander around the neighbourhood and get breakfast at some cafe. After aimlessly walking a couple blocks, we found a market ! 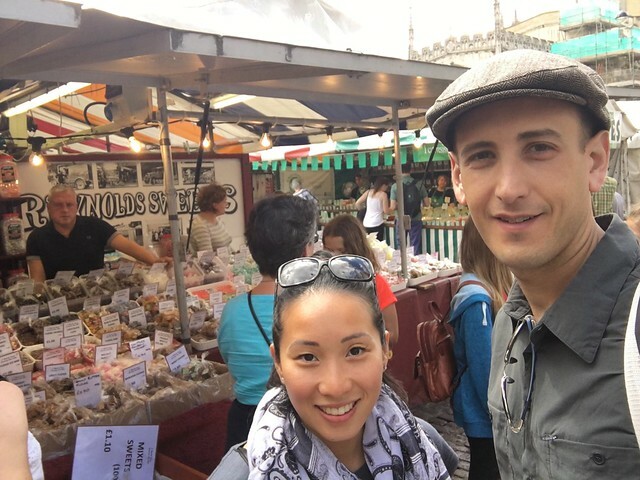 We love markets! 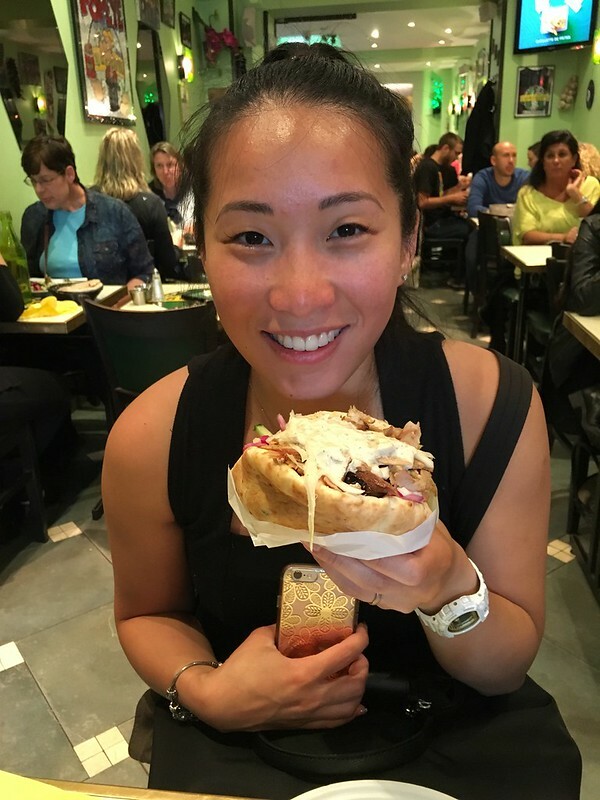 It’s the best way to see and experience the local food and culture. Unless of course if it’s in a super touristy area. This market however was a small one and we were there only tourist there ! 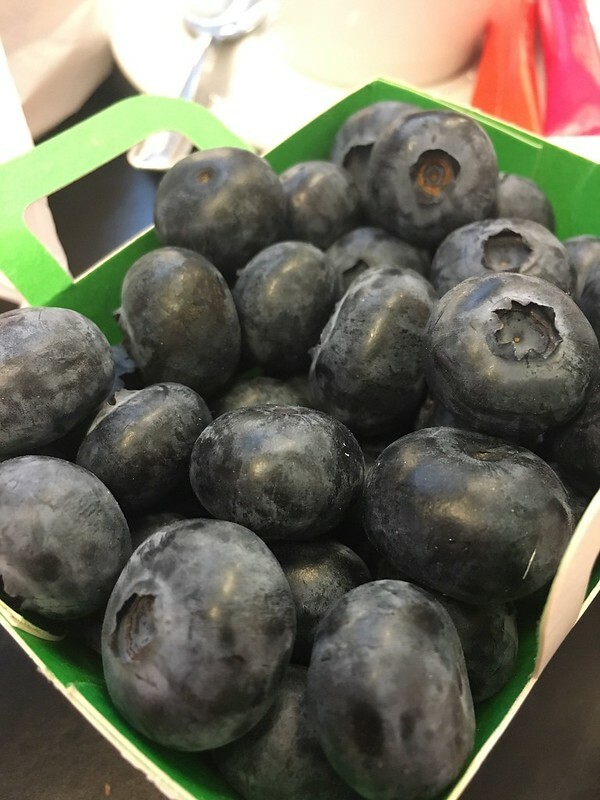 The blueberries were so big, juicy and expensive … 5 Euros ….. 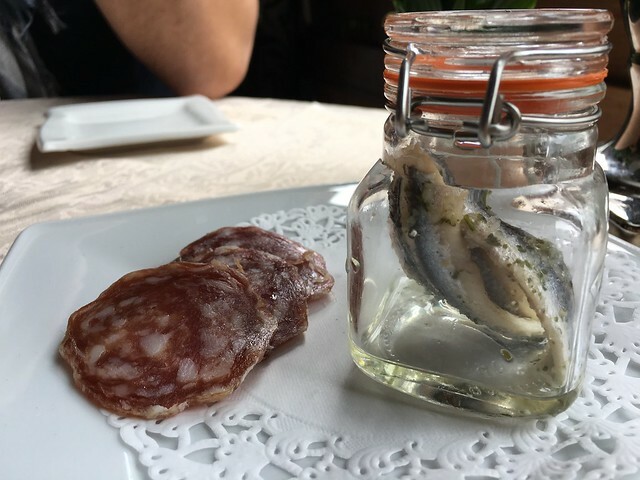 This was 10 Euros with 2 glasses of wine ! After a wonderful breakfast, we decided to walk towards the city. I prefer walking because it’s one of the better way to truly see a place. Trains are more convenient if there’s a specific place and time but walking aimlessly is the best way to stumble upon little gems off the beaten path. 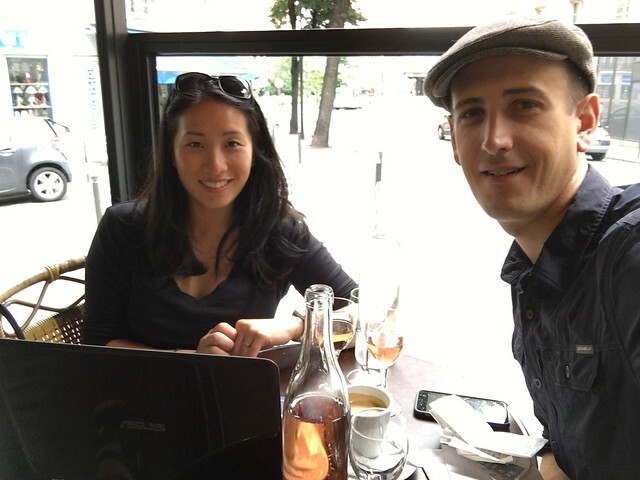 We came across a cafe and decided to hang out there for a while and drink wine of course! Around evening, we decided to head towards the city centre to look for dinner. 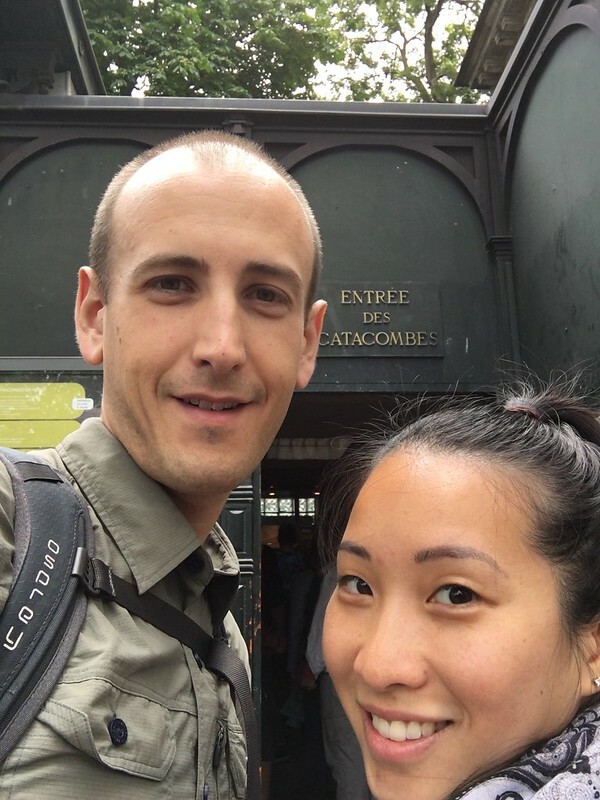 We Googled for restaurants around the area and went La Régalade which had fairly high ratings on Google. 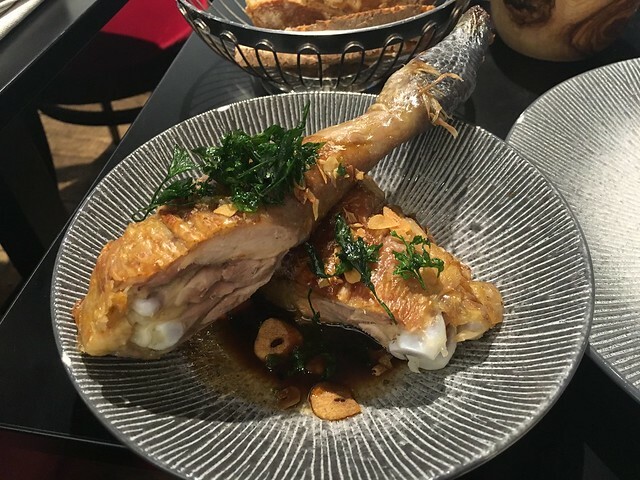 Unfortunately, our first dinner in Paris was kind of disappointing. Adam didn’t like his steak tartar cause it was under seasoned. 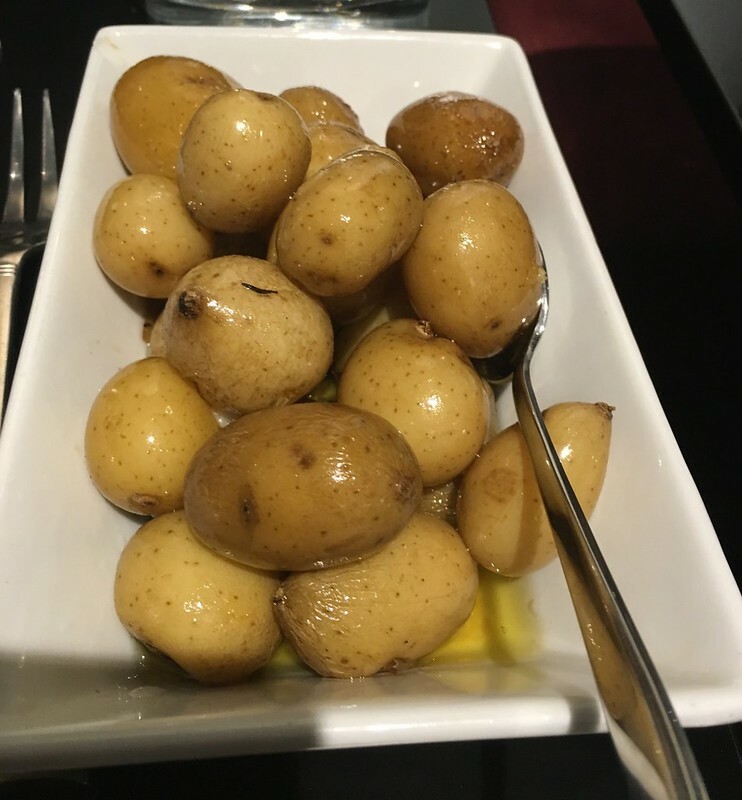 Waaaaay too much potato and it was bland….. 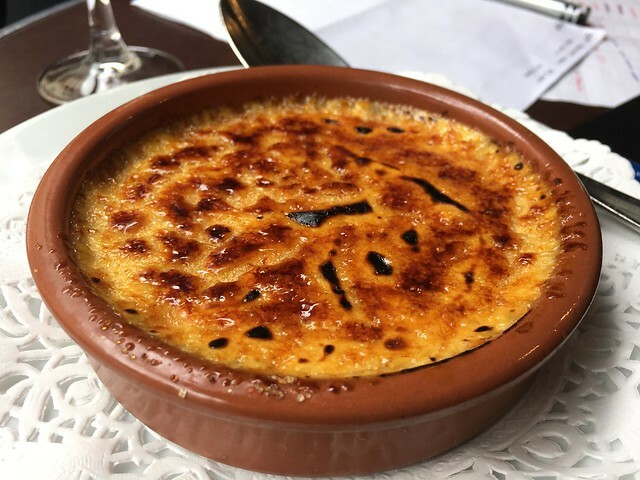 I think we have extremely high expectations of French food that every restaurant in Paris would be a gastronomic experience. Yeah I know it’s a ridiculous expectation to have…. Especially for a place that serve buffet for the appetizers and dessert. Google, I’m disappointed with you ! 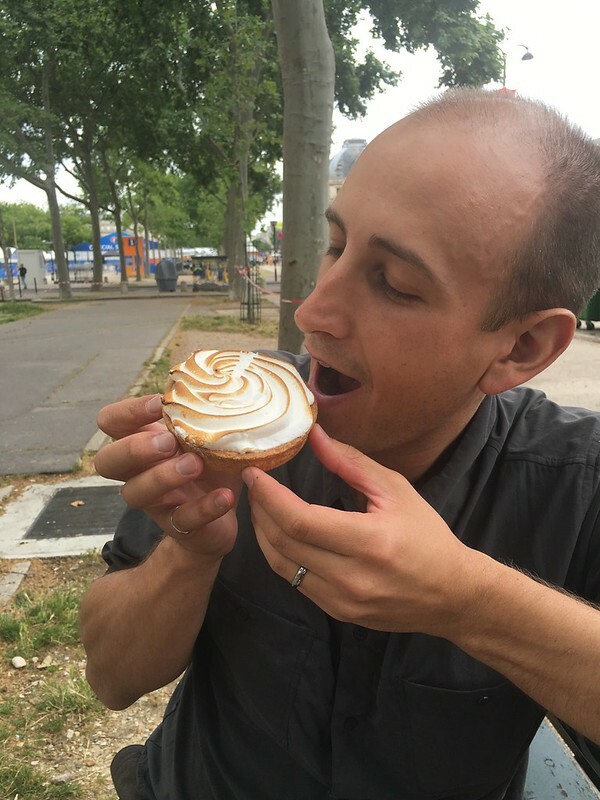 On the third day, we decided to check out the famous Champ Élysées. We knew that we had to avoid the temptation to shop at Champ Élysées but surprisingly it wasn’t too difficult at all. In fact we were shocked that we didn’t had any interest to shop. We had breakfast at one of the cafes on the Main Street. Bad idea. 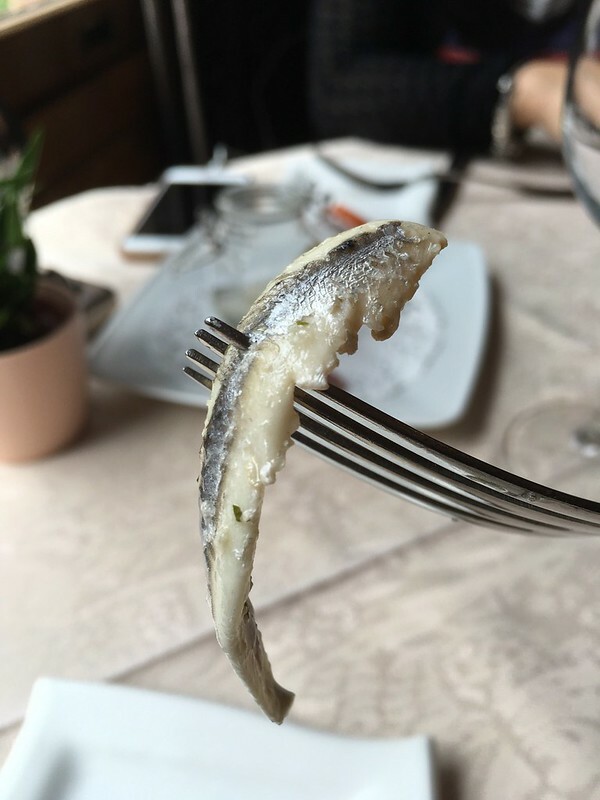 It was expensive and the food was …. Mediocre. Obligatory picture with the infamous arc surrounded with tourist and a wedding photoshoot to boot! We bought some bread and butter from a drugstore. Actually, it’s a fancy drugstore / cafe / upscale grocery store or whatever you want to call it. Joel Roubuchon’s restaurant was in the basement of this store. The fight was real when Adam pulled us both away from the stairwell. 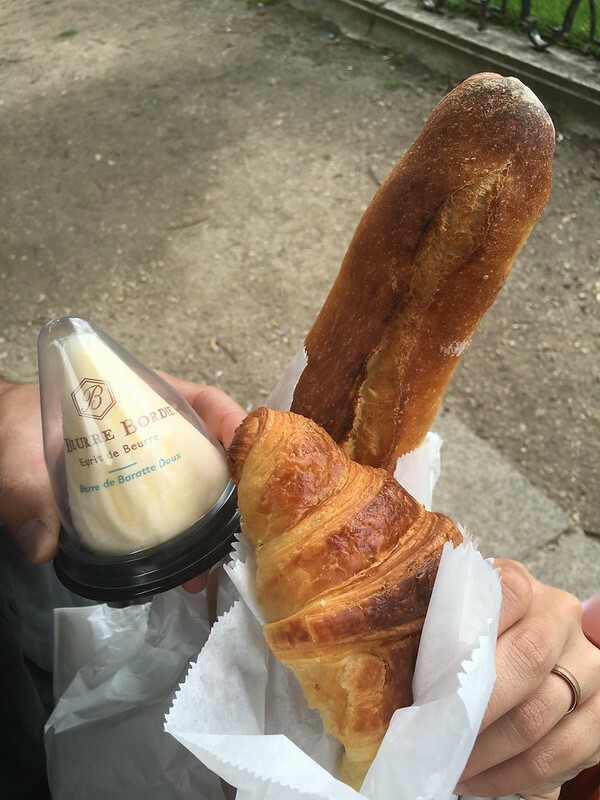 Our friend Sharn told us to try the infamous (everything French is famous here) Buerre Bordier butter. 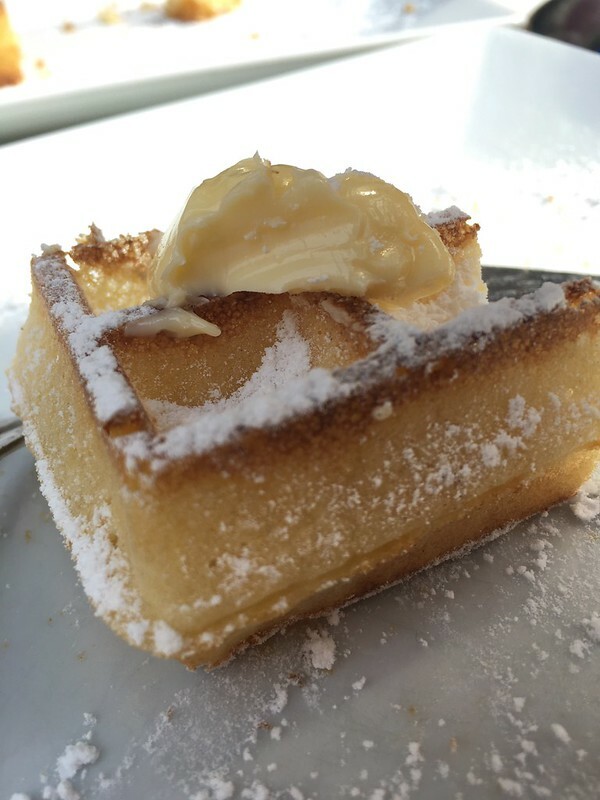 The infamous Bordier butter was certainly very rich and decadent with the already buttery croissant. I was sort of hunting for a light jacket cause my Baubax was getting too heavy to lug around. I wanted to check out Moncler cause it’s a famous French winter wear brand. Google maps led us to a street that had all the premium brands …. Temptation was still check. 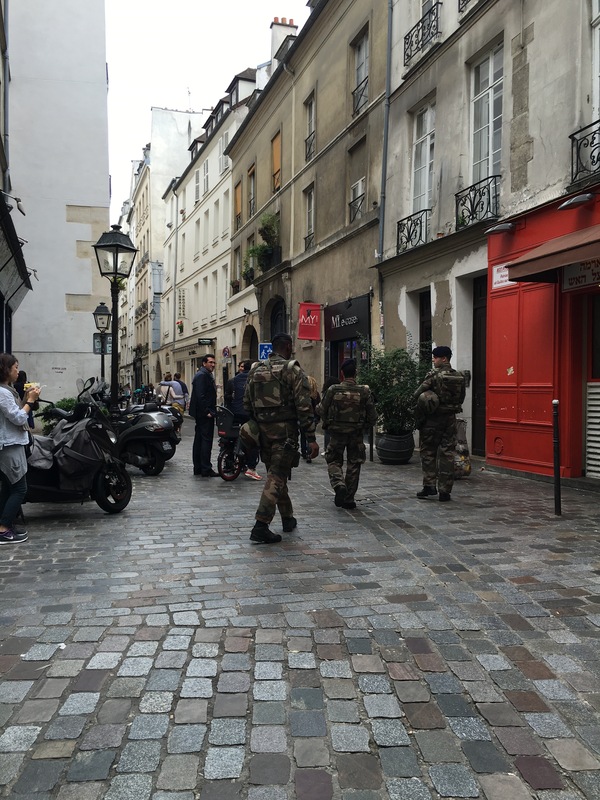 Probably what was distracting us from the stores were the heavy presence of armed security around the street. We thought there must be some important meeting going on around the area. 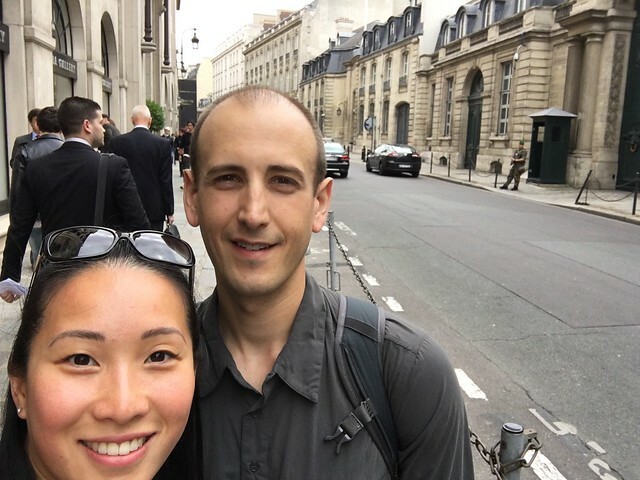 Turned out that we were right by the President’s residence and this was just another day in Paris. 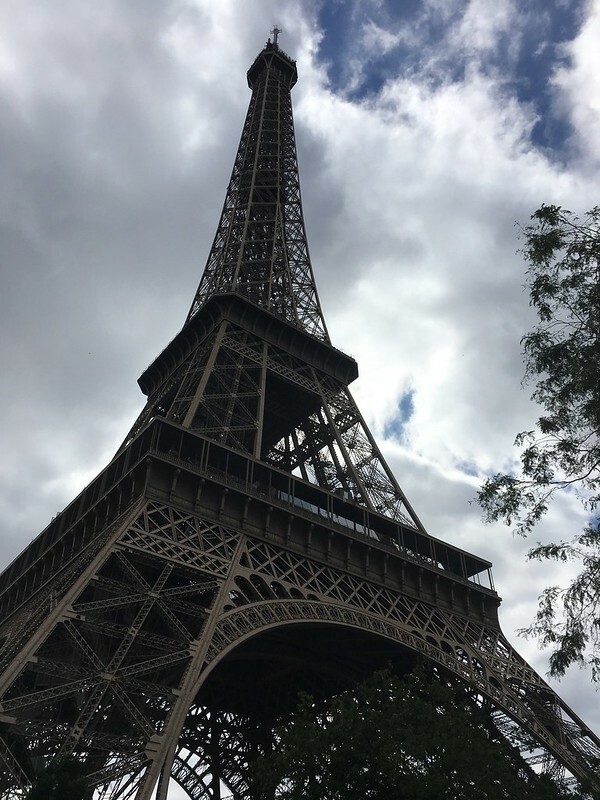 We made our way towards Eiffel Tower. 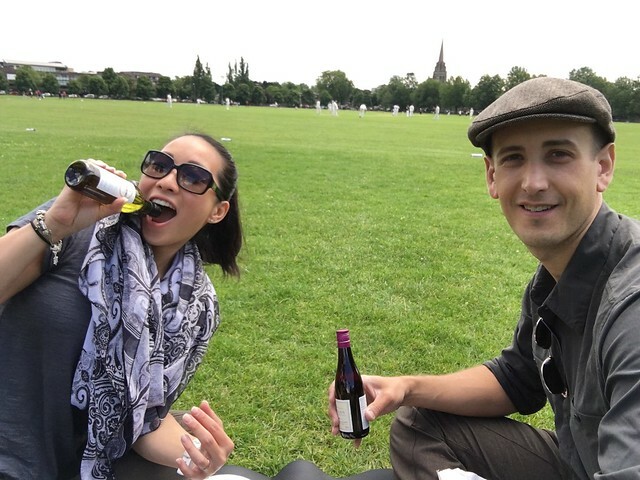 Adam wanted to have a romantic picnic by the park overlooking the tower. Unfortunately for us, the whole park area was blocked off for the Eurocup and there were police guarding every section. To be honest, I don’t remember why we took this picture…. We settled for a picnic on the bench by some random intersection accompanied by pesky pigeons. Oh, I didn’t know pigeons love blue cheese. 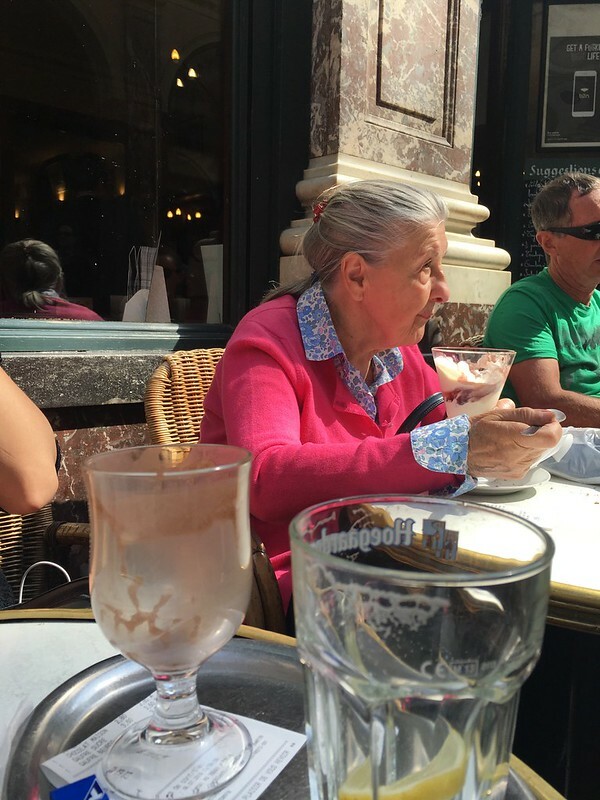 There was probably news about barrage of pigeon poop on tourists that evening…. Nothing to do with me ! 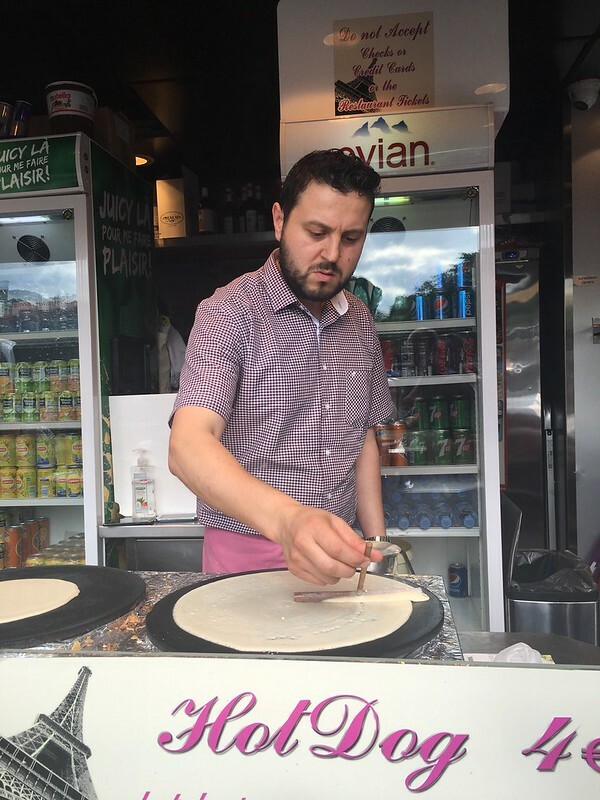 A trip to Paris is incomplete without sampling the crepes! I was a bag of knots worrying about my bag being a victim of the infamous gypsies. I had probably an overdose of paranoia and kept my eye out for them. 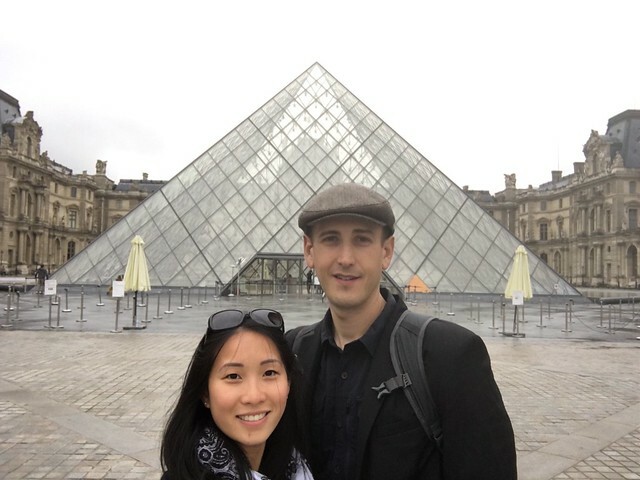 I may or may not have Googled “What do Gypsies look like” prior to this Paris trip ….. Luckily for us, we did not have any problems with the gypsies or any petty crime for that matter. I’ve heard so many horror stories that fueled my paranoia. Perhaps it was the heavy presence of armed forces patrolling around the busy areas kept them away or the stories were just myths to scare wimps like me. For dinner, we went to Chez Andre as our friends had recommended it to us. 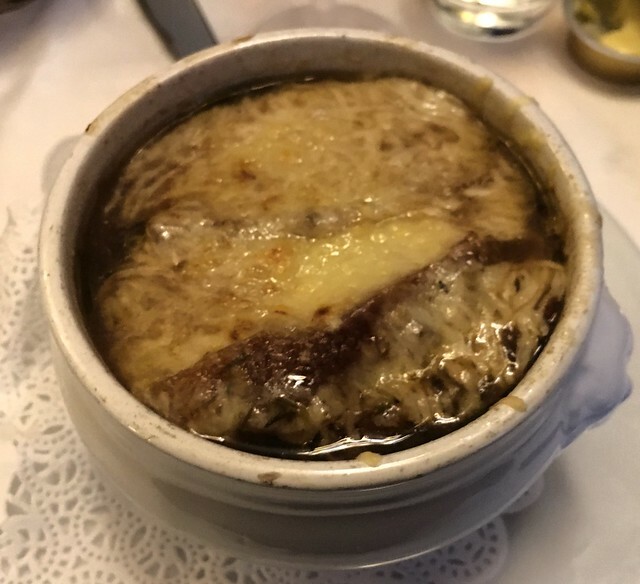 When in France, one must drink French onion soup and eat snails. 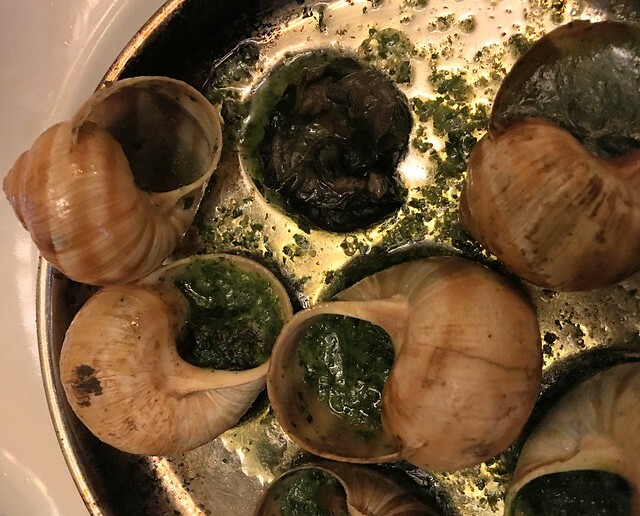 The soup and the escargot was very good! I don’t think I’ve ever had a French soup that was as good as this one. We can’t say the same about the Poisson meunière fish…. 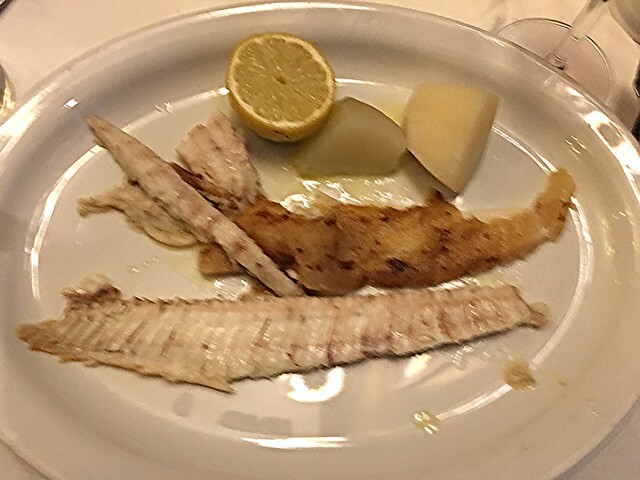 which is basically pan-fried fish in butter and lemon juice. Presentation was far from desirable and the potatoes were just boiled plain without any seasoning! Such atrocity ! After dinner, we went home and proceed to find a stranger’s leg poking out through a curtain in the corner of the hallway (we actually didn’t know there was even a place to sleep there) and the smell of cigarette smoke was so overwhelming that it was offensive. It was annoying that the host did not inform us that there was going to be another person sharing the space. I think it’s just plain courtesy to inform your guest about additional guest or strangers for that matter. 6 people sharing this borderline hoarder’s place and a dingy washroom was worst than a hostel. 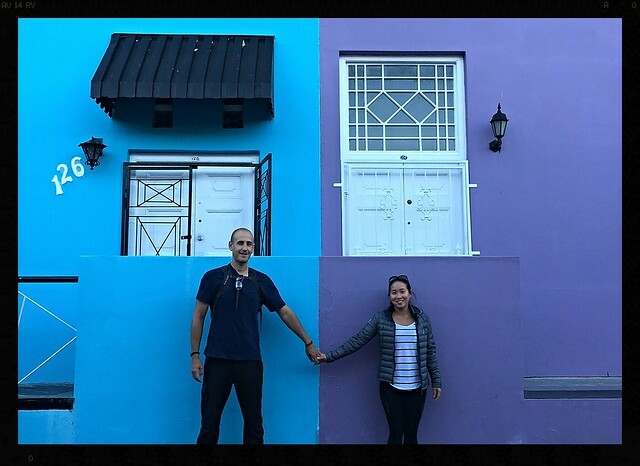 Suffice to say, we were careful on picking our other Airbnb accommodations and pay a little more than $40 a night. 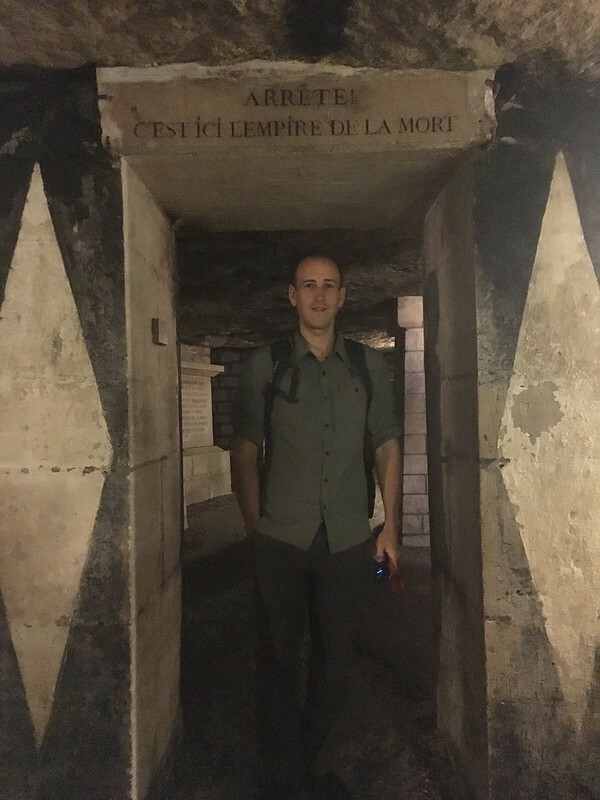 Next up, Catacombs of Paris and the best falafel in the world ! It’s been tough getting good internet connection throughout the travels… hence the lack of updates here. But, we want to let you know that we are alive and well in Durban, South Africa! We just attended Myz and Sim’s wedding in Durban and experienced the warm hospitality of the Durbanites (not sure if this word even exist). Next location, Mombasa and the Masai Mara in Kenya! We had a quick breakfast of ginger yogurt, Icelandic cereal and 2 bites of Melton Mowbray pork pie, which we would do well to forget. Left-hand driving, round 2. This time en route from London to Sheffield via Cambridge. I had expected keeping to the proper side of the street would be most challenging but this was actually quite easy. Lane positioning and navigating proved difficult, however. My driving was successful in that I remained collision-free throughout our time in the UK, but it was admittedly stressful. 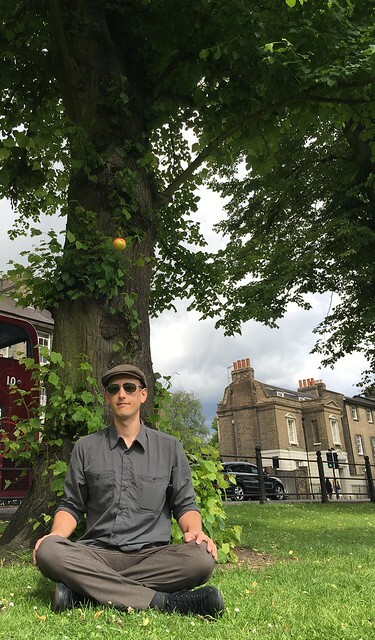 All highways in England seem to be lined with thick green trees with the occasional view of farmland, so the scenery wasn’t anything to write home about. But we did stay entertained with BBC radio’s coverage of the Brexit aftermath. High profile resignations, double-talking politicians, speculation and opinion pieces filled the airwaves. Finally! 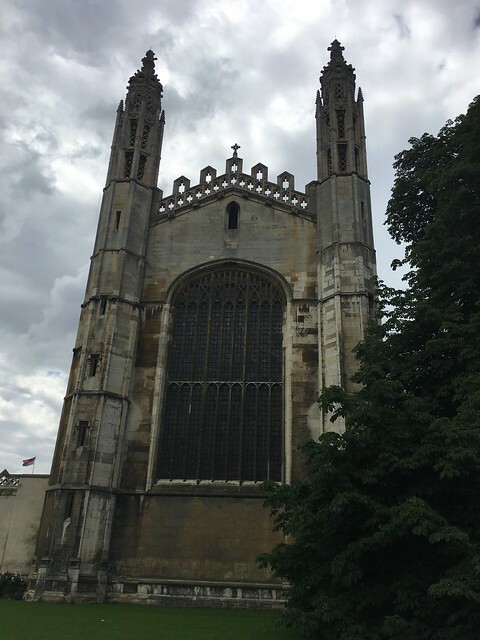 We arrived in Cambridge, which has a very different look and feel to that of London. Much more regal and prestigious. A town that embodies academia, perhaps precipitated from its reputation. Parking proved to be a challenge and we resigned ourselves to a car lot that was certain to gouge us later. 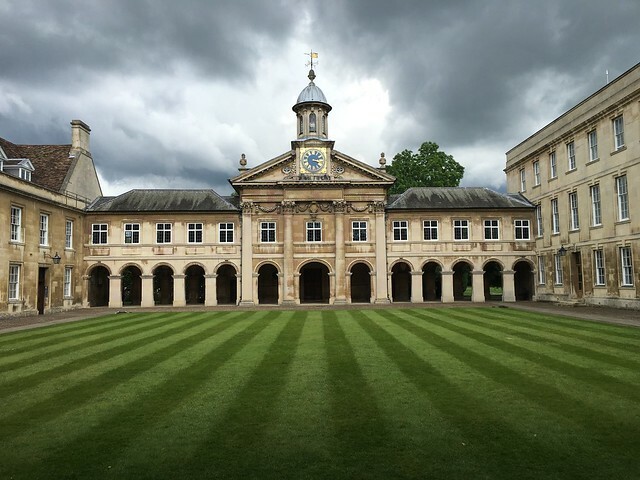 In the centre of town, amidst stores and cafes, the university campus was all around us. 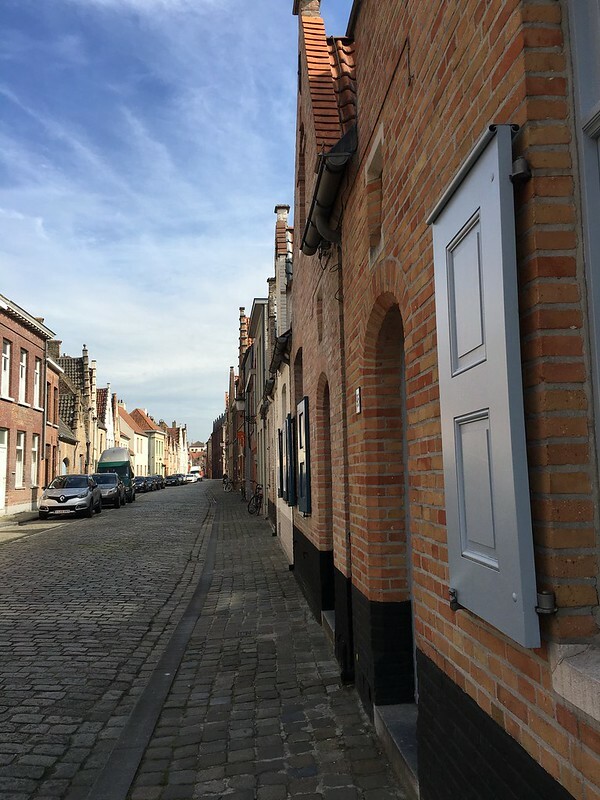 There were winding narrow streets and beautiful old buildings at every turn. 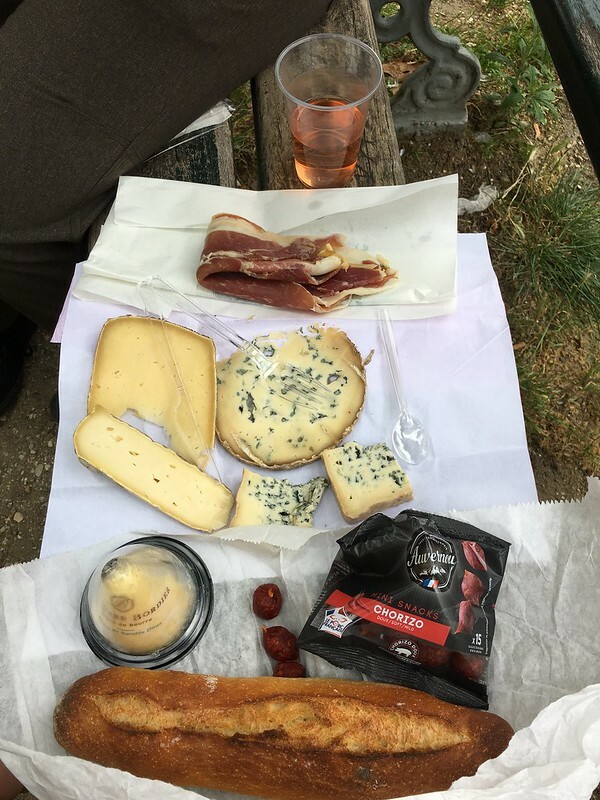 We came to an open air market and decided a picnic was in order. 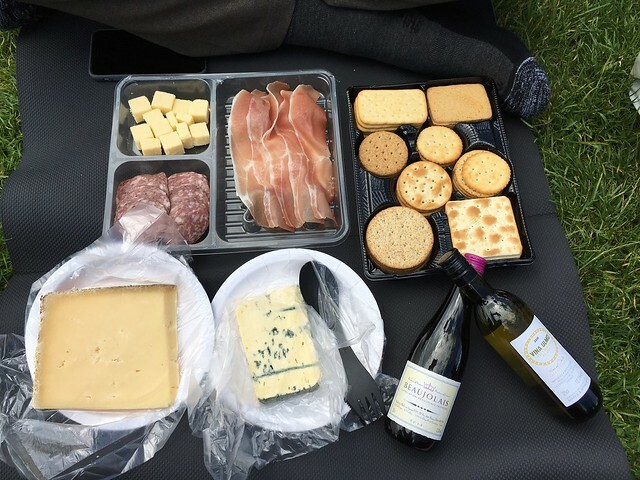 Stocked with stilton and aged white cheddar from ‘the guy on the corner’, a convenient charcuterie tray, crackers and 2 little bottles of wine from Marks and Spencer and we were ready. A short walk and we were on a cricket pitch laying out Rachel’s yoga mat to set up our feast. 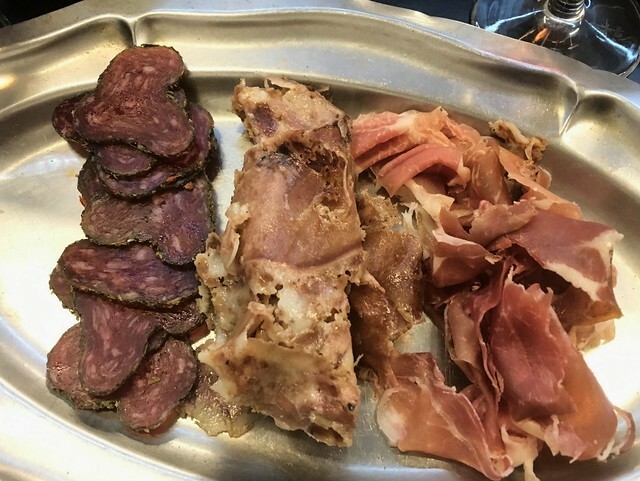 The tray from Marks and Spencer’s included air dried beer brined ham, Cumberland style salami, and mild Lancashire cheese. The Stilton we got at the market was our favourite, but it was all so tasty. 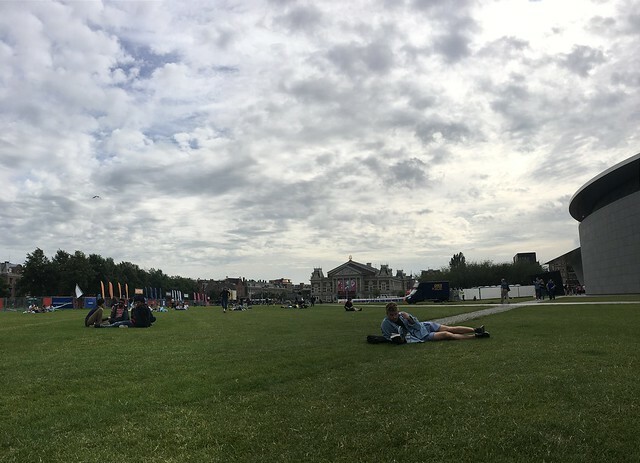 So nice to relax in the park, eating and watching the cricket match, totally oblivious to what they were doing. 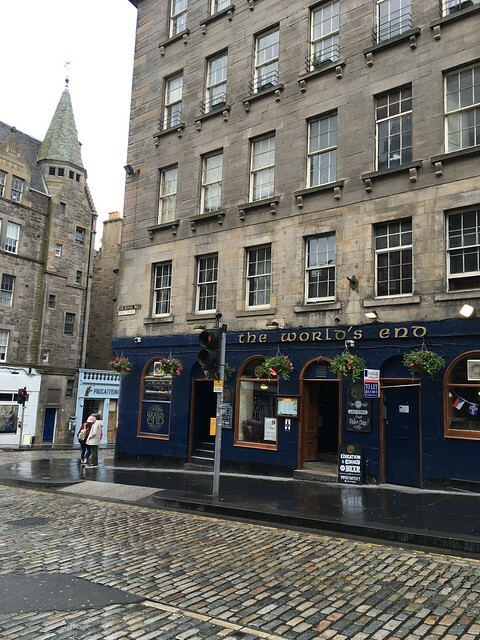 We pondered how many great minds had frequented that very spot? Did a young Stephen Hawking lay on that grass dreaming of stars collapsing to infinite density? Did Oppenheimer imagine he would become a destroyer of worlds? Did Charles Darwin ponder the origins of life? Did an apple deliver a mild concussion to Isaac Newton? Did John Cleese perfect funny walking? 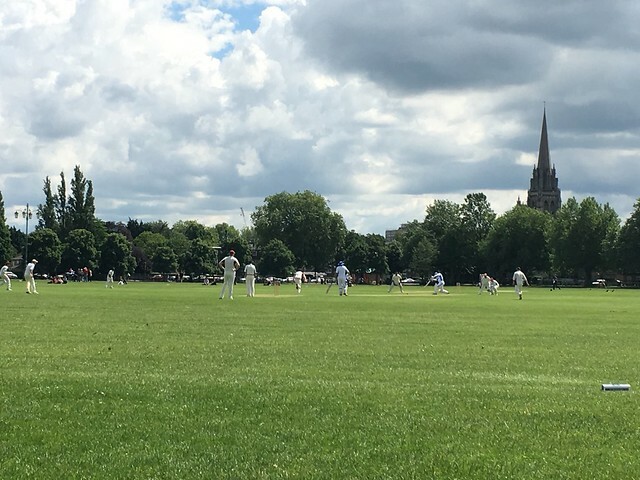 Even if they and so many others had been at that park, perhaps they were simply as bewildered by the cricket as Rachel and I. We stopped for a coffee and hot chocolate before lining up for our car lot gouging. Yup, 24£. Ouch! 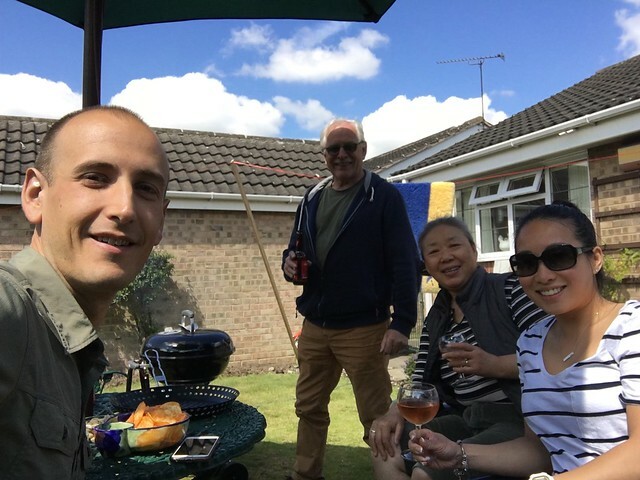 The drive to Sheffield felt quick and we arrived to a very warm welcome at Chris and Qiu Jiang’s house. They are friends of my brother who was nice enough to put us in touch. Although we had just met, they treated us like family. Qiu Jiang prepared a delicious Chinese dinner of hongshao rou (red braised pork belly – Chairman Mao’s favourite dish), stir fried lamb and peppers, stir fried vegetables, and perfectly steamed rice. It was all so tasty. 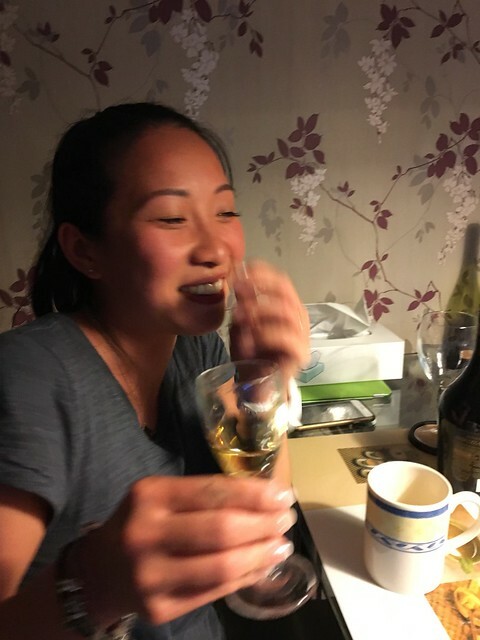 We sat at the table and talked for hours, getting to know each other over wine, brandy, and Niol. Chris explained that Niol is an apple liqueur native to the French country side – near Brittany, I think. 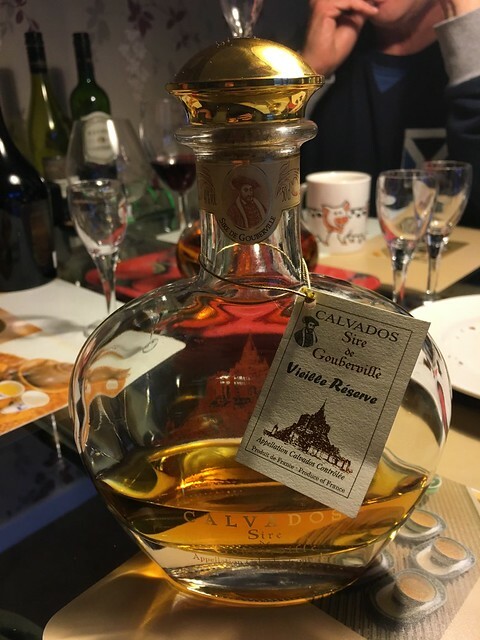 It’s a dying tradition so that bottle may have been among only a few left. It was a little harsh for my liking but so generous of him to share. We woke up the next morning to the smell of bacon. 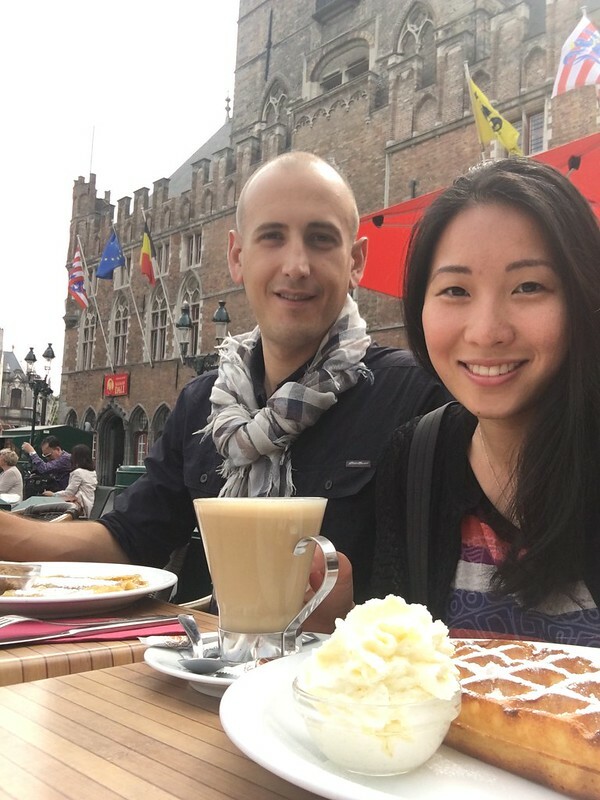 Qiu Jiang was preparing an English breakfast of fried eggs, bacon, baked beans, roasted tomatoes, sautéed mushrooms and toast. What a feast! We continued right where we left the night before, talking around the table. 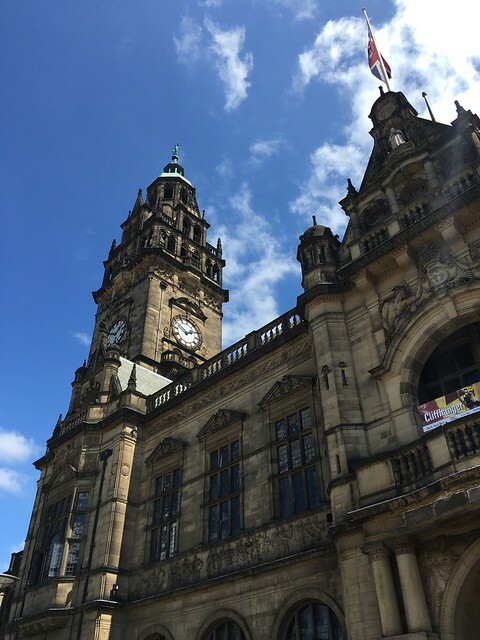 Realizing the day could easily slip away, Chris offered a tour of Sheffield. He drove us through the city and we walked around the downtown core for a couple hours before stopping for coffee by the Millennium Art Gallery and Museum. The city had been a manufacturing and mining hub for some time, and is especially recognized for its cutlery and silver work. We returned home to have a bbq. Qiu Jiang had prepared a variety of marinated meats, cous cous, salad and snacks to enjoy in the yard. Chris fired up the coals and the meats went on the grill. Chicken, sausages, burgers, squid and prawns. 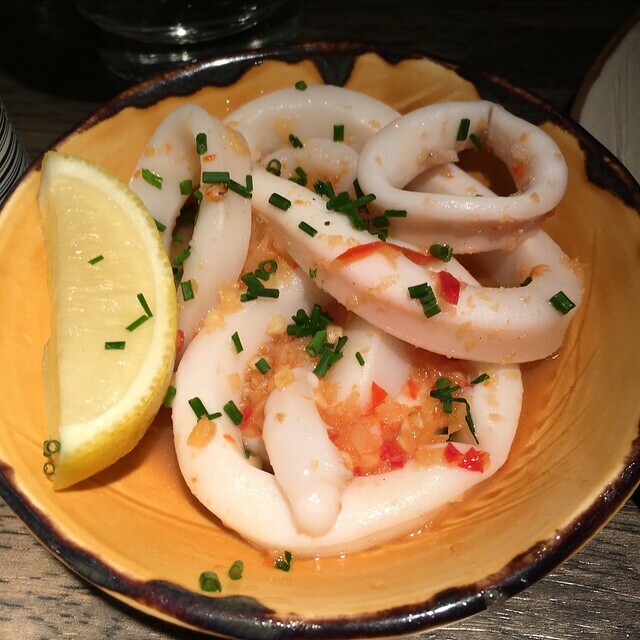 It was all excellent but the squid was terrific. 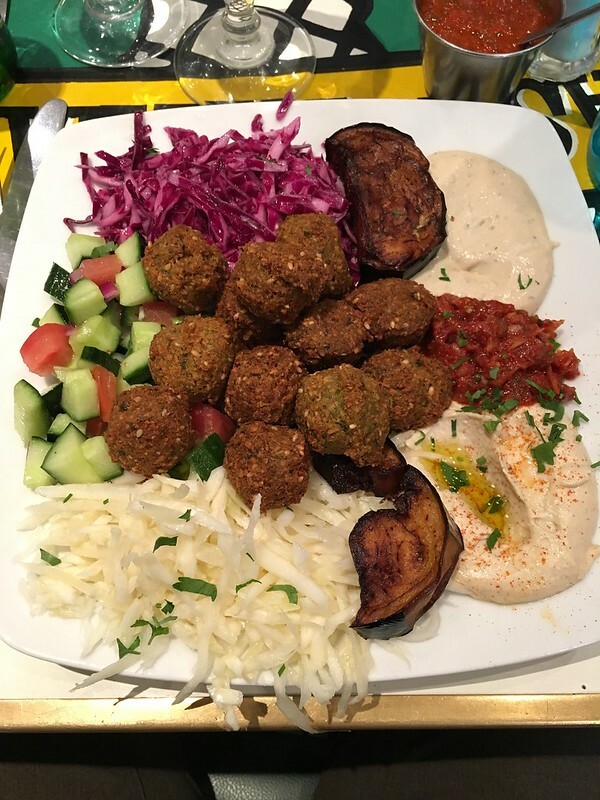 Fresh, flavourful and cooked perfectly. 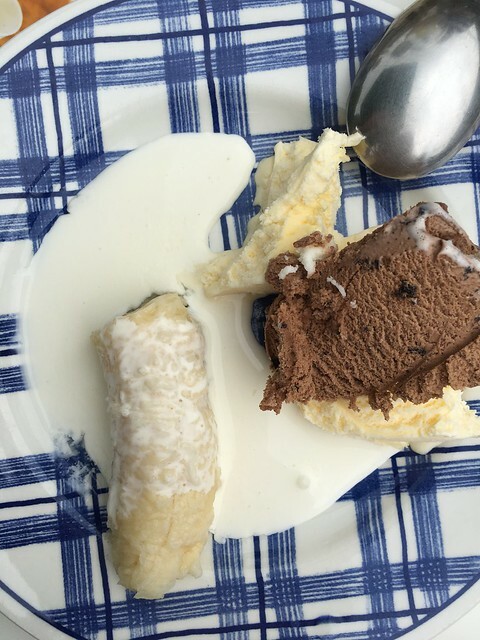 For desert, Chris barbecued bananas and served the melted flesh with fresh cream and some vanilla ice cream. Amazing! We sat and talked as the sun was slowly overtaken by dark clouds. We moved inside as the first drops fell and we sat comfortably around the fireplace with full bellies and a snifter of brandy. The entire evening snuck by us as we sat in that cozy little den while the rain poured outside. 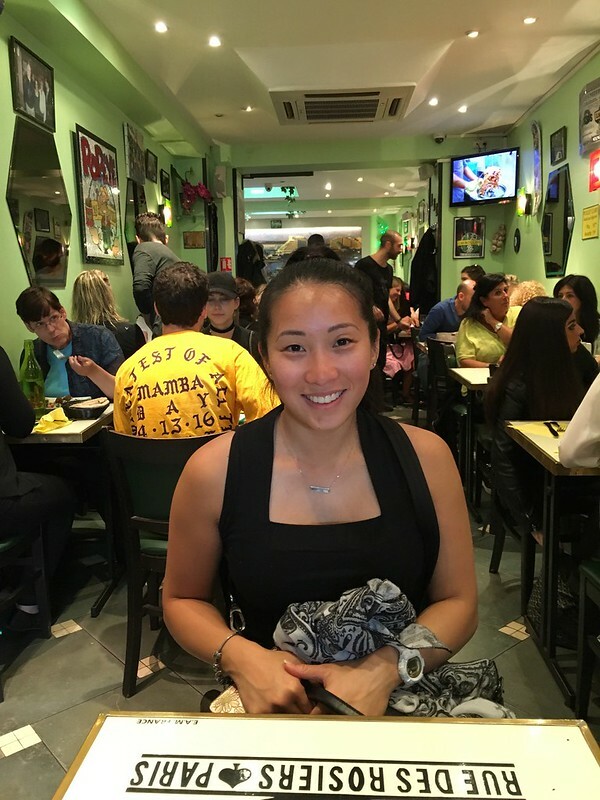 We touched on everything from politics, to religion, education, etc.. Qiu Jiang shared her story of growing up in China and being groomed and trained as an opera singer. After some convincing, she sang to us. Puccini’s Ma Mia Babbino Caro to start. Her heavy Chinese accent somehow vanished and we were left speechless by the power and range of her beautiful voice. That was the piece we had selected for Rachel’s entrance during our wedding procession so it held a special meaning for us. Qiu Jiang continued with a variety of pieces by Mozart, and others. We melted into our seats, totally mesmerized. We were in awe of her ability to create such magnificent sound sitting so casually on the couch. We hadn’t expected that at all but were so thankful for the experience. After a restful sleep and another delicious English breakfast, we packed up and said goodbye to our new friends. 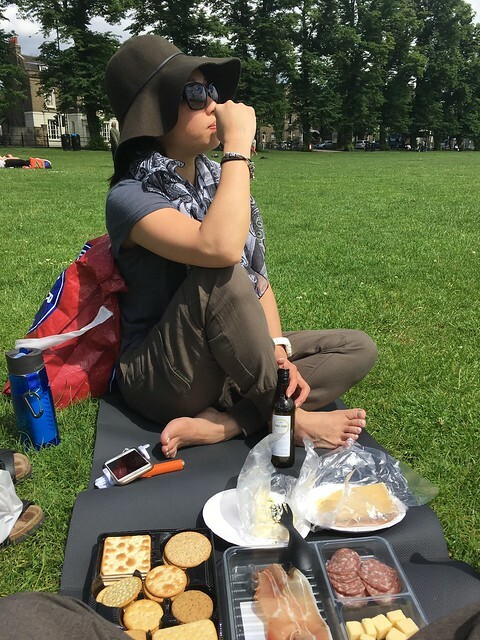 Qiu Jiang had prepared a cranberry, bacon, brie sandwich, a cheese and Branston pickle sandwich, and some fruit and snacks for our journey. 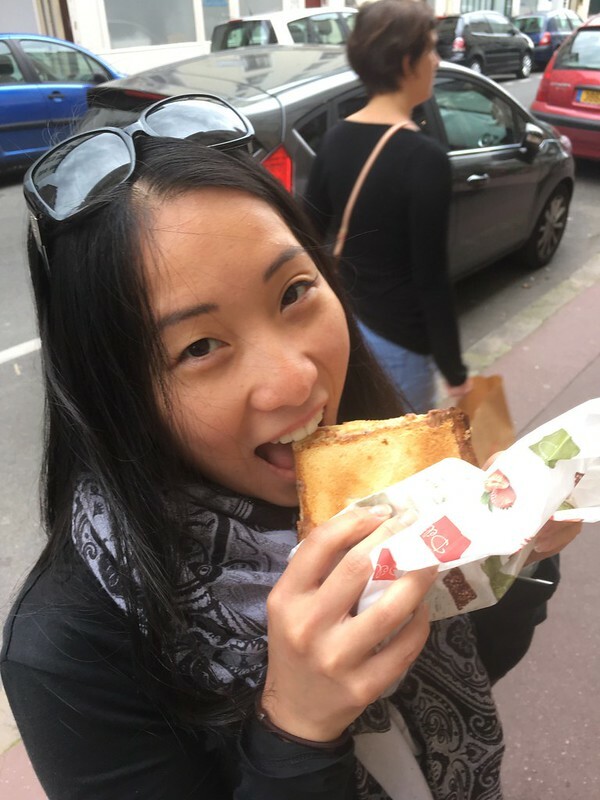 (The brie and bacon sandwich was sooo good!) 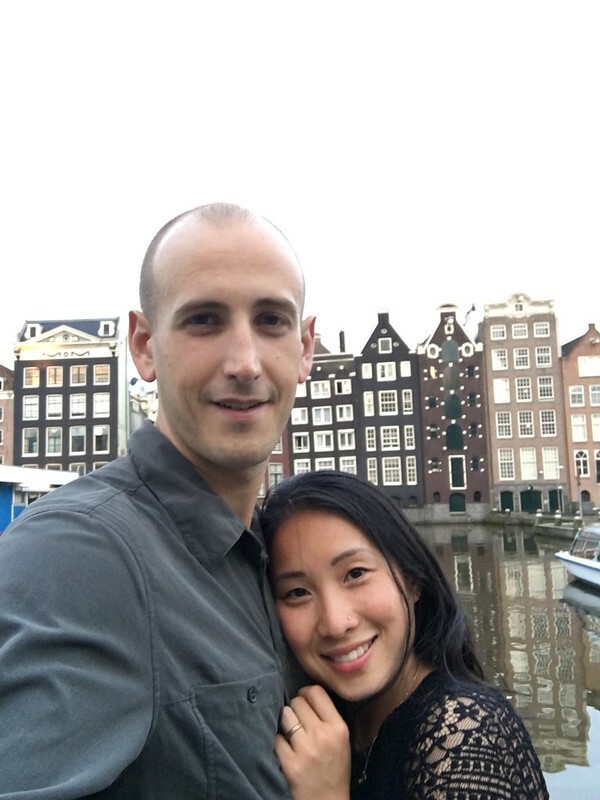 We were thankful for Chris and Qiu Jiang’s overwhelming hospitality. It was a relaxing couple days and so enjoyable to share that time together. 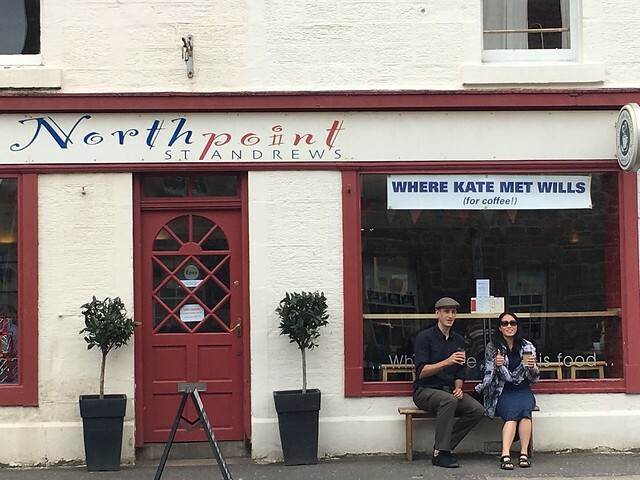 We had a 4 hour drive ahead of us to Edinburgh with a couple stops planned along the way. 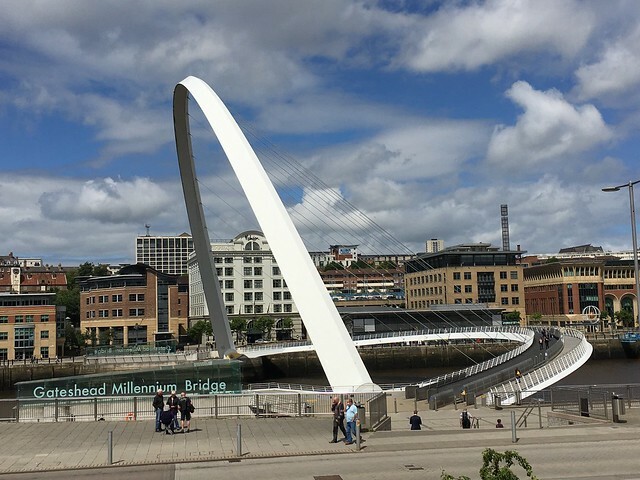 First we came to Newcastle for a quick stop at the Gateshead Millennium Bridge. We wanted to see Hadrian’s Wall so we didn’t stay long in Newcastle. A quick picture at the bridge and we were back on the highway. Google Maps was being difficult again but we eventually found a stretch of Hadrian’s wall at Walltown Crags. There were actually several popular sites within a few miles of each other, but we focused on one where we could hike a short length of the wall. There, the wall snaked along dramatic cliffs, which offered far-reaching views of the countryside. 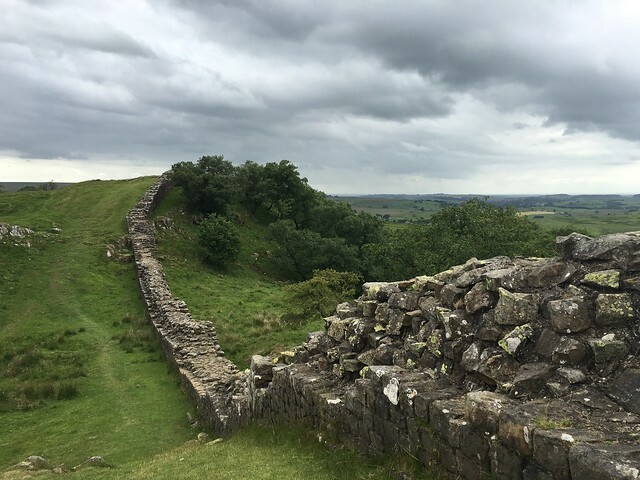 The wall was built at the command of Emperor Hadrian to establish the northern limit of the Roman Empire and keep the barbarians out. Construction started in 122CE and it eventually stretched across the country from east to west coast. You could easily spend a day or even days here, visiting the various Roman ruins and forts and hiking along the wall. But it was lightly raining and we were still several hours from Edinburgh. Satisfied with our brief walk, we got back on the road. Once we entered Scotland, the scenery became gorgeous. Rolling hills and valleys dotted with giant windmills and old towns. After the turn east toward Edinburgh, the highway became only two lanes and narrowly twisted through scenic villages woven into the landscape. We arrived at Rachel’s friend, Su Ying’s apartment shortly after 7pm. 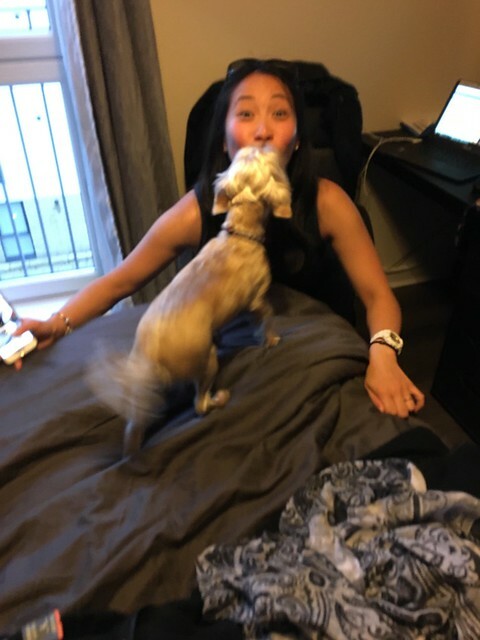 Su Ying greeted us and introduced us to her partner Adri, and her little dog, Keller. They were both very nice and Keller was so cute, jumping and barking with excitement. He reminded us how much we miss Sophie. Rachel caught up with Su Ying in the kitchen as she prepared dinner while Adri and I talked in the living room. Adri was from Columbia doing her masters in education in Edinburgh. Su Ying called us to dinner and we all sat down to a delicious home cooked meal of fried rice and chicken soup. 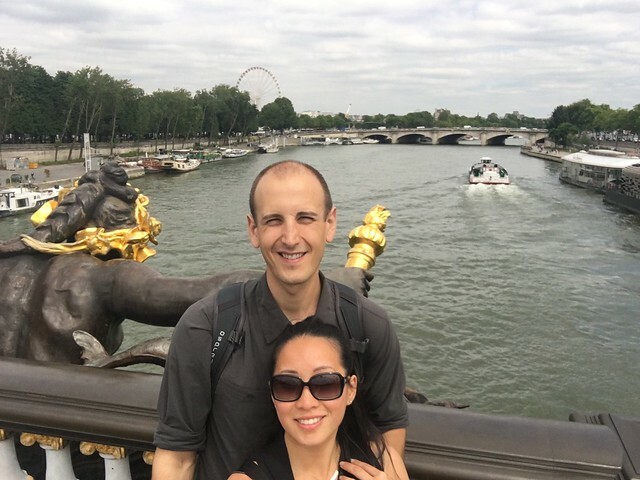 Rachel and Su Ying were friends in elementary school. 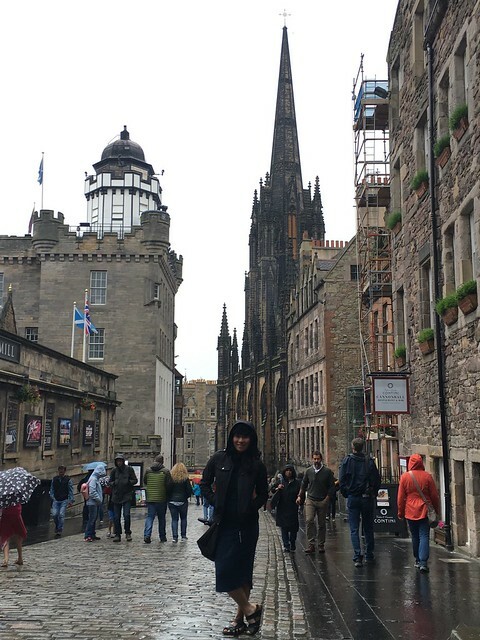 Su Ying had moved to Edinburgh to complete her training as an Anesthesiologist. Sitting, eating, and listening to the two of them catch up, I was getting another glimpse into Rachel’s childhood. Su Ying had just gotten off work that morning so she was tired in a very relatable way. We all agreed it would be nice to stay in and have an early, quiet night. As we talked, we learned that Adri was a big Game of Thrones fan and, like us, was eager to see the final two episodes of the season, the finale for which had just aired the night before. We moved to the living room and Adri set up the TV. Rachel and I had resigned ourselves to waiting a year for this so we were thrilled! Both episodes were epic and perhaps the best so far, even among all seasons. We retired to bed and I stayed up finishing my Iceland entries to the sound of Rachel’s snoring. The next morning, Su Ying made us a quick breakfast of soft boiled eggs before we drove to St. Andrew’s. It was a scenic hour long drive. 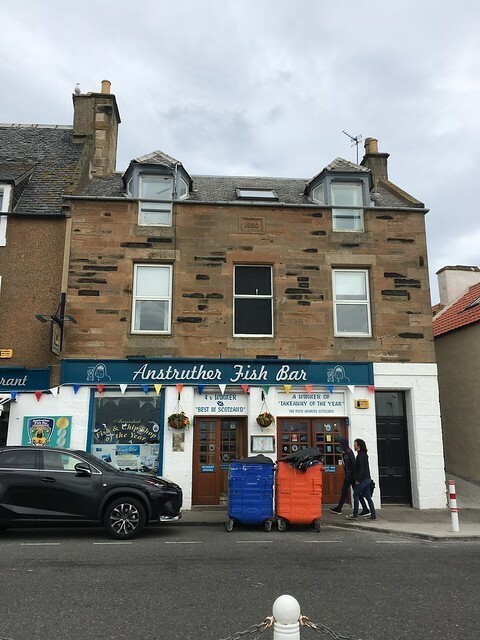 First stop, the famous Anstruther Fish Bar. With Keller in tow, we picked up several orders to go and ate by the dock, overlooking the harbour. The fish was quite nice. 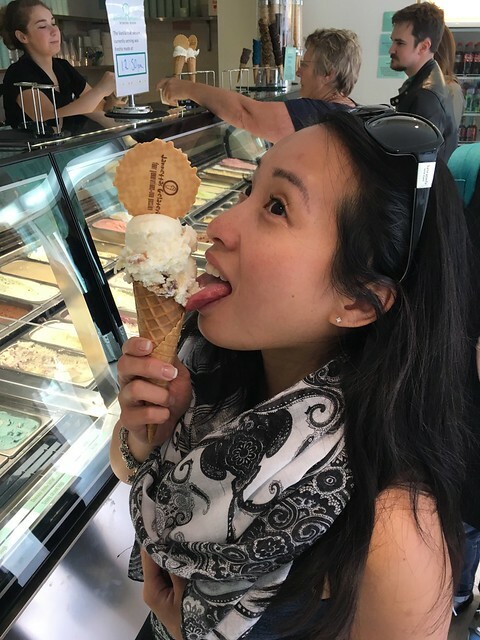 Next stop, Janetta’s Gelateria for the freshest ice cream I’ve ever had. 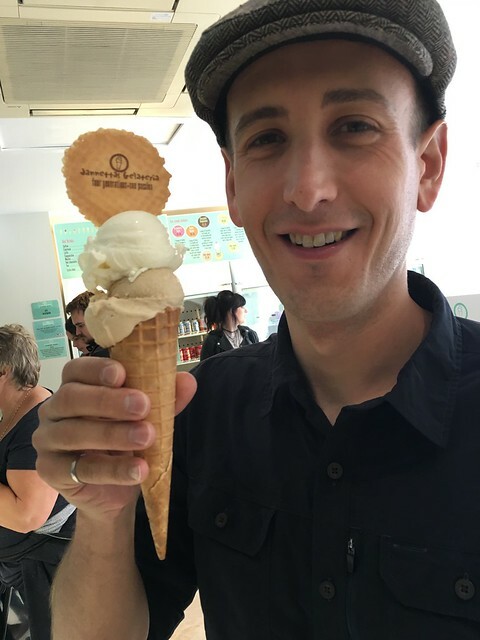 I had a waffle cone with one scoop of coffee and one scoop of vanilla, fresh from the machine. Rachel had the butter pecan. 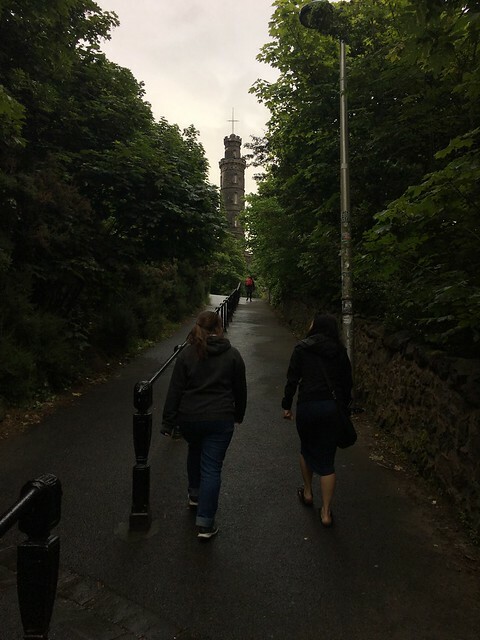 Keller led us down the street to the ruins of St. Andrew’s Cathedral. 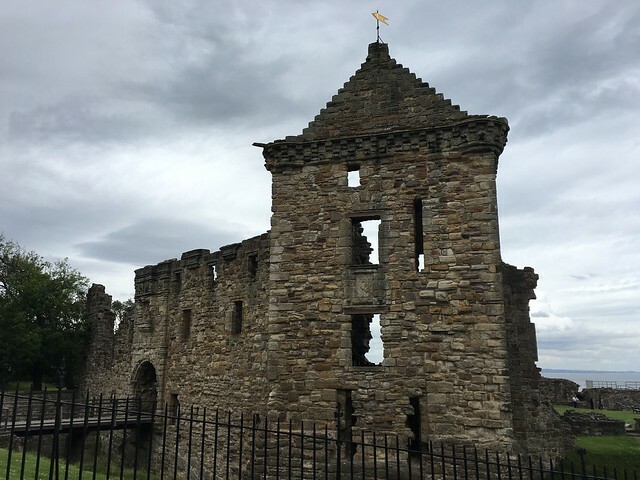 Built in 1158CE, it was the largest church and the centre of Catholicism in Scotland until the Scottish Reformation in the sixteenth century when Scotland largely broke from the Papacy. 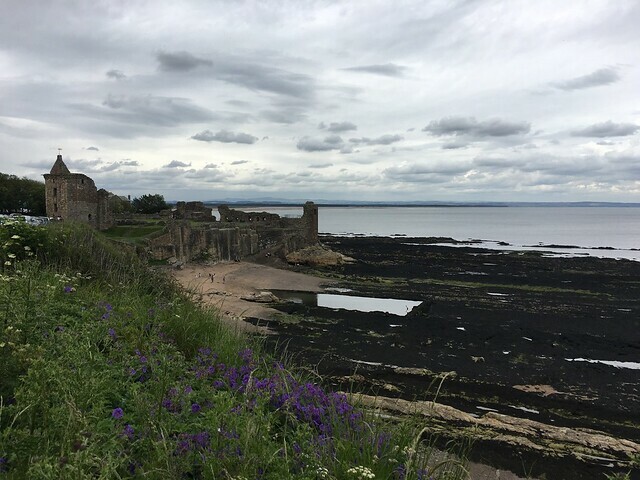 Keller then took us to St. Andrew’s Castle. 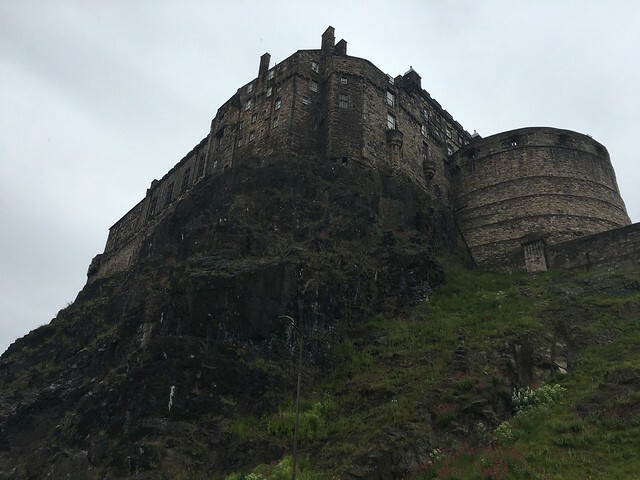 Although rebuilt many times over, the castle was first built around 1200CE and was home to powerful church leaders, Kings, and even as a prison with a notorious dungeon cut out of the rock foundation. We headed back toward Edinburgh, passing the Mecca of golf, St. Andrew’s Links. Golfers have been playing here since the 15th century, making it one of the oldest courses in the world. Although it appeared very prestigious, the grounds themselves were not altogether impressive, at least not from the road. 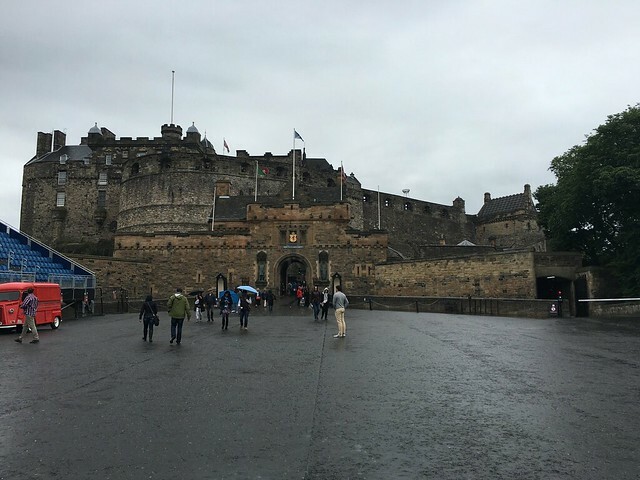 Back in Edinburgh, we parked at the base of Castle Rock under Edinburgh castle. We climbed up the steep stairs where we met Adri. She had been busy working on her thesis throughout the day. Su Ying decided to bring Keller home so we could later go for dinner. 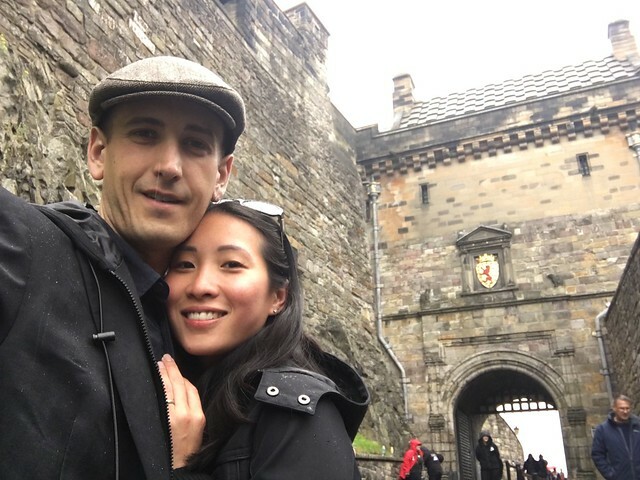 We wandered around the entrance of the old castle before strolling down the royal mile with Adri. 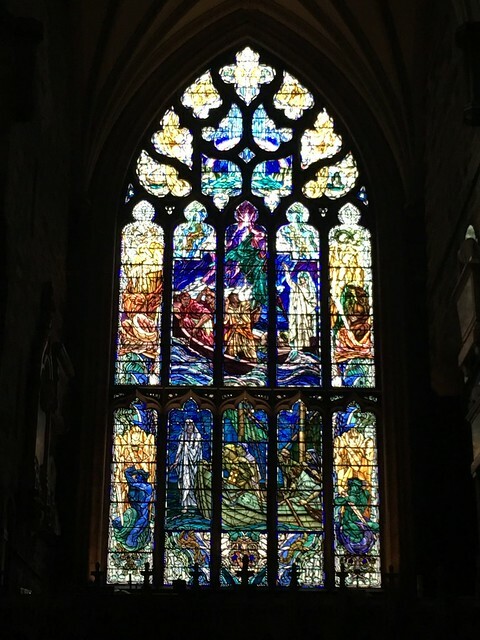 We meandered in and out of shops selling kilts, scarves and tweed, and buttressed churches with intricate stained glass windows and stone walls blackened by time. A piper filled the air with the shrill sound of bagpipes. 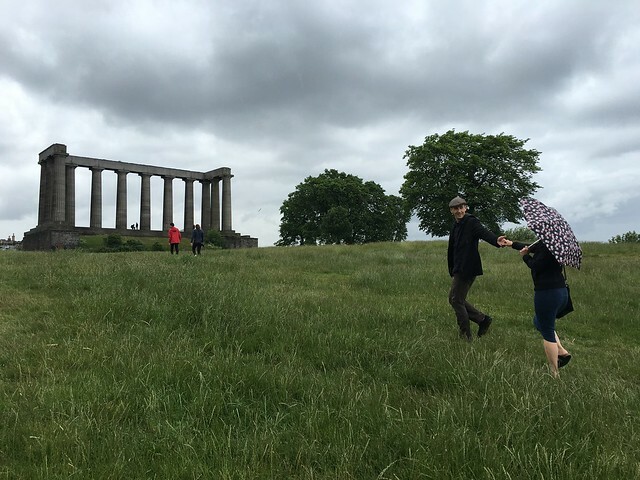 We carried on toward Calton Hill and climbed up for an open view of the city and Arthur’s Seat in Holyrood National Park. It would have been nice to hike Arthur’s Seat, but that will have to wait for a future trip. 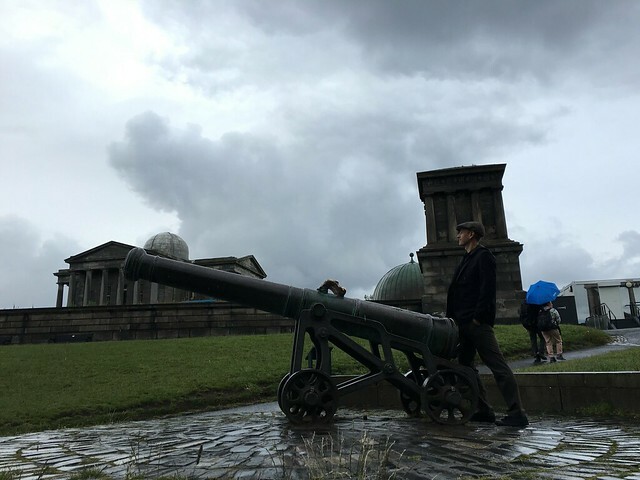 At the top of Calton Hill stood the Scotland National Monument among several other monuments as well as the City Observatory. 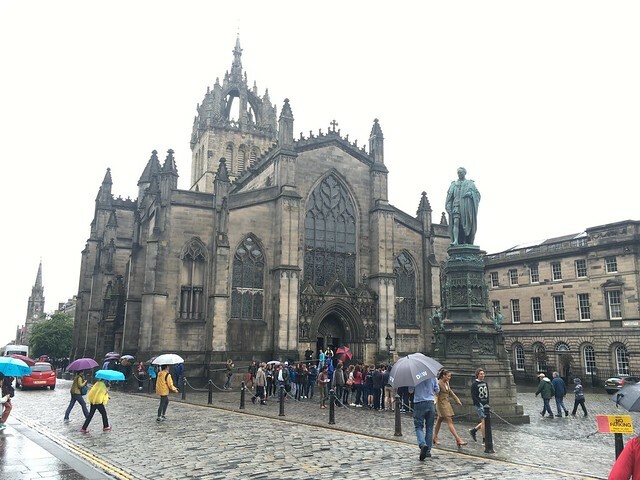 We could see Holyrood Palace, the vacation palace for the British royalty…not bad. 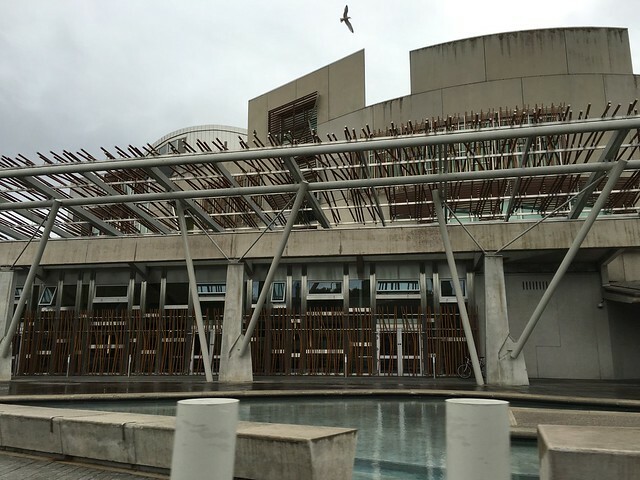 We rejoined Su Ying and drove around the fairly new Scotland Parliament building, very unique and not particularly attractive. We were just killing time, waiting for a table at the famous World’s End pub. Our table still wasn’t ready when we arrived so we had a drink at the bar. Another pint of creamy ale! We talked for a while and just as we started to consider ordering food to our tiny bar table, a proper one opened up. The menu was full of traditional pub food and, of course, haggis. 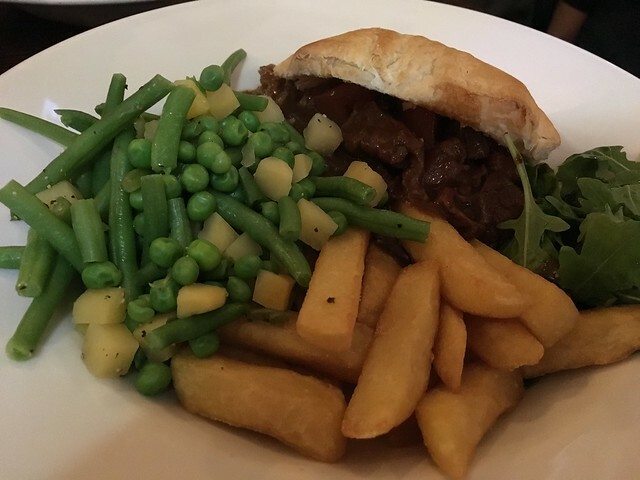 I had the haggis pie and Rachel had the steak and ale pie. Mine was like a shepherd’s pie, but with haggis. It was quite good, especially with the gravy. The salad and boiled peas were dull but not bad with a heavy dash of salt. 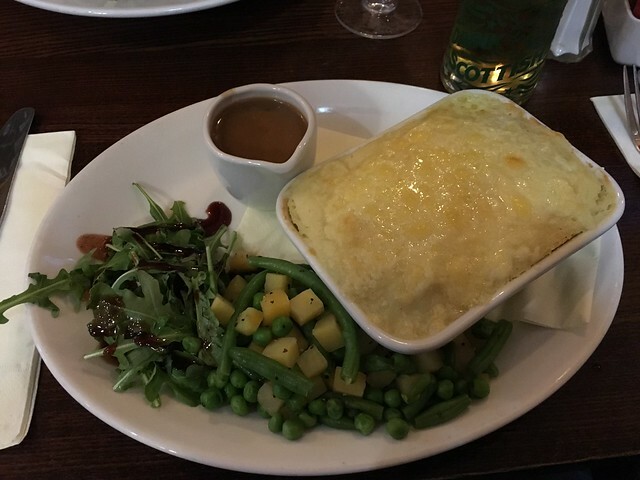 Rachel’s pie was tasty as well with tender meat and crispy chips. Overall good food, and even better company! We returned home to a very excited Keller. He was such a nice dog. So energetic and playful. We packed up and went to bed, tired and satisfied from another day of exploration. 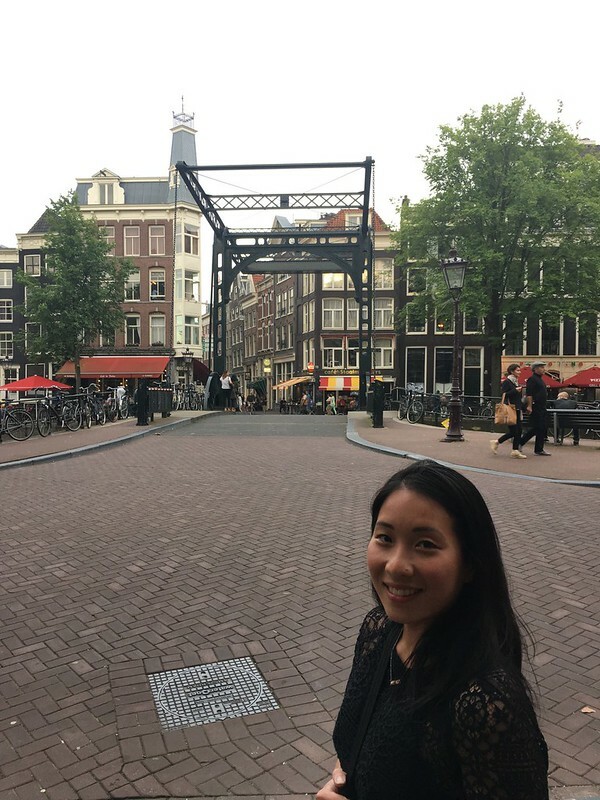 Su Ying woke up the next morning with a terrible head ache that made it impossible for her to go to work, as had been predicted the night before. 😉 We decided the only cure was a nice breakfast at Blue Bear. 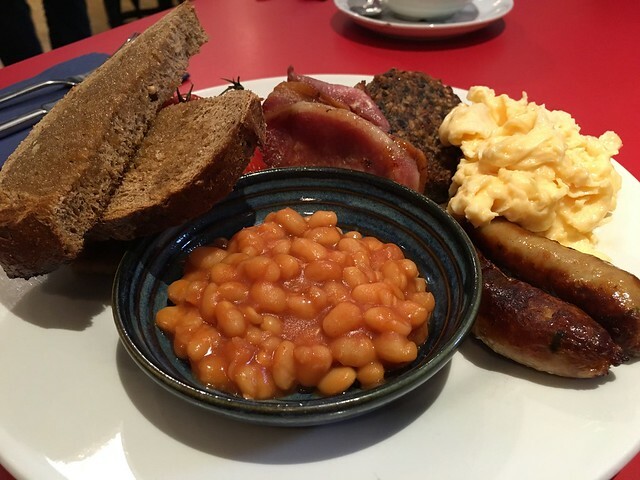 I had an english breakfast with haggis and black pudding. I wanted to try the black pudding but was somewhat dreading it at the same time. I had imagined a gelatinous, irony goo, but was pleasantly surprised by what came. The texture was similar to haggis (ground meat), but was more grainy with a meaty flavour. It was not nearly as irony as I expected. I would gladly have it again but in small portions. 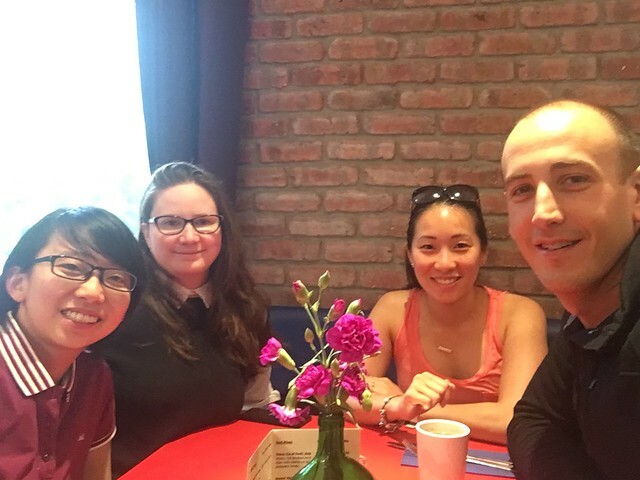 We enjoyed a slow breakfast and made our way back to our car at Su Ying’s. 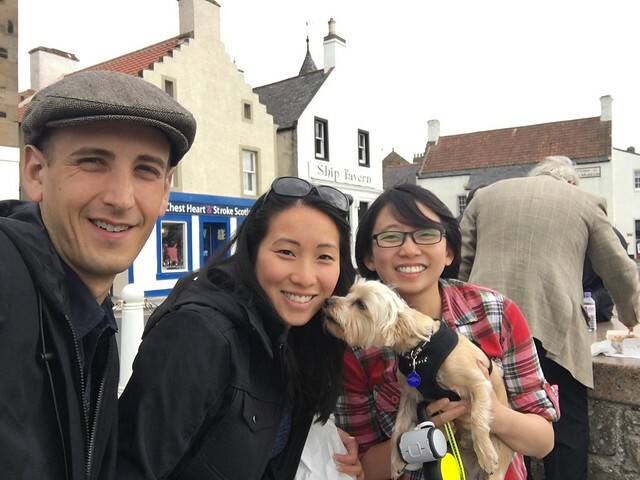 We had such a great time with Su Ying and Adri, but, sadly, we had to say goodbye before heading south to England’s Lake District. We checked in early to our accommodation once we arrived in Bath. The host did an excellent Keith Richards impression, albeit unintentional. He was quite nice though and the townhouse was very modern and clean. We freshened up and got some good recommendations for touring the city. First we walked along a ridge that overlooked the Bath valley. A very nice view. Perhaps I had underestimated this place. We walked down a steep staircase cut into the side of the hill and crossed the River Avon to enter the oldest part of town. Bath had a unique look, with streets lined with buildings made of smooth, beige-coloured Bath stone. Very rich! Of course, it has been a spa town for nearly 2000 years! We initially walked through a shopping area with colourful decorations and inviting stores. Slightly peckish, we couldn’t resist Marks and Spencer’s offer for afternoon tea. Perhaps it would beat the one we had in the Cotswolds. We shared one setting, as well as a green pea and mint soup that looked and smelled too good to pass up. Cheese scones with clotted cream and jam, followed by finger sandwiches of egg salad, ham and mayo, smoked salmon and cream cheese, and roast beef and mustard. Simple, but very tasty and yes, better than the King’s hotel. We inserted the pea soup as a welcome addition to the usual fare. It was quite nice with the mint and not as heavy as the traditional pea soup with pork. The sweets made for a nice finish…strawberry macaroon, cream puff, and a chocolate cupcake. Our temptation served us well. We walked further into the heart of Bath and eventually came to the magnificent Bath Abbey and Roman Baths, seated right next to each other in a stunning courtyard. The Abbey is now an Anglican church following a long history. 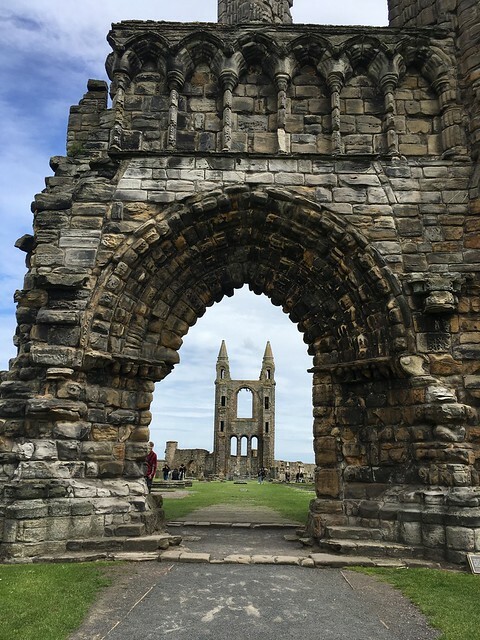 It began as a monastery in the 7th century and was rebuilt in the 12th and 16th centuries to become the buttressed cruciform plan that towers above the surrounding buildings. Apparently it can seat 1200 people. 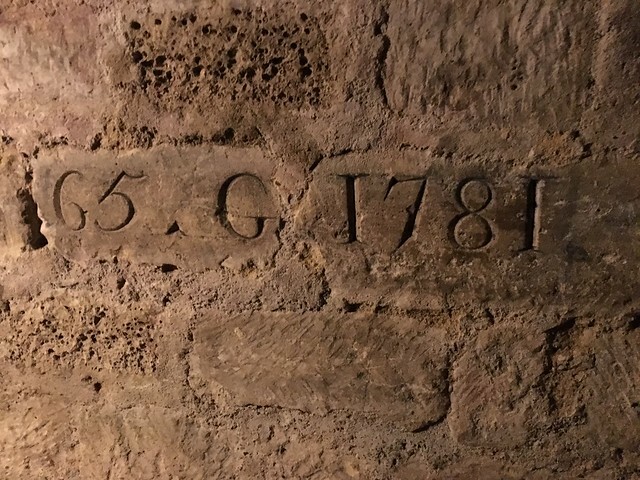 Right next door, the Roman Baths complex contains the ancient baths themselves, a temple, the pump room, and now a museum, from which you can take a tour. 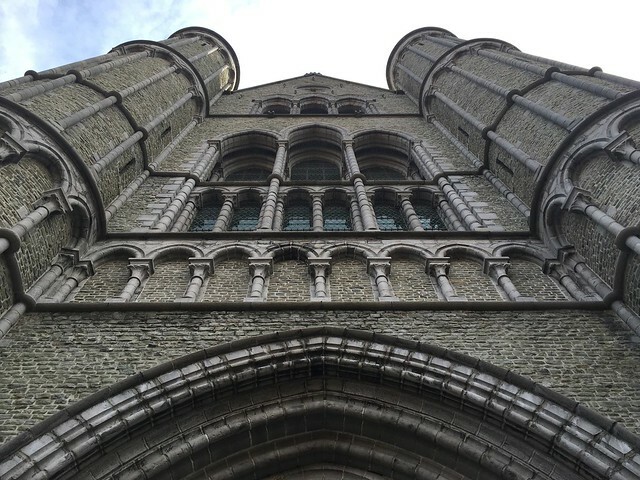 We didn’t do the tour, but read a bit of the history in the front entrance and gift shop, where tourists were buying expensive viles of spring water. The Romans first built the temple here in 60-70CE and then slowly developed the baths over the following 300 years, making use of England’s only natural hot spring. Rain water from the surrounding hills trickles down very deep through the porous limestone where geothermal energy heats it up. The hot water then rises to the surface through fissures and faults. In the seventeenth century, there were claims that the waters had healing properties when pigs were supposedly cured of their leprosy after wading through a muddy spring in the area. Peculiar, but apparently very effective marketing. In the same square, a street performer, presumably called ‘The Pigeon Whisperer,’ tempted tourists to stand as a perch for his many cooing birds. Such an obviously bad idea. As we walked around the square, one unwitting woman gave her donation and all the birds promptly flocked into position. Soon after, we could see the Whisperer dabbing the inevitable poop off the woman’s head and shoulder. Perhaps this was the real show. I know I was entertained! Still sipping my coffee and Rachel’s tea from Marks and Spencer’s, we strolled along to the sound of Simon and Garfunkel’s Sound of Silence, Rolling Stones Painted Black, and various Beatles songs, played by a true street performer. Around the corner was Kingston Parade, another square. This area was much more quiet and there was another talented guitarist sitting in the centre. We sat on a bench and listened to his lovely rendition of Pachelbel’s Canon. It was so peaceful. A cooling breeze blew softly with the sound of seagulls flying above, seemingly in concert with the guitar. The Roman Baths in front of us and the Abbey to the right. This was a memorable moment. 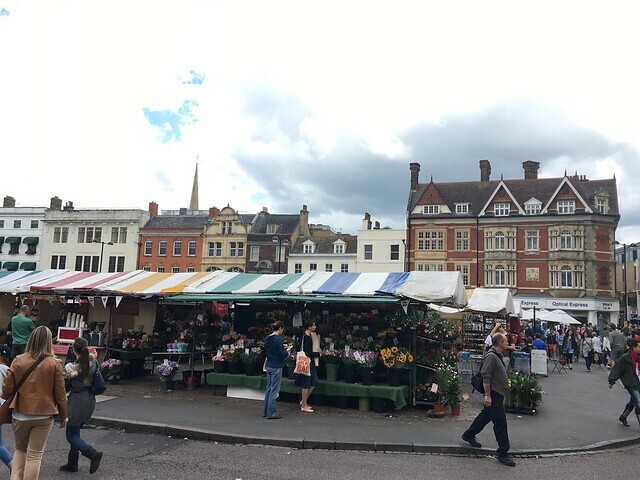 Eventually we continued walking, passed the Jane Austen museum and through antique shops filled with random treasures including old and very well used police batons, telescopes, and furniture. An untold story hidden in each piece. We entered The Circus, a ring of uniform town homes built in the 18th century. It was imagined by the famous Georgian architect, John Wood, who died before it was built. He was apparently convinced that Bath had been the centre of Druid activities, so he designed the ring to match the diameter of Stone Henge. Down the road, we came to The Royal Crescent, another iconic example of Georgian architecture. This crescent of 30 luxurious, terraced town homes was also built in the 18th century but by John Wood’s son. 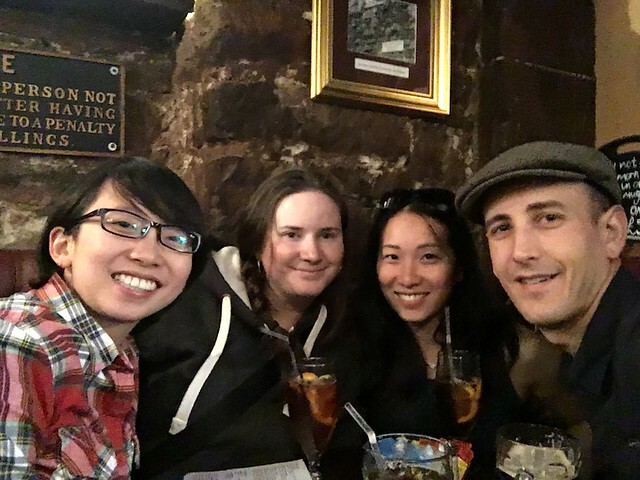 It was time for dinner, so we headed to The Raven, a pub recommended by our host. Famous for their ales and meat pies, we ordered one of each, bangers and mash, and a cider for Rachel. We were a bit reluctant to commit to 2 pies, remembering the terrible pie we endured in London. The food was good, but slightly under seasoned, as we had come to expect. While there, I received a recommendation to visit the Thermae Spa from my friend Percy. She had been there 10 years earlier and said it was amazing. So after dinner we went to check it out. It looked quite nice so we decided to go in the morning before leaving Bath. We woke up early and had a quick breakfast of those tiny individual cereal boxes. I haven’t had cereal like that in years. We packed up, loaded the car, and headed for the spa. So much for budget travelling! We arrived just before opening and there was already a short queue. We got in and paid for the basic 3 hour session, which gave us access to the roof top hot spring pool, steam rooms, and a wading pool. The roof top pool was heavenly. We were among the first to arrive, but it quickly filled up with other tourists, which took away from it a bit. But it was a unique atmosphere, floating in naturally warm water on the roof of a modern building set among the Bath Abbey and old Roman bath complex. A nice way to wake up! We were starting to bump into other guests indicating it was time to move on. One floor down was the steam room, which had three pods with scented steam. Eucalyptus, lemongrass, and lotus flower. This was a real treat. As the pods started to fill up, we shocked our bodies under the cold shower and moved on to the wading pool on the floor below. This was a little disappointing. It was already packed and just felt like a public pool with a current that slowly drifted you around the pool. It would have been nice if we weren’t constantly banging into other tourists. All in all, a very nice experience but too many tourists. I can’t imagine what it would be like at peak hours. We left shortly after the two hour mark and got a quick bite to eat before walking back to the car. We picked up our audio guides and boarded the packed bus to get to the actual site about a mile down the road from the museum and ticket office. To our surprise and despite the volume of people, this turned out to be a real highlight of our time in the UK. The audio guide was excellent. In fact, I wouldn’t recommend the visit without it. The ring of famous stones is set within a dense collection of Neolithic and Bronze Age monuments, all of which are believed to have been constructed between 3000-2000BCE. Earth banks and ditches encircle the famous stone structures with a long avenue stretching to the nearby River Avon. The entire area is dotted with burial mounds, most of which have been relieved of their ancient artifacts. Interestingly, the horseshoe arrangement of the largest stones and the avenue embankment are aligned with the sunrise and sunset of the summer solstice. The largest vertical stones that make up the outer part of the horse shoe are called “sarsens” and are up to 30 feet in height and weigh 25 tons. They support the horizontal “lintels” with intricate mortise and tenon joints. Based on the mineralogy, the stones are not native to the Salisbury plains and must have been brought from Marlborough Downs, about 20 miles away. The smaller stones inside the horse shoe are called blue stones, weigh up to 4 tons and are believed to have come from up to 140miles away. For a long time it was widely believed that Stonehenge was built by the Druids, but carbon dating has shown that it was present about 1000 years before the Druids came to the region. Not much is known about its original builders because they left no written record to tell us who they were, or why and how they built it. We left Stonehenge genuinely impressed and intrigued by the rich and mostly unknown history of our species and this world. We speculated as to the purpose of that site and imagined the dramas that we’ll never know as we drove back to Heathrow. It was time to say goodbye to the UK and bonjour to France. We enjoyed the UK, especially the wonderful people we got to meet and stay with along the way. Chris and Qiu Jiang, Su Ying and Adri, and the many hosts at our random accommodations enriched our experience in so many unique and wonderful ways. The UK was quite a contrast to our first stop in Iceland. From one of the most untouched and exciting landscapes to one of the most tamed and, in many ways, subdued countries, we appreciated both for very different reasons. The UK brought history to life for us. You can reach out and touch it, everywhere. It is charming, diverse, and, if nothing else, so very polite. I have to admit, we did not understand their aversion to salt, but the beer was truly superb. I guess their reputation is deserved on both fronts. Southbound to England’s Lake District, supposedly the most scenic region in the country. As we drove, the dark skies and rain hid the scenery from us. We planned to stop at the Castlerigg Stone Circle and then on to Keswick to hike the Cat Bells. Rick Steves had told me this was a good spot for a day trip. Unfortunately, the dark skies and heavy rain continued and fog largely overtook the quaint villages, narrow lakes, and lush greenery we were driving through. We stopped at the Castlerigg Stone circle and walked across the wet mine field of sheep droppings to the circle of ancient pillars. It is believed to have been constructed during the late Neolithic or early Bronze Age, 3300 to 900BCE. It’s purpose remains unknown, but is thought to have been used for rituals or ceremonies relating to solar and lunar cycles. Although intrigued by the age and mystery, the heavy rain encouraged us to move on. We arrived in Keswick, discouraged by the uncooperative weather. The hike was not meant to be. We remembered Chris had suggested a drive over Wrynose pass so we opted to head there instead, hoping visibility would improve. We followed Google’s directions to Wrynose Pass, which took us through some exceptionally narrow roads. Tree branches and hedges brushed the car as we slowed to a crawl at times. Negotiating with oncoming vehicles sometimes required us to reverse carefully to a widened patch of road. Sometimes we won the right of way. It was fun driving. The sun was finally peaking through and before we knew it, the dark clouds mostly blew away to reveal a beautiful blue sky! We continued down the narrow winding roads, up and down rolling hills overgrown with thick vegetation and bound by moss covered stone walls. We ended up deep in the woods and came to a steep hill paved with sharp, jagged shale unlikely to play nicely with our car’s tires. Maybe Google meant for us to take the previous turn? We double backed and veered left. Soon we passed through a creepy, seemingly abandoned farm noting it would be a perfect set for a horror movie. We promptly hit a dead end so we turned around only to find the singular route through the old farm was now blocked with a large tractor. Odd, we had just driven through there and the farm was still dead quiet with no sign of life. The car slowly came to a stop. We looked at each other and laughed nervously. The horror set suddenly had all the potential of a horror scene. I valiantly offered to stay with the car so Rachel could go search for the operator of that tractor. She politely declined. As I timidly stepped out of the car, a man appeared from around the corner. He wasn’t armed…promising. My “hello” was met with a long silence. ‘Please don’t tell me I have a pretty mouth,’ was repeating over and over in my head. He finally responded with a reasonably friendly hello of his own. I told him we had made a wrong turn and asked him to move his tractor so we could get by. He reluctantly agreed and, in a reassuring gesture, offered us directions. The ‘horror’ was over. It took two more stops for directions, but we made it to Wrynose Pass. Signs warned of narrow roads up to 30% grade. That is steep…very steep. The steepest in all of England, actually (according to the signs). But it was gorgeous and so much fun to drive! Lime green grass carpeted mountains with a single lane road switching sharply back and forth, climbing aggressively from the valley floor to the top of the pass and back down the other side. There it continued to Hardknot Pass, which is more or less a repeat of the same. All along the way, ancient stone walls divided the land and lazy sheep stared judgingly at the cars struggling up the hills. Waterfalls were everywhere, flowing the heavy rain water to the valley below. We pushed our little car over Wrynose Pass and just over Hardknot Pass where we turned around in a thirty-point-turn with sloping mountain on one side and sheer cliff on the other. It was time to eat. Chris had mentioned there is a pub at the base of Wrynose pass that had excellent sandwiches. We came to the Three Shires Inn and Pub as we drove out of the pass and figured this must be it. We pulled in and although we didn’t see any sandwiches, the menu looked good. We started with a creamy broccoli and blue cheese soup. A winning combo! I had locally made pork, mango and stilton sausages with chips. The sausages were among the best I’ve had…ever. Rachel had lamb and mashed sweet potato, which was alright but a little too gamey for my liking. We drove through more pretty landscapes of mountains, lakes, and woods, with cute inns and inviting restaurants. We reached our home for the night. The Rose Cottage. Built in the 1700s, it showed its age, but was well kept by a friendly master potter named Iain. The cottage had been in his family for generations. 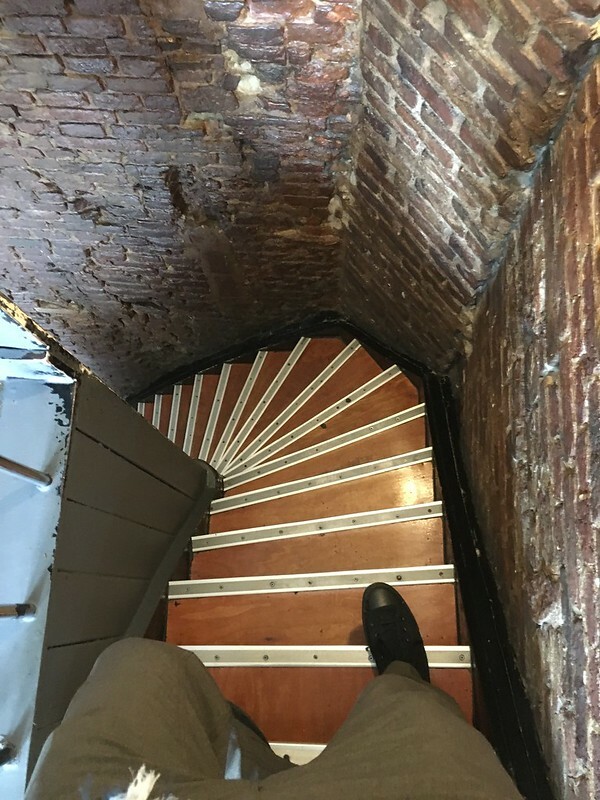 He showed us to our room, up a narrow ladder of a staircase and down a crooked hallway. This was our first accommodation with a private bathroom. What a treat! We were quite tired so we had an early night, drifting to sleep with the sound of birds chirping outside. Iain made us a nice English breakfast the next morning. We ate and talked and ended up buying a piece of his pottery before we left. He had an appointment in town so we all left by 9am. Back on the road for a 3-4 hour drive to the Cotswolds, the region that supposedly defines quaint. It is a region of Gloucestershire made up of many small towns that were once the wealthy centre of the woolen industry. When that industry collapsed, the homes were left in disrepair. Time passed, transforming the region into the gracefully dilapidated buildings and homes of today. We arrived in Chipping Campden just in time for afternoon tea at the King’s Hotel. The town, the hotel, everything was very quiet. We took a seat at a small wooden table in forest green wing-back chairs and made our selections. Earl grey for me and peppermint for Rachel. Shortly after the tea arrived, the waitress brought us a tiered tray of scones, clotted cream and jam, finger sandwiches and sweets. The raisin scones weren’t bad and the cream was nice but desperately needed salt. The jam was jarred and more of a jelly than the fresh chunky jam we had hoped for. On to the sandwiches. Cucumber with mayo, smoked salmon with cream cheese, and roast beef with mustard. A little dull…alright, very dull. 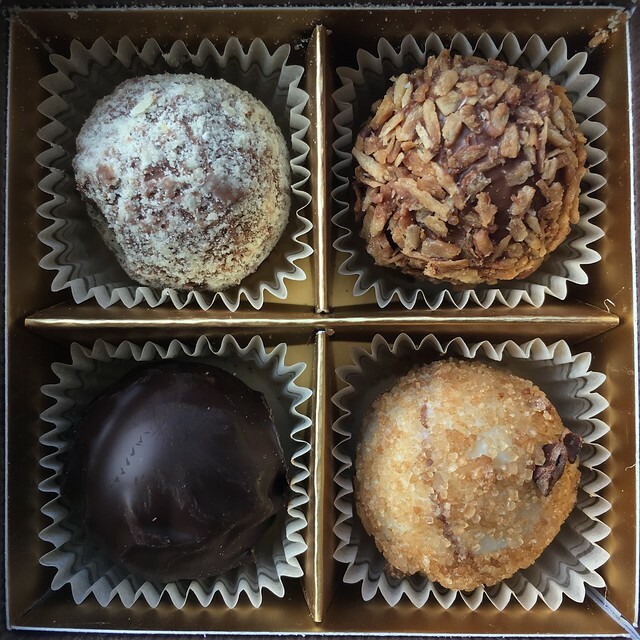 The sweets were consistent with the rest. Not bad, but just not that good either. Lemon poppy seed loaf, chocolate cake, and strawberry mousse. We’ve had much, much better. Disappointing because this just seemed like the perfect place for it. 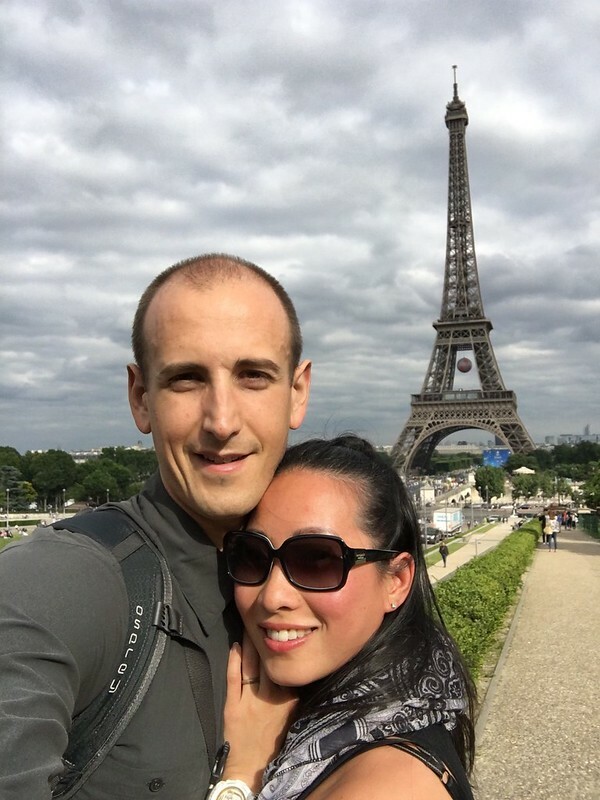 We finished our tea and, eager to improve on our first impression, we wandered around town. It was nice. Did I say quaint yet? It’s very quaint. It is unique and even enchanting to some degree with slanted buildings, sunken roofs, vine covered stone walls, solid wooden doors and pretty flowers. But I think we somehow expected more wandering through those streets. Perhaps more cafes, antique shops, signs of local life? We drove on to the next village, Stow-on-the-Wold. 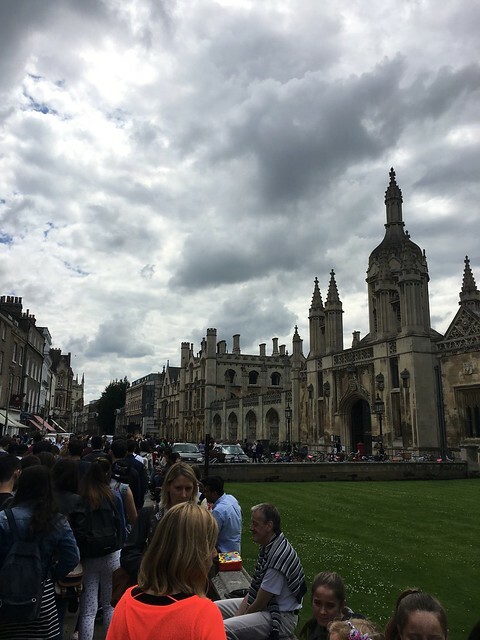 It was very much like Chipping Campden but utterly bursting with tourists. 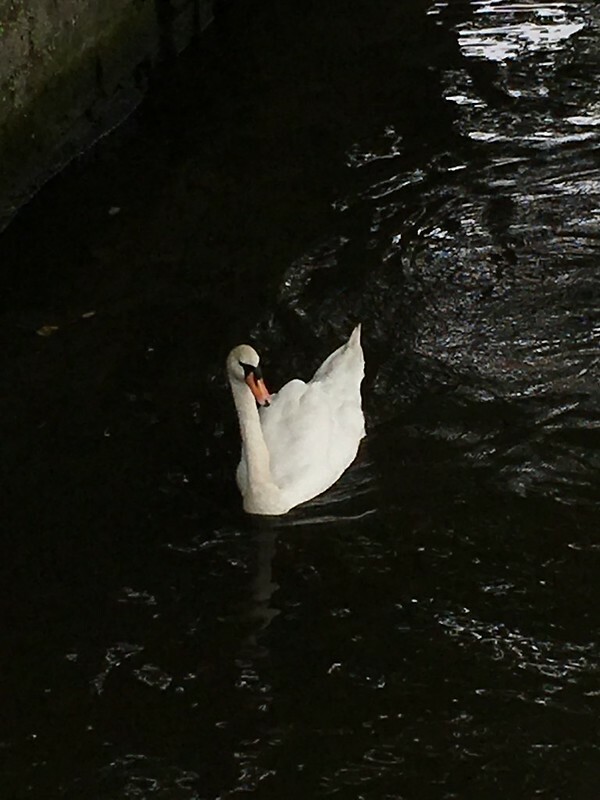 So, on we went to Upper and Lower Slaughter. These were nice areas. 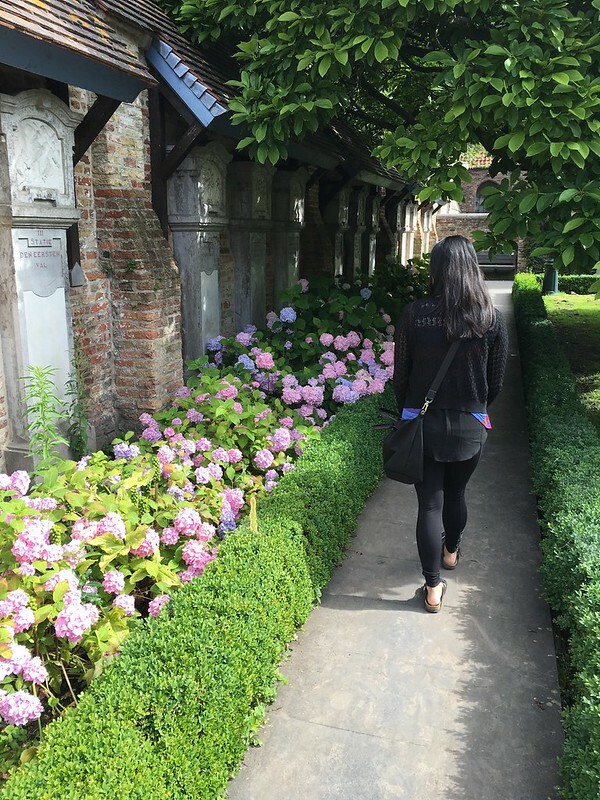 There were canals running through the towns with stone bridges and manicured gardens. A leisurely stroll would have been fun, but we opted to drive slowly, stopping occasionally for a picture. It had been a weak start, but we were finally seeing the beauty of these enchanting towns. We decided to head to the WoodStanway Farmhouse where we would be staying the night. It was another fun drive through narrow, canopied roads. 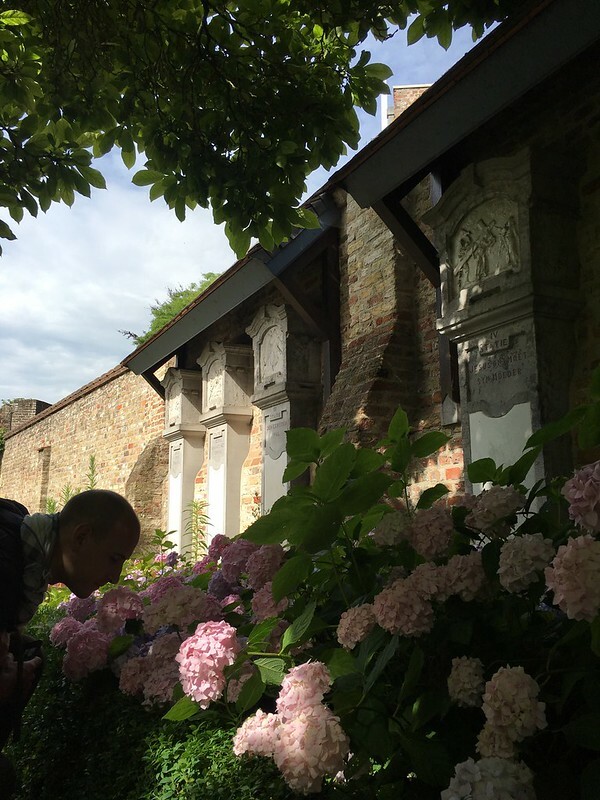 We arrived at the 17th century home where we met the caretaker, Maggie. Before being introduced to her very friendly and very old dog, she warned me to take off my hat because the dog doesn’t like hats. We won the approval of the dog so Maggie took us to our room up a wide spiral staircase and down a crooked hallway. The room was big with creaky wooden floors, antique furniture, and an en suite complete with a bath tub. We freshened up and left to check out Stanton before dinner. Stanton was off the beaten path and appeared quite affluent. Huge homes, elegantly refurbished to very effectively preserve the character of the old. The gardens and lawns looked to be full time jobs in themselves, with many owners (or their gardeners) out working away as we drove by after 7pm. It was equally beautiful to the Slaughters and a nice way to end our tour of the Cotswold towns. We made our way to the The Pheasant Inn Pub to eat and start, planning our coming days in Europe. 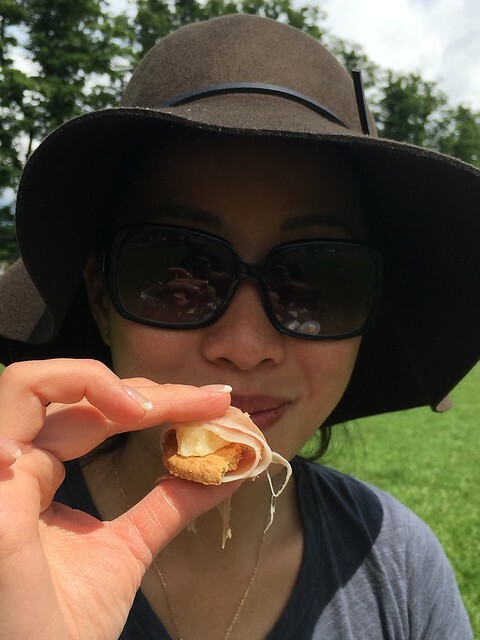 We started with the fried brie, which was nothing short of a spiritual experience. I had the British chicken curry and Rachel had tomato soup. Both were quite nice, but the curry was my favourite. Distinctly different from Indian curries but nicely spiced and seasoned in its own right. We sketched out a rough itinerary for Europe over ale and cider. The next morning Maggie prepared us an English breakfast. We ate in an old dining room as we talked and got to know her a little bit. She explained to us that the several hundred acres of surrounding land is owned by an Earl and only leased to the locals. Some of the furniture in the house had been there for quite some time, including an old coal burning stove. It was converted to burn oil in the mid 20th century and, although it still works, it is no longer used because it smells up the whole house. She also explained that she voted to leave the EU. She was the first person we met in that camp so it was interesting to get her take on it. After breakfast we packed up and said goodbye to Maggie, then I took my hat off and said goodbye to her dog. Next stop, Bath. Turning 32 ain’t too bad 🥰 Thank you for a great day guys! Thank you Gong Gong, Mama, Ee Ee @kathleenkok and Ah Ku @_jarrelk for organizing my birthday party in Malaysia ! It was so nice to introduce Oliver to our family and friends in Malaysia. He’s is very loved and a very lucky boy !